The prospect of having to be at school for four am is never usually one that would appeal to staff, students or parents alike. However, today it is worth it; today we flly to the U S of A. Stood in the car park with street lamps illuminating the tired yet wired faces we loaded our luggage onto the coach. 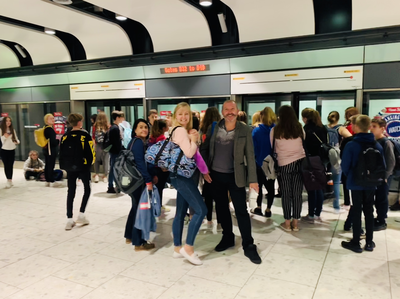 After the hugs, ‘have fun’s and ‘love you’s’ we were off and enroute to Heathrow...L.A.X....here we come! 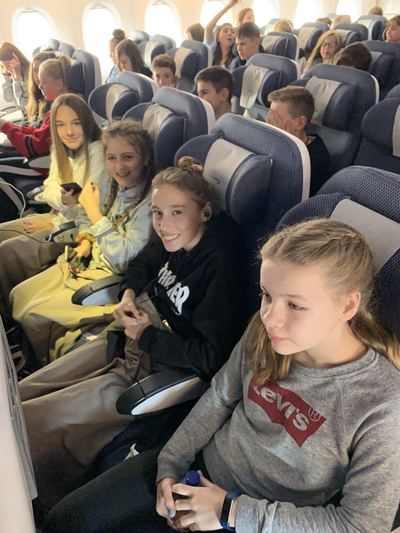 The coach journey was swift and eerily quiet, as staff we are as yet unsure if this is the calm before the storm and that we are being lulled into a false sense of security....we hope not! 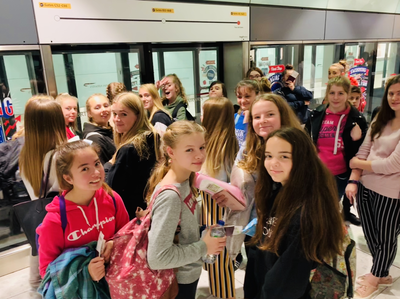 Check in and security go smoothly, after a few purchases in the departure lounge we are through the gate and on board in no time. 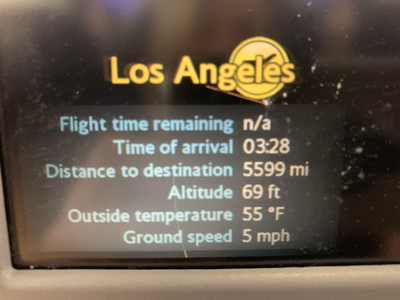 Unfortunately, this is where we sit for longer than expected as we are introduced to the flight crew and informed of a delay in take off. 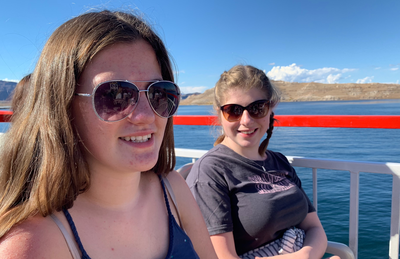 It is after an hour of being sat amongst our Claverham holidaymakers that we start to realise that we are are not being lulled but all is indeed calm. We have yet another large school party who are doing themselves proud and setting a fine example. 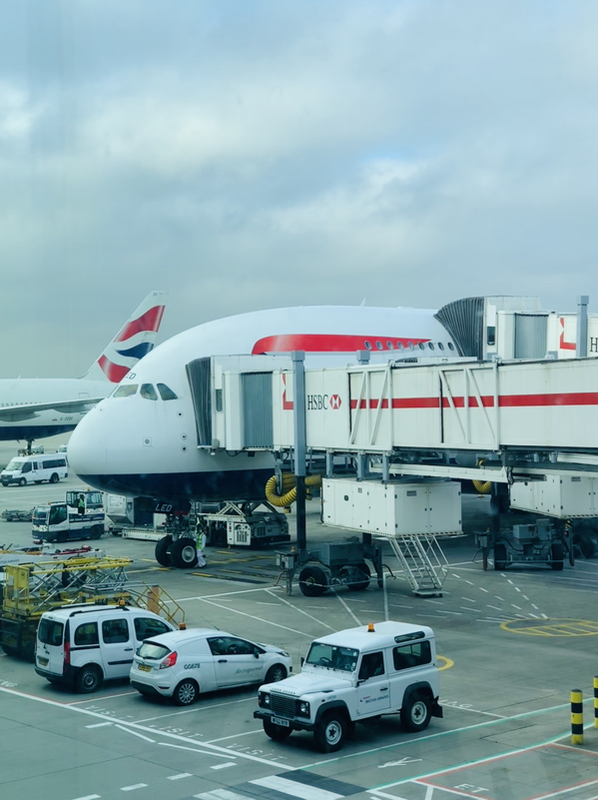 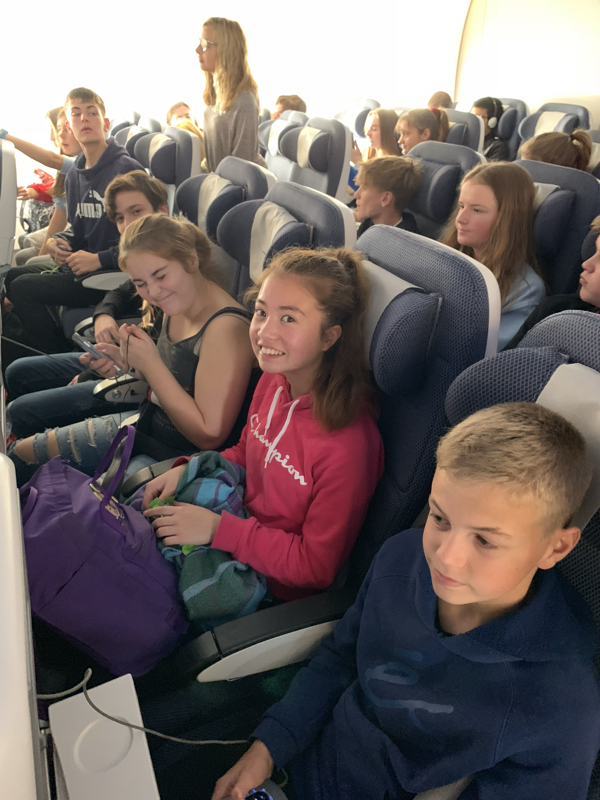 Already we are confident that the flight attendants will be complimenting us on our fantastically well behaved and polite students before we disembark. Once off the plane we were reunited with our guide from previous trips, Evan, and made our way to the hotel. 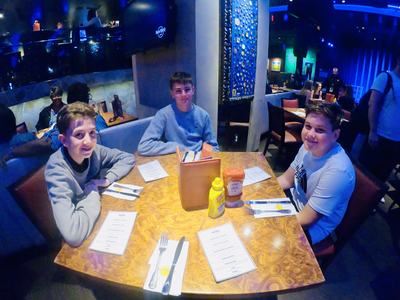 A quick freshen up and we were making our way to the Hard Rock Cafe for dinner. The food went down well and the tiredness kicked in soon after. A short walk back to our hotel and an early night for all in order to recharge the batteries for more fun tomorrow! 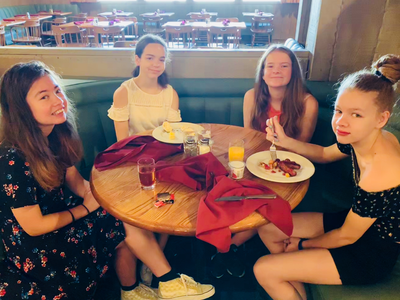 After the previous night a 6.15am wake up call was a well deserved lie in! 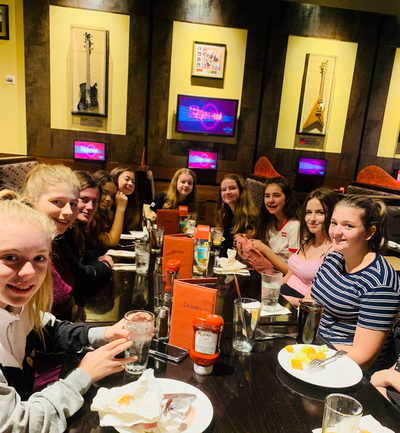 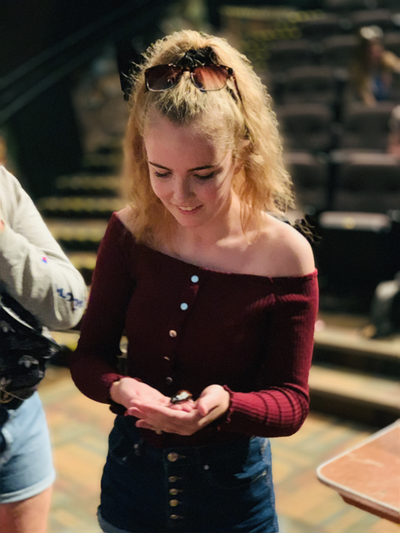 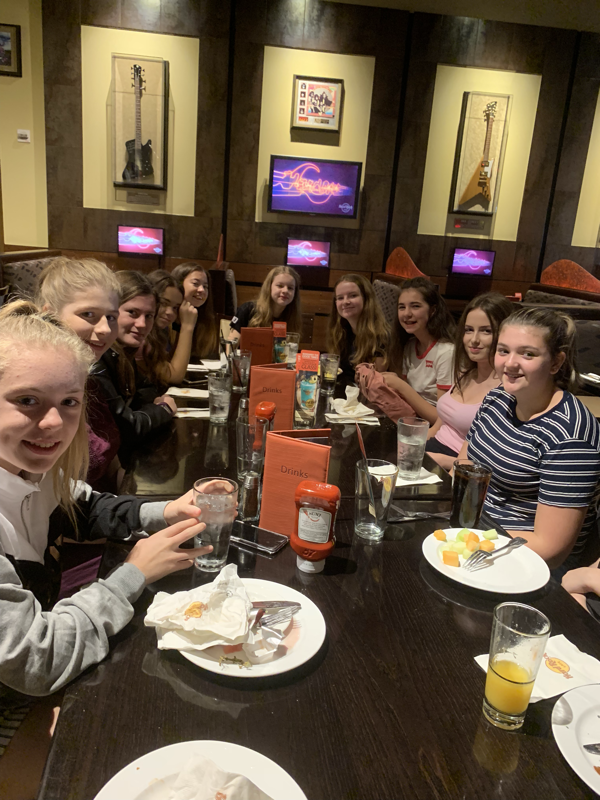 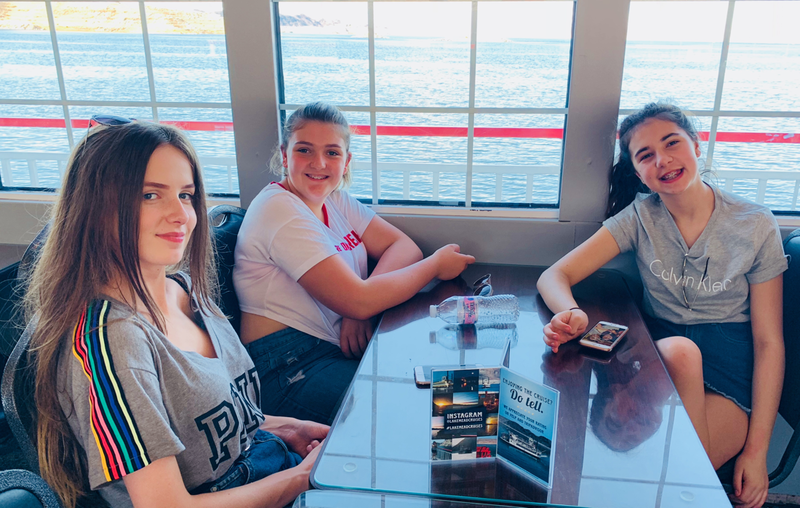 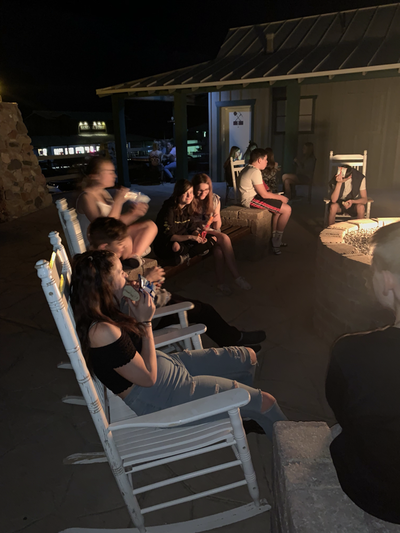 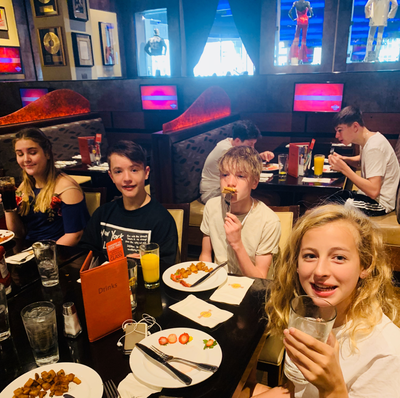 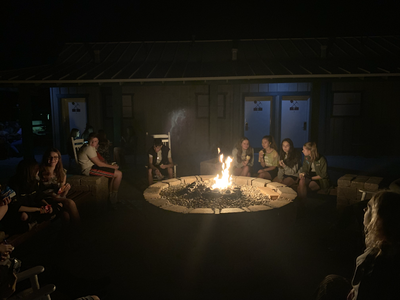 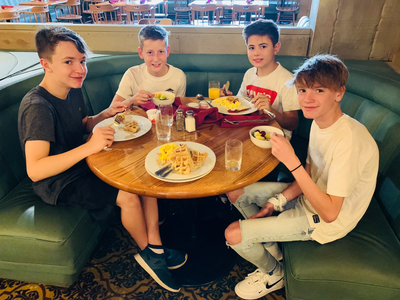 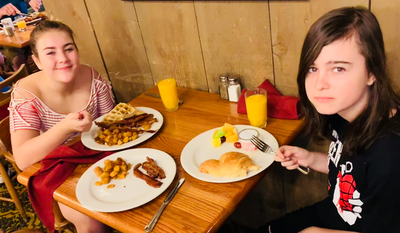 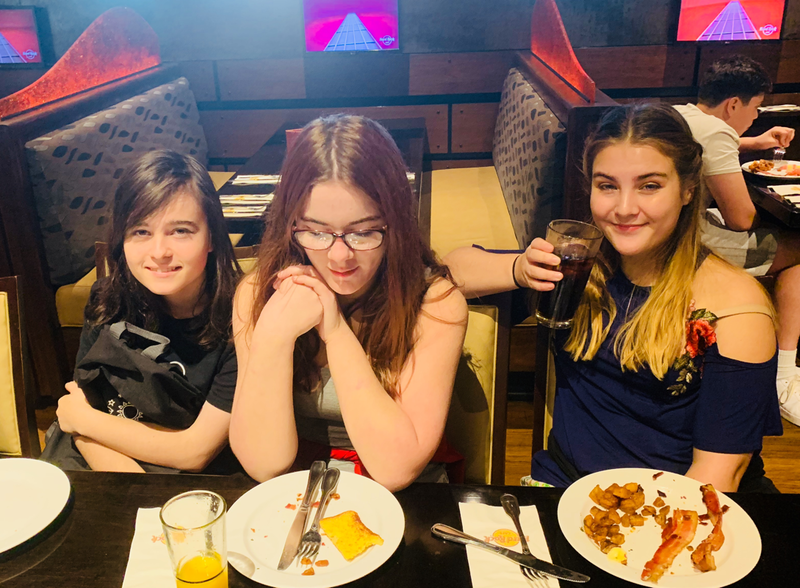 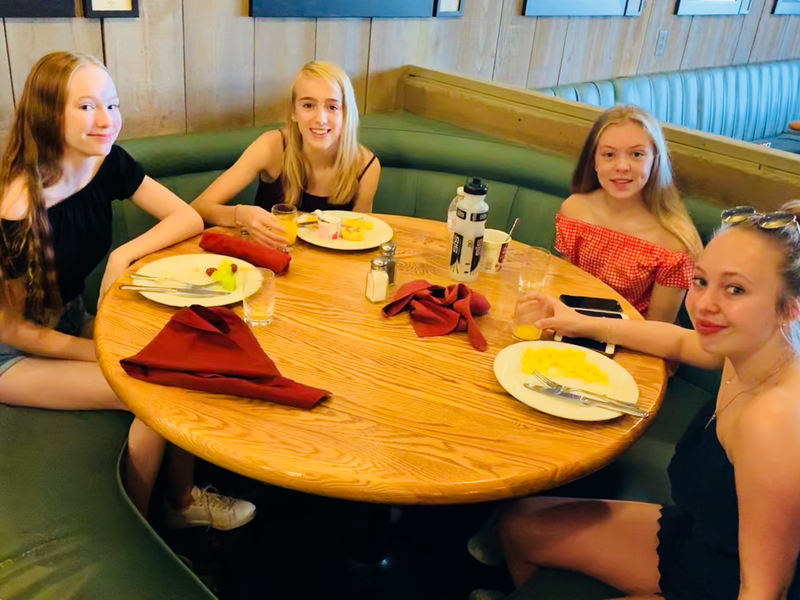 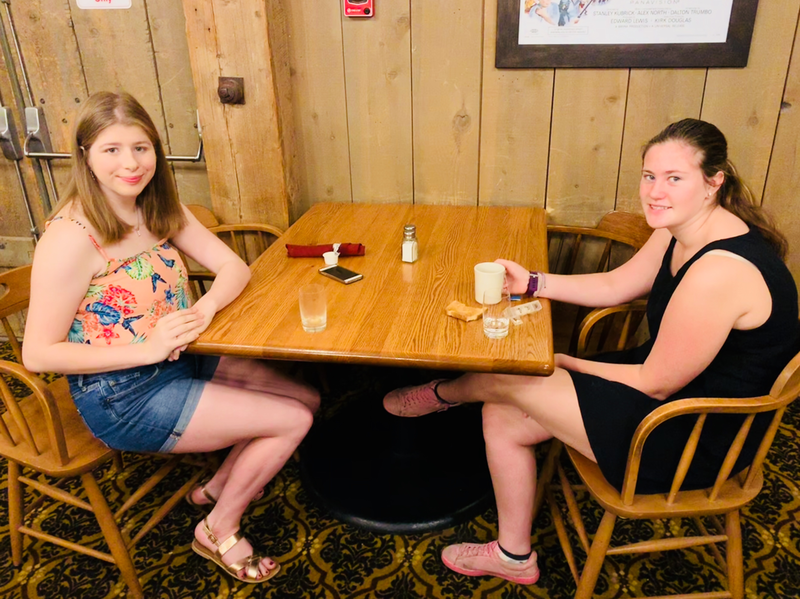 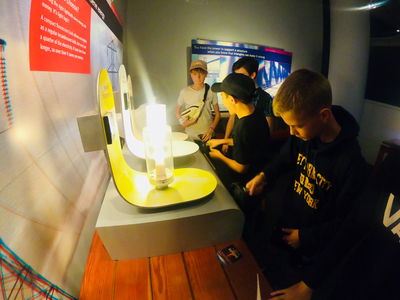 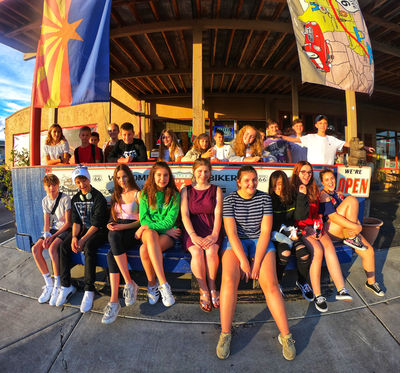 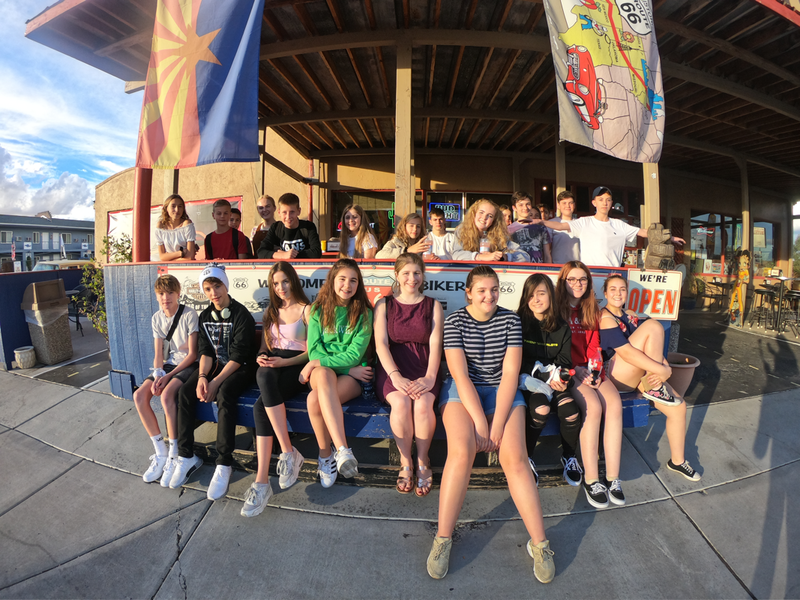 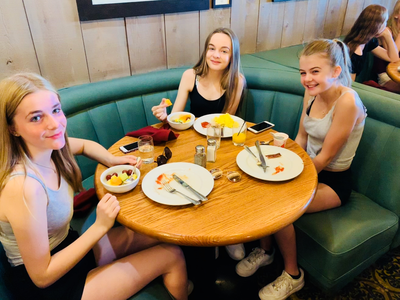 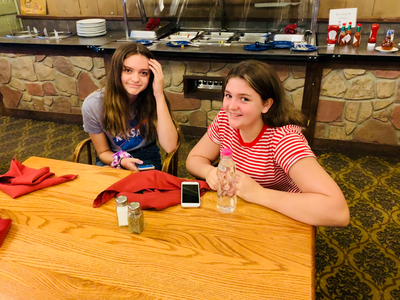 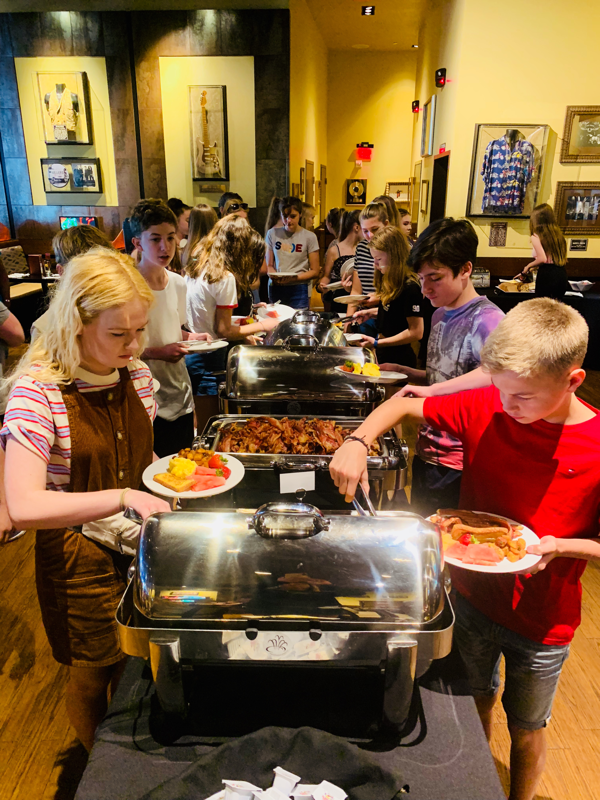 The group enjoyed their first American breakfast and marvelled at the bagel cutter….apparently there may be a few purchased for their homes upon their return! James, our guide for the just the day, met with us at 8am to take us on our tour of Sunset Boulevard. 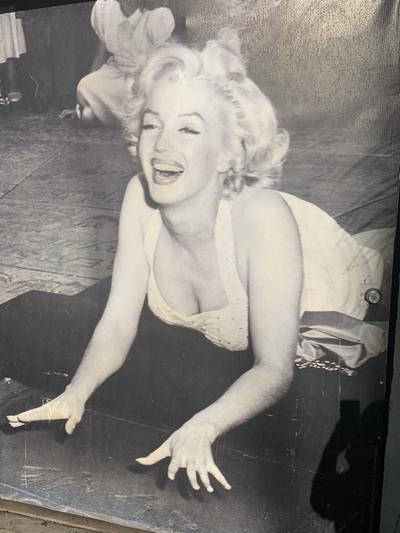 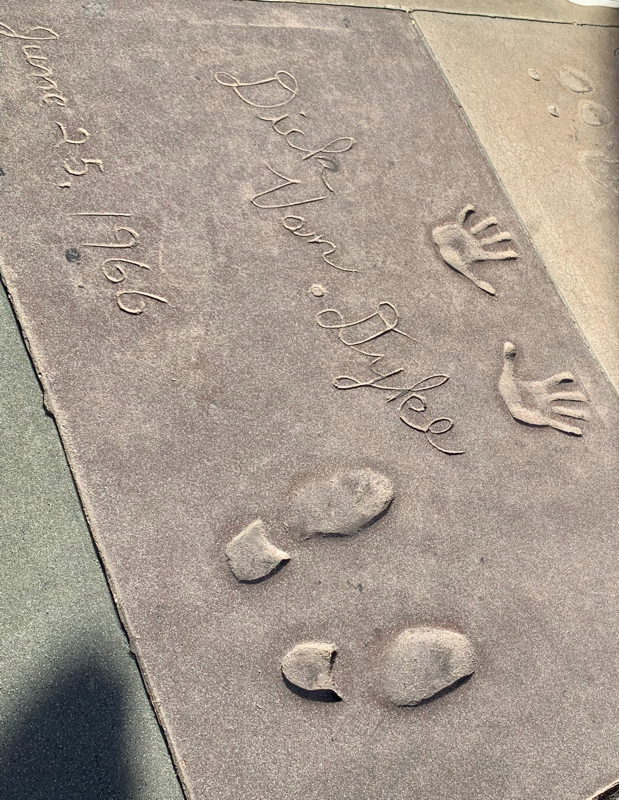 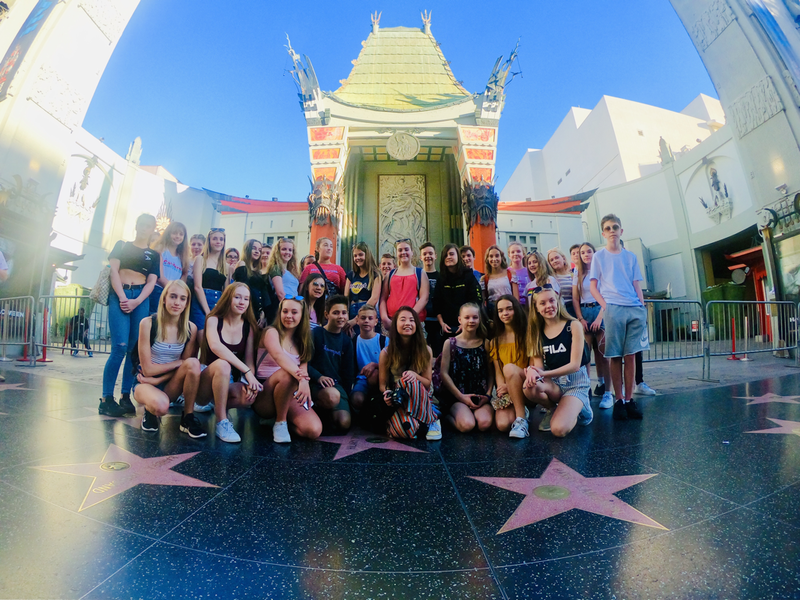 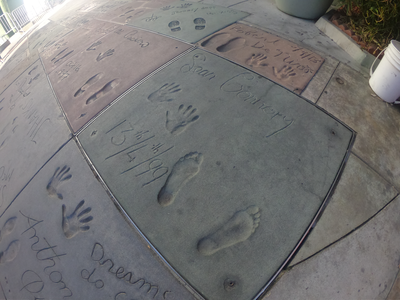 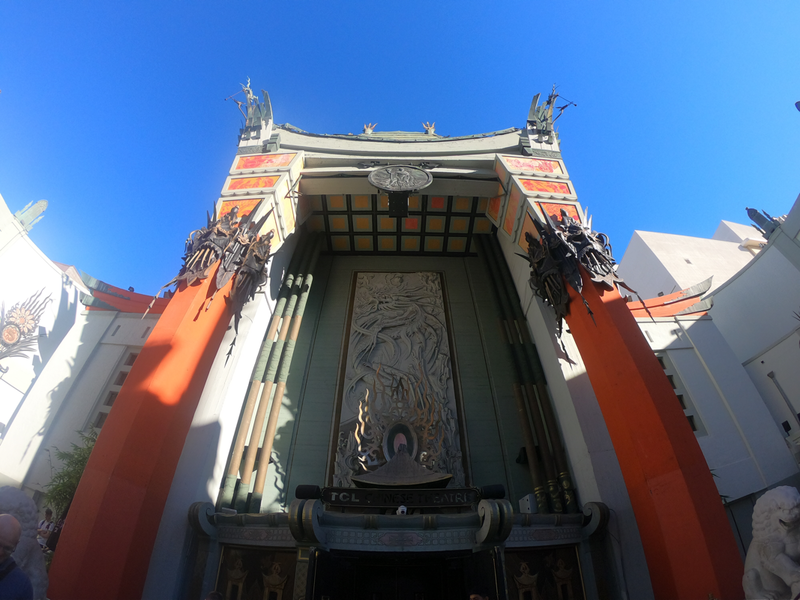 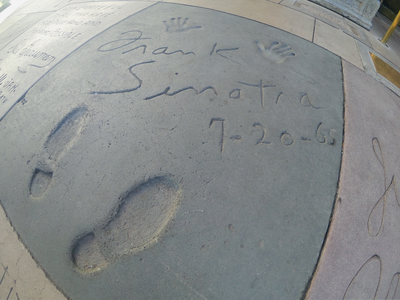 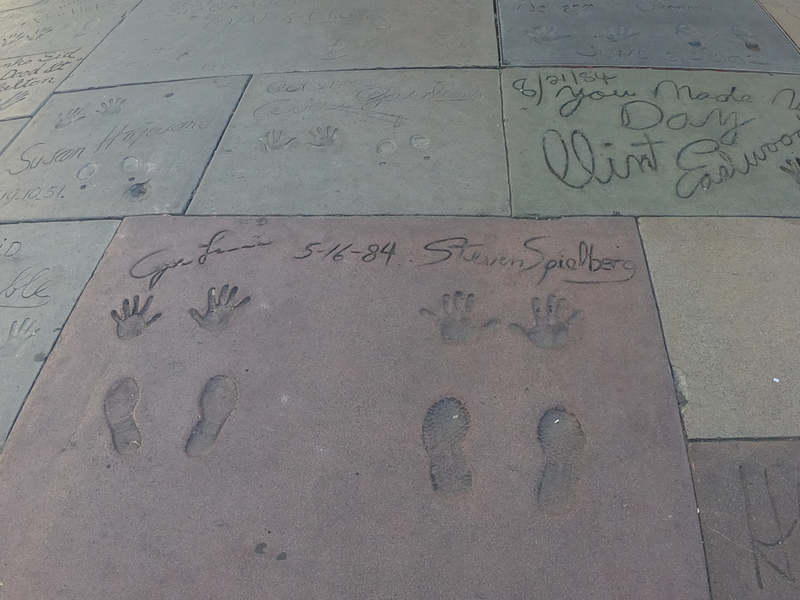 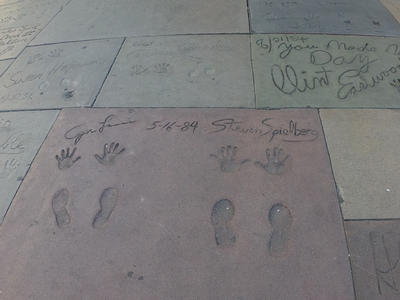 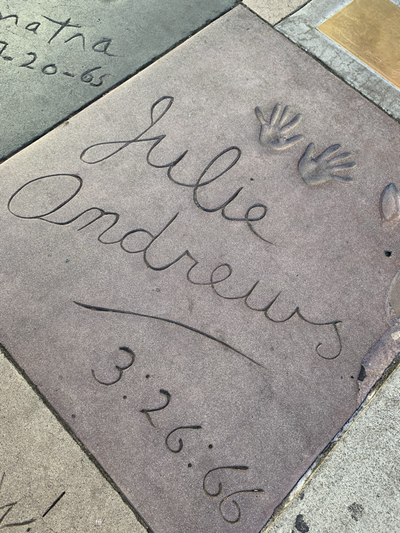 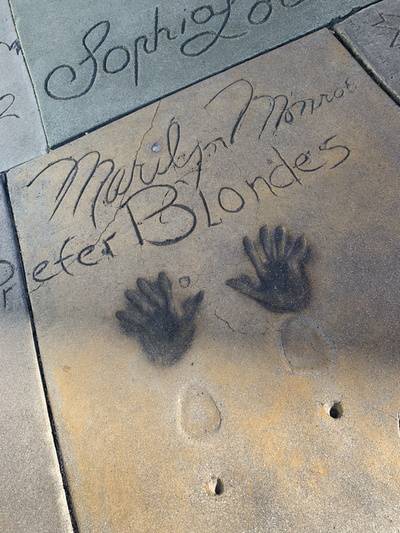 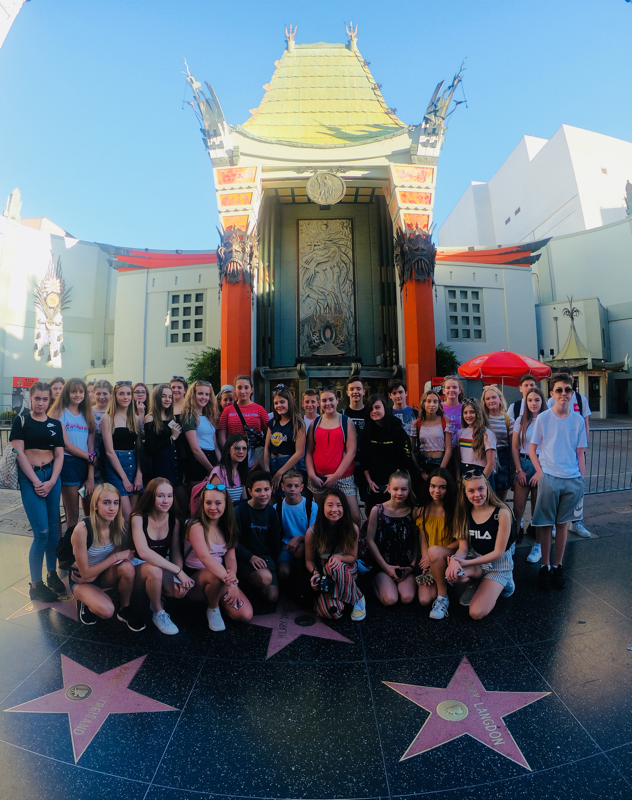 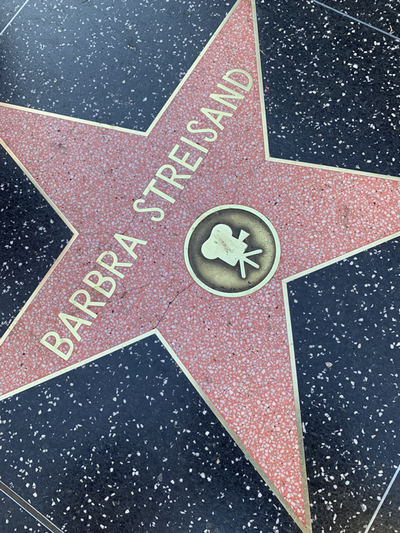 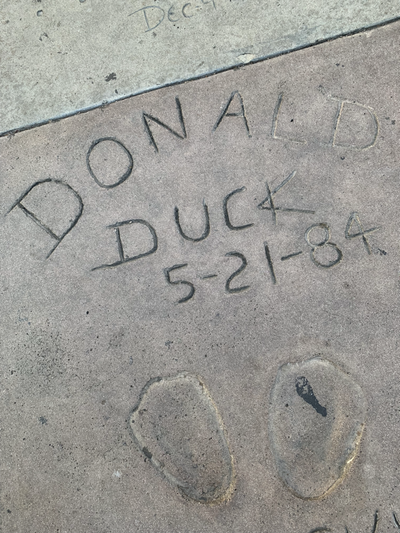 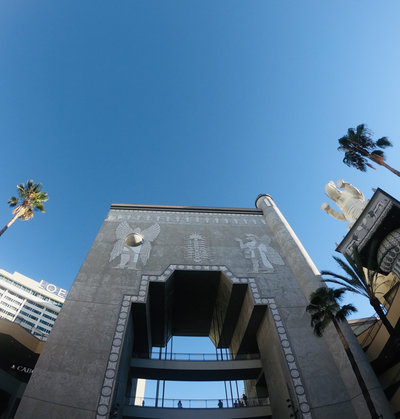 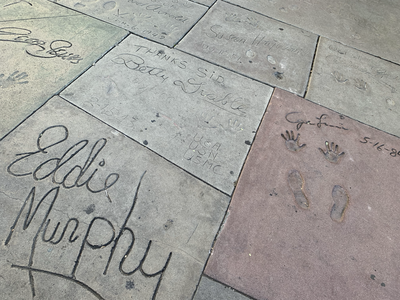 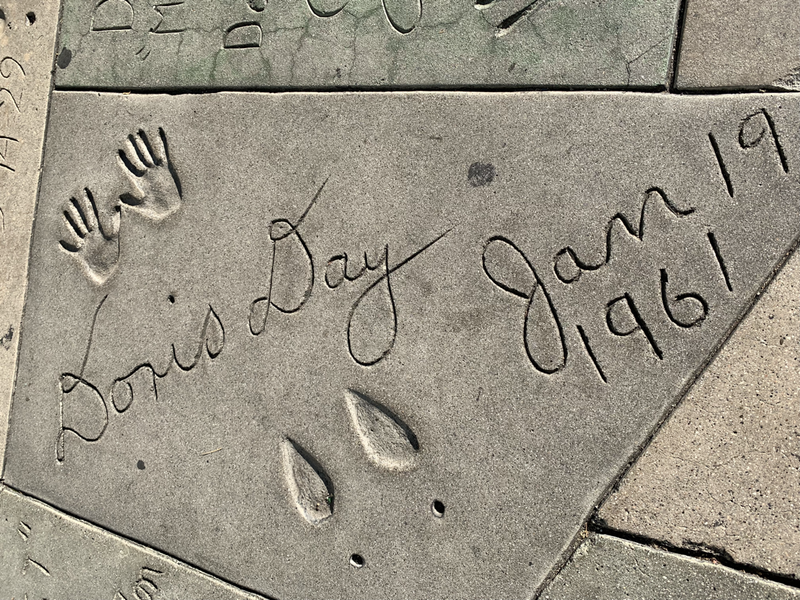 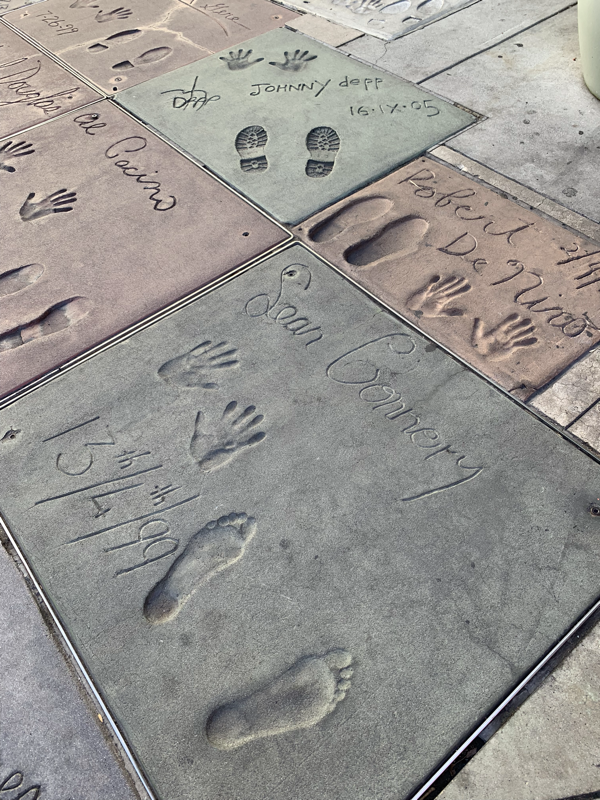 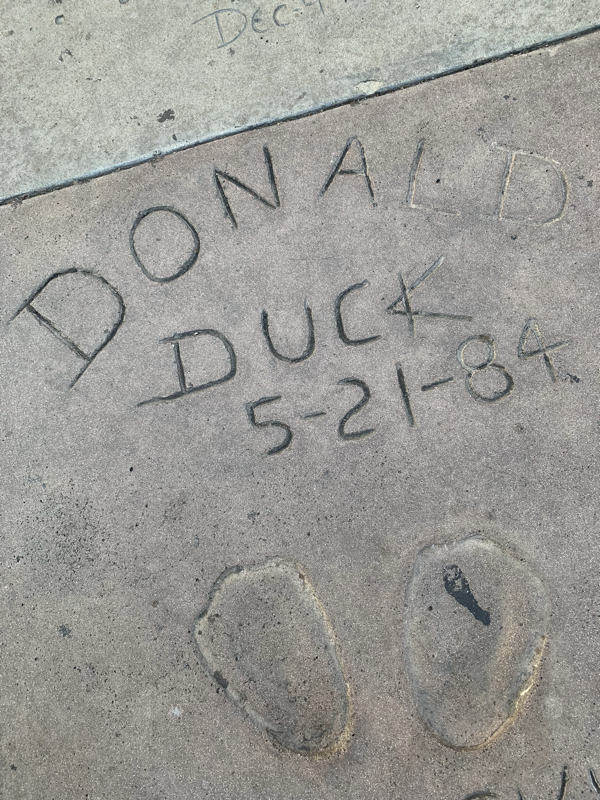 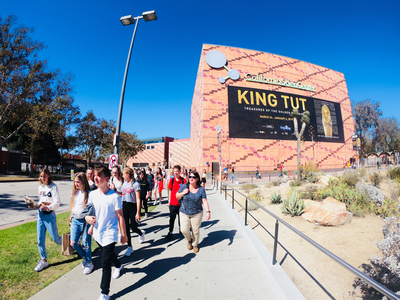 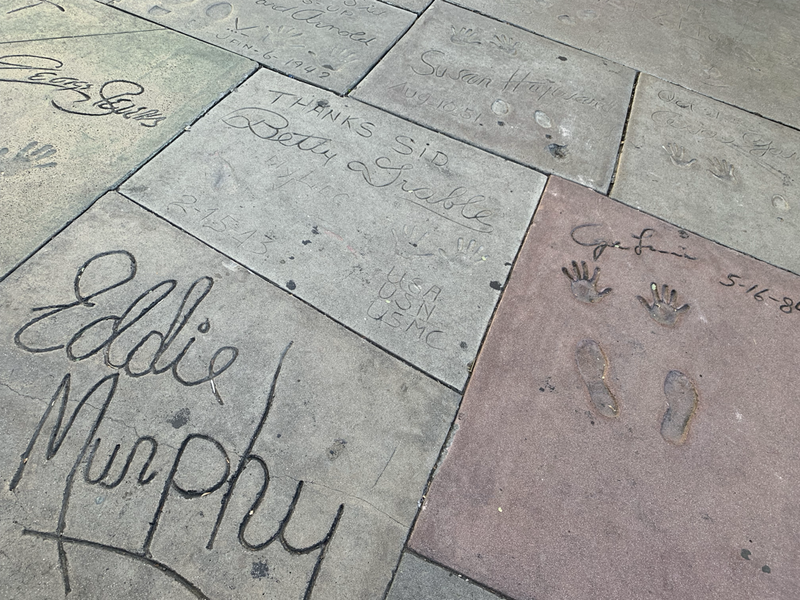 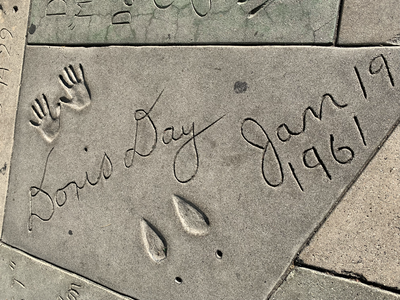 We made our way to the Chinese Theatre to see the prints of the stars and learn of the Golden Age of Hollywood. 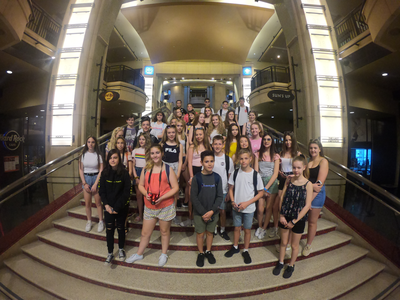 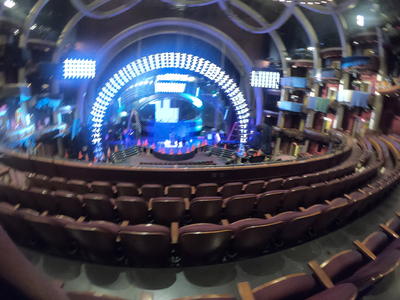 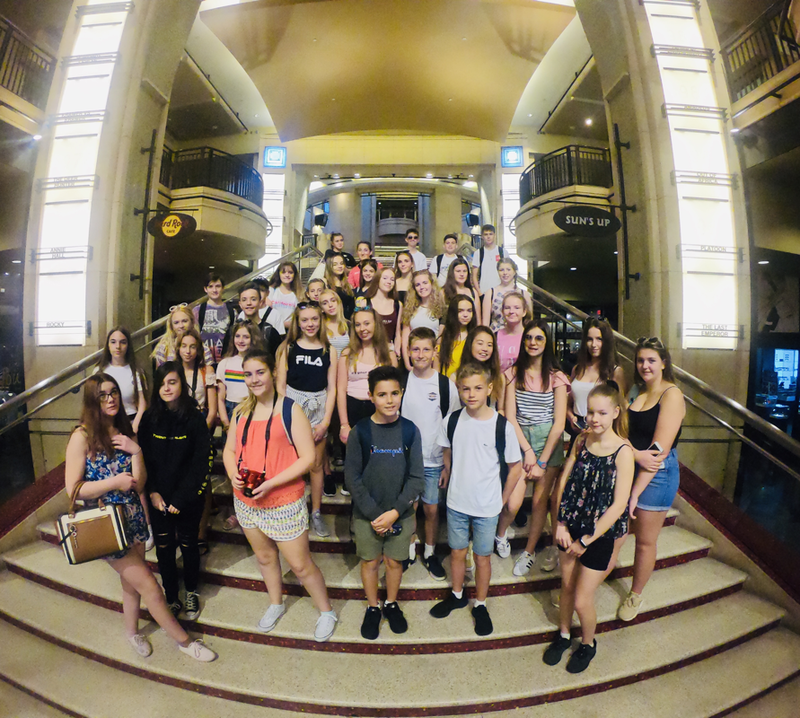 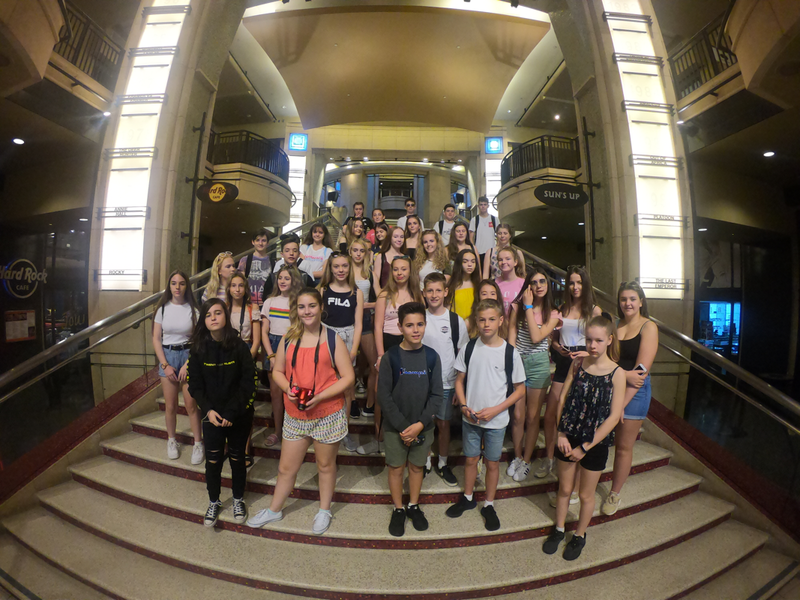 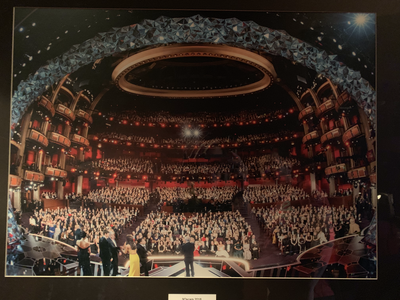 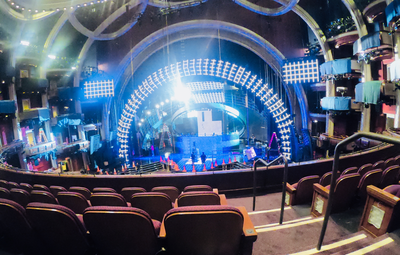 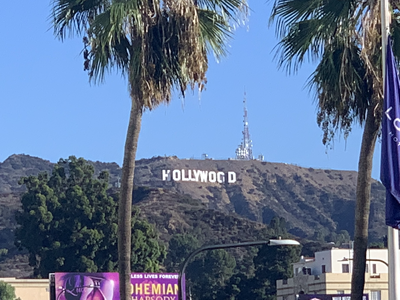 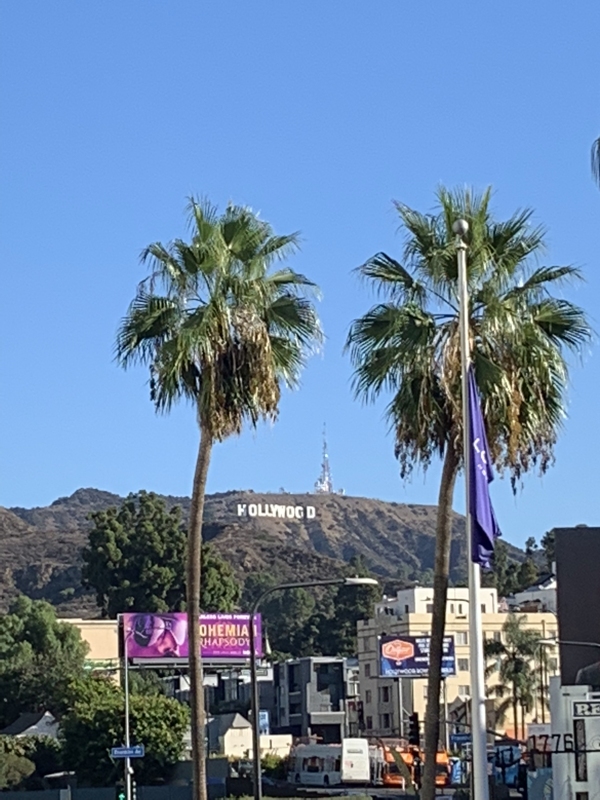 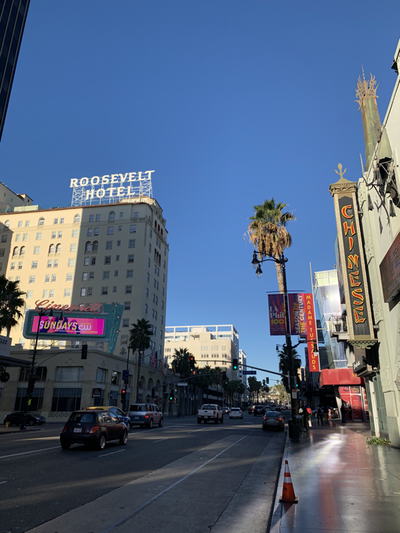 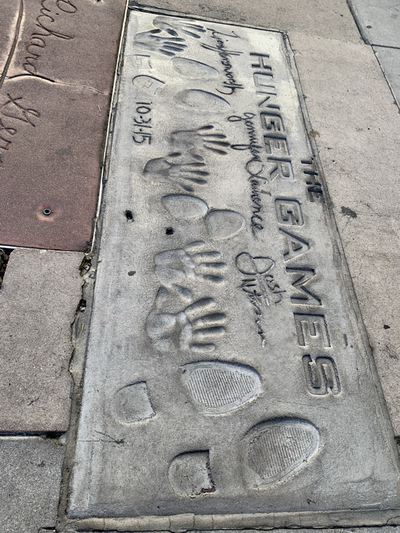 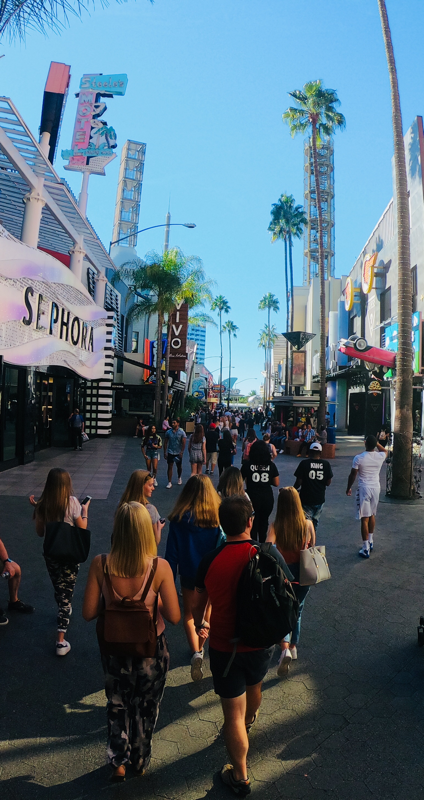 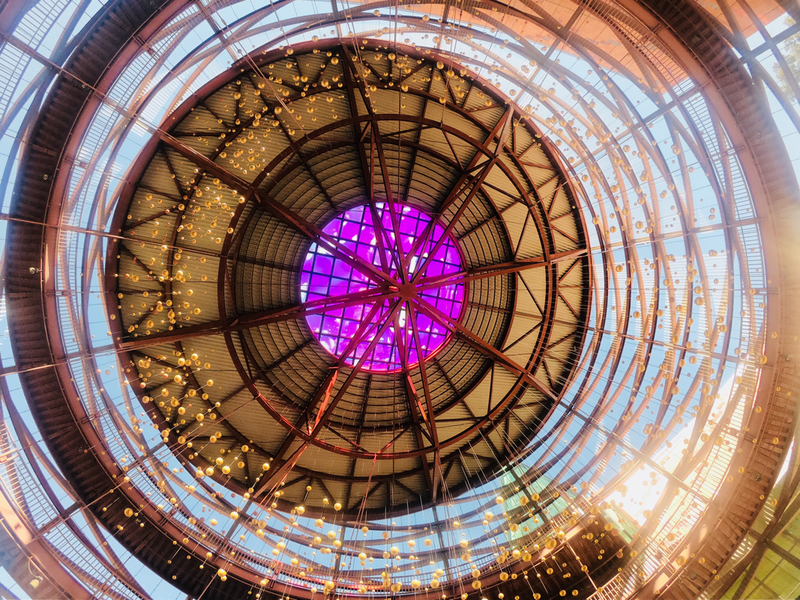 As we passed the Dolby Theatre and were imagining it’s image during the Oscars each year we were approached by the Vice President and General Manager of the theatre, Jay Thomas. 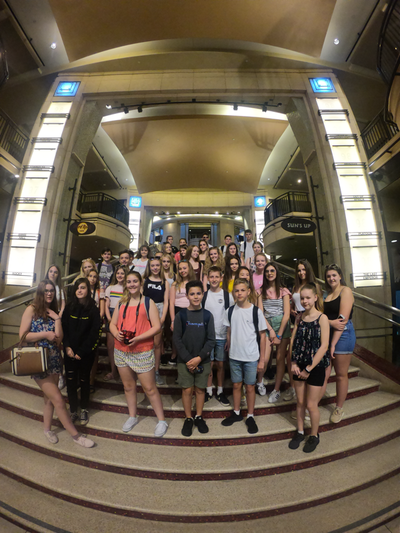 He had been so impressed by the talk from our guide and the behaviour and interest of the group that he offered us unprecedented access to the auditorium! 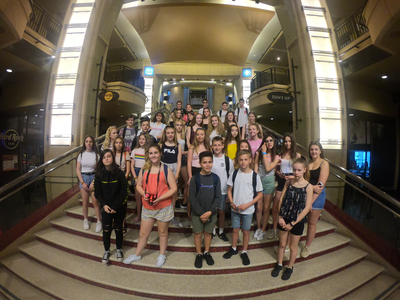 After a brief photo opportunity on the same staircase that so many celebrities and icons ascend each year we were ushered in to the theatre. The stage was buzzing with lights and noise as the workers set the stage for the Latin American Music Awards taking place this weekend. 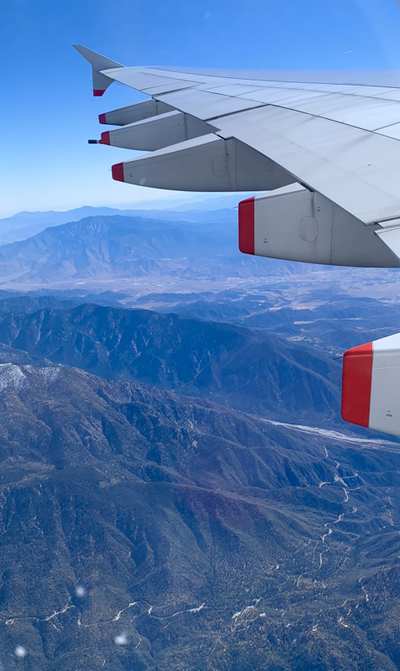 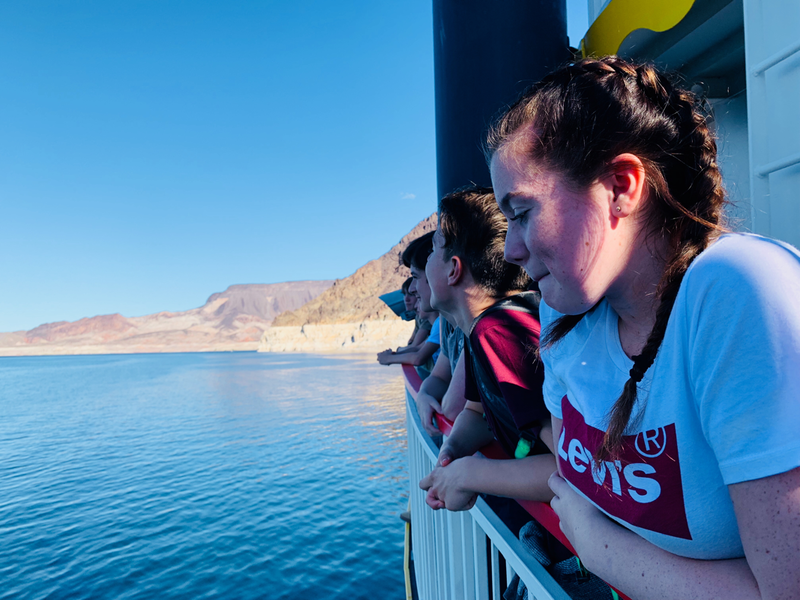 We marveled at the enormity of the space and attention to detail that was described to us before we departed from our fantastic and fortuitous opportunity. 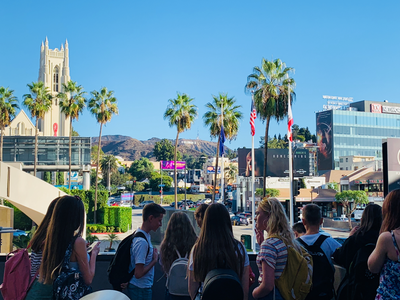 Back on the coach we started to make our way further through the neighbourhood and up the mountains to the Griffith Observatory for a unique view of the districts of Los Angeles and the famous Hollywood sign. After photo opportunities galore we made our way back down into Beverly Hills to see some of the homes of the stars including Marilyn Monroe, Leonard Di Caprio and Matthew McConaughy. 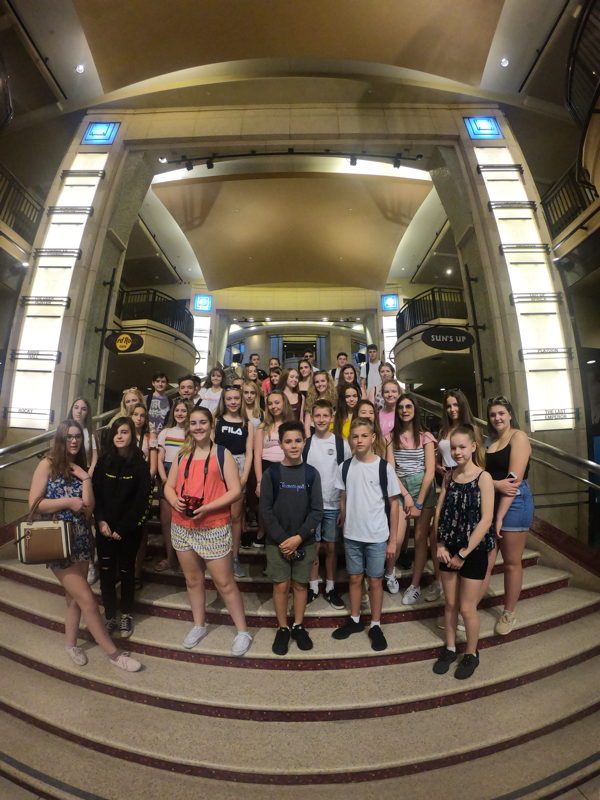 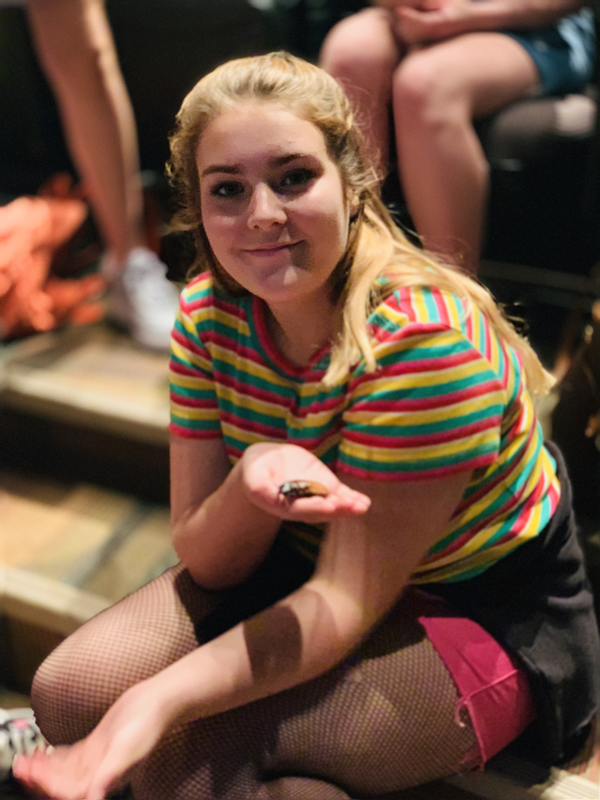 James informed us of the historical journey that the theatre production companies endured after the Second World War and the birth of the music scene in the 70’s. 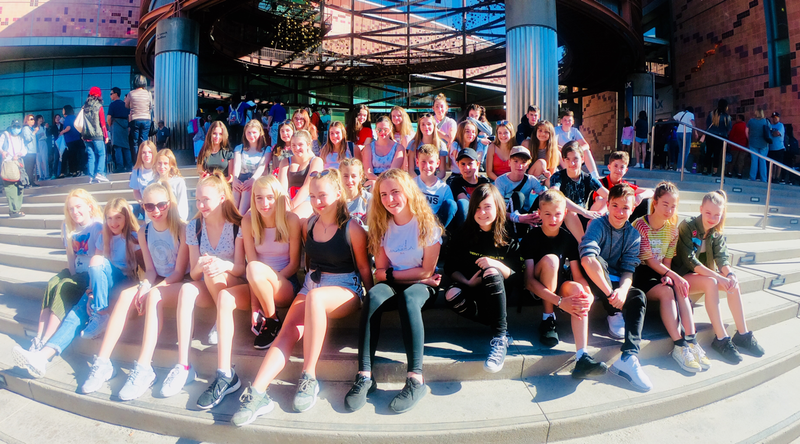 We then took a few hours for lunch at a farmers market and an opportunity for a quick bit of retail therapy before we hit the beach! 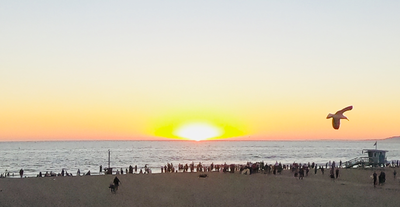 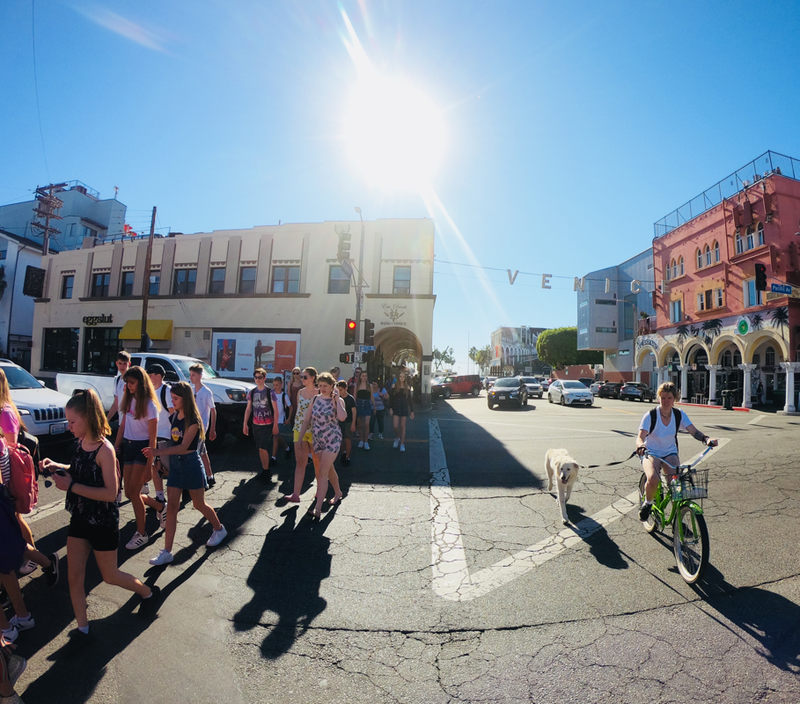 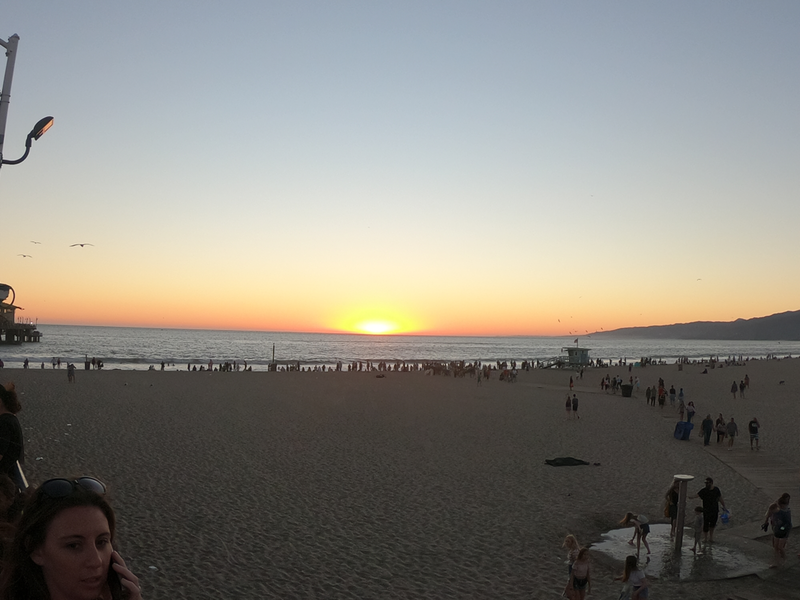 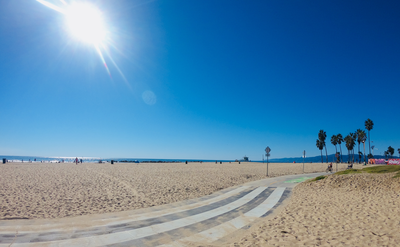 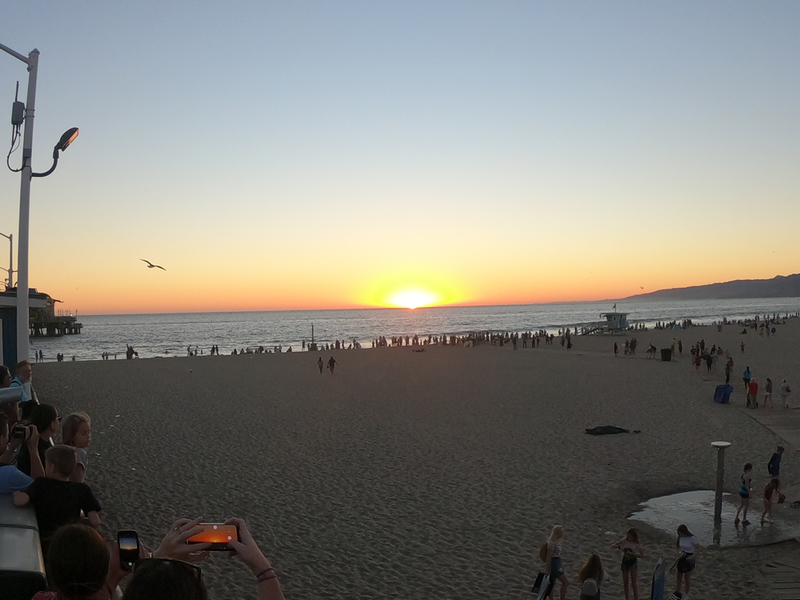 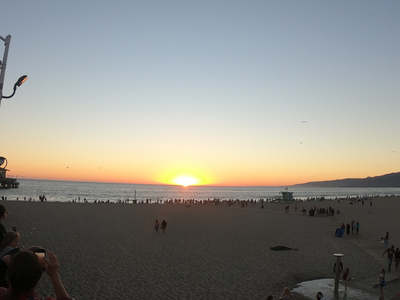 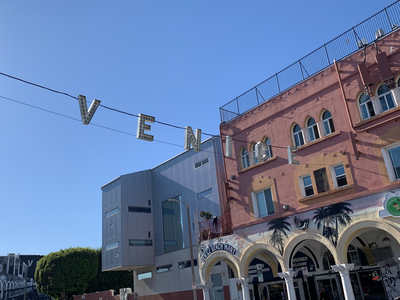 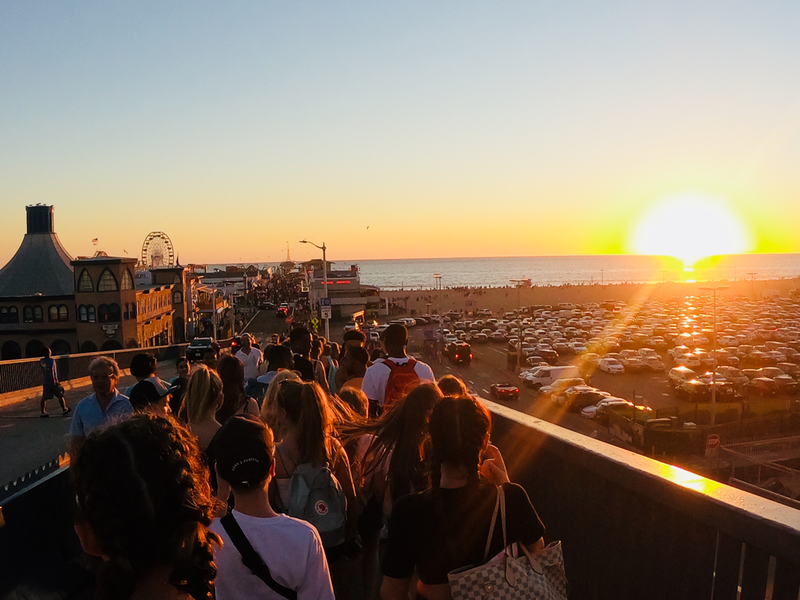 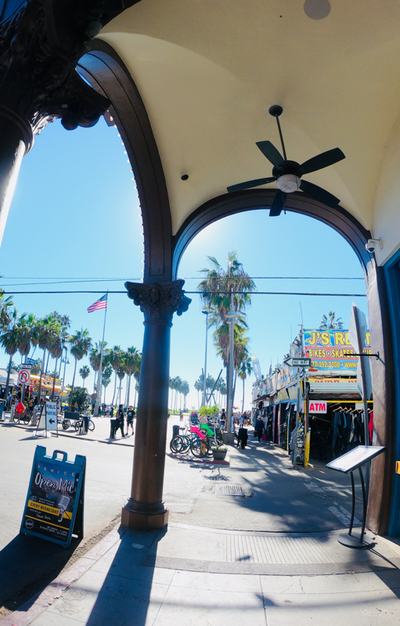 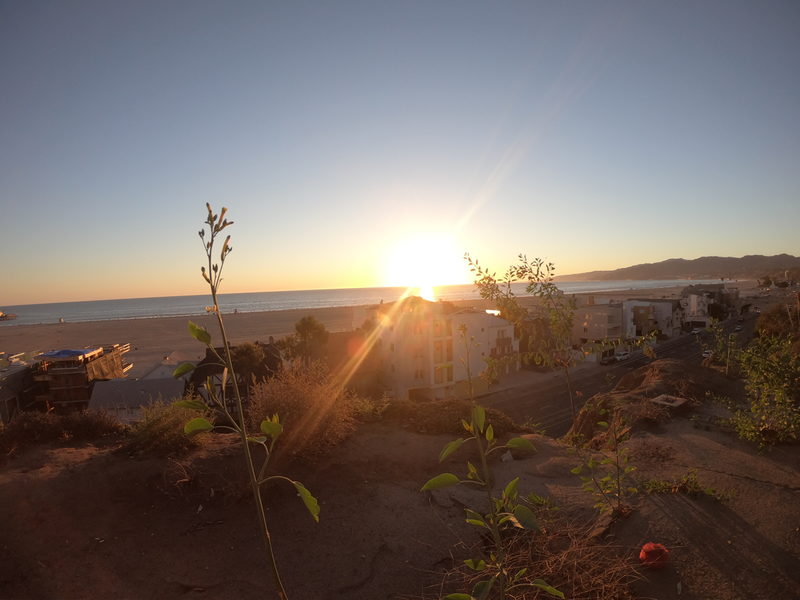 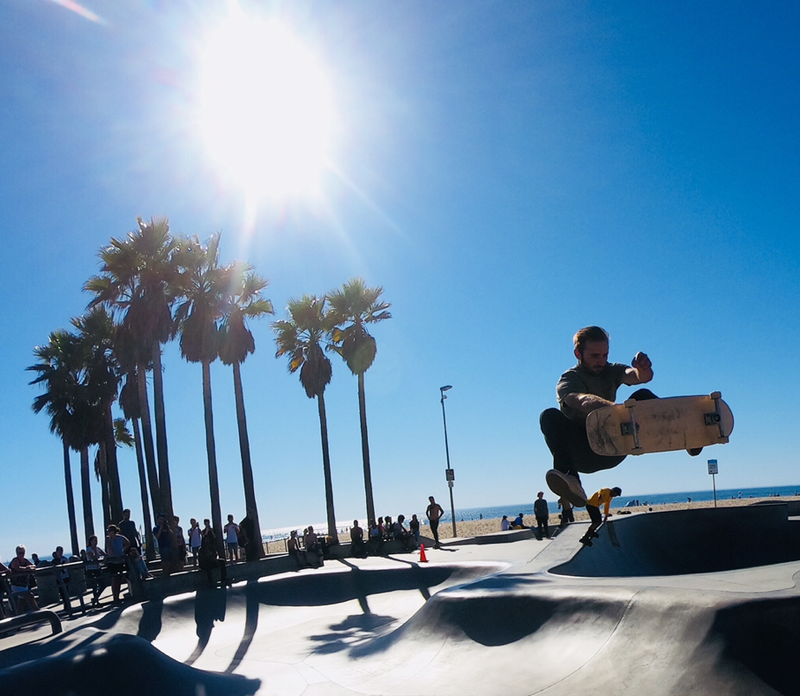 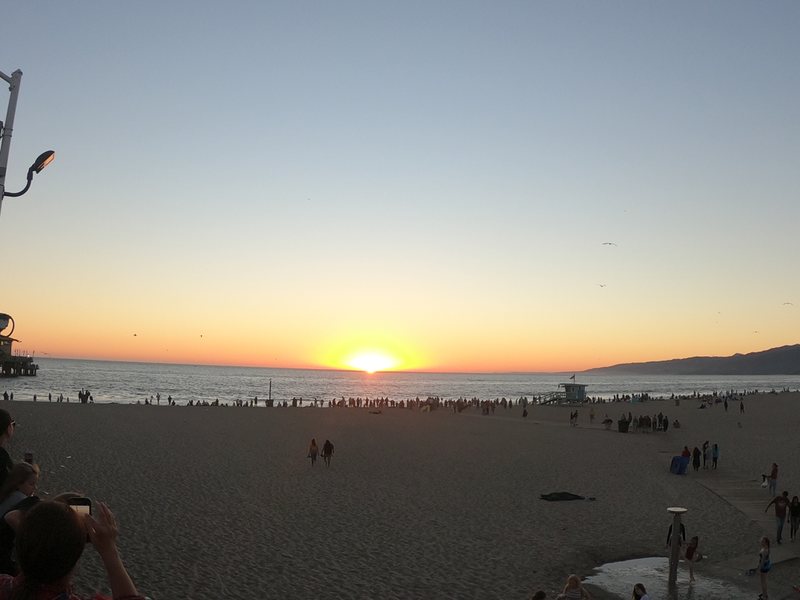 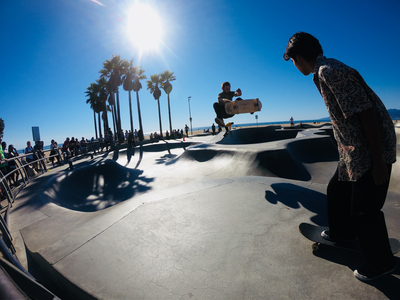 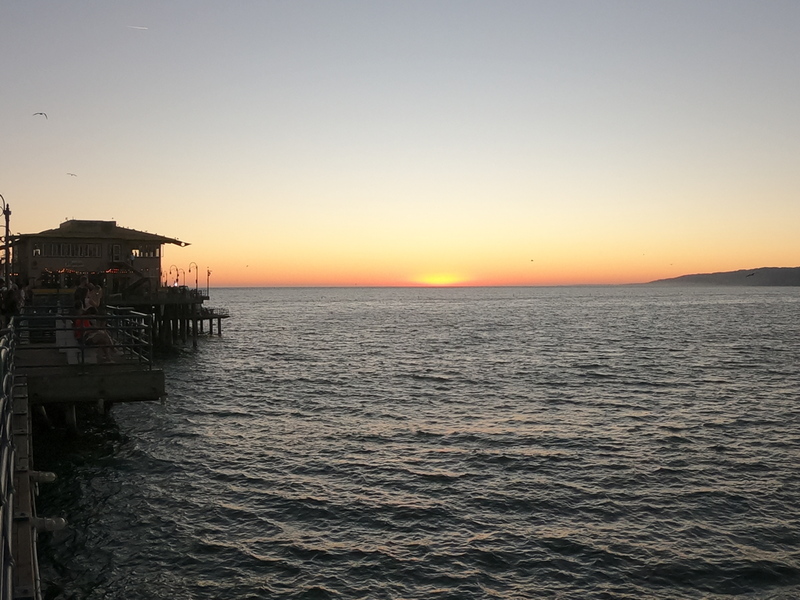 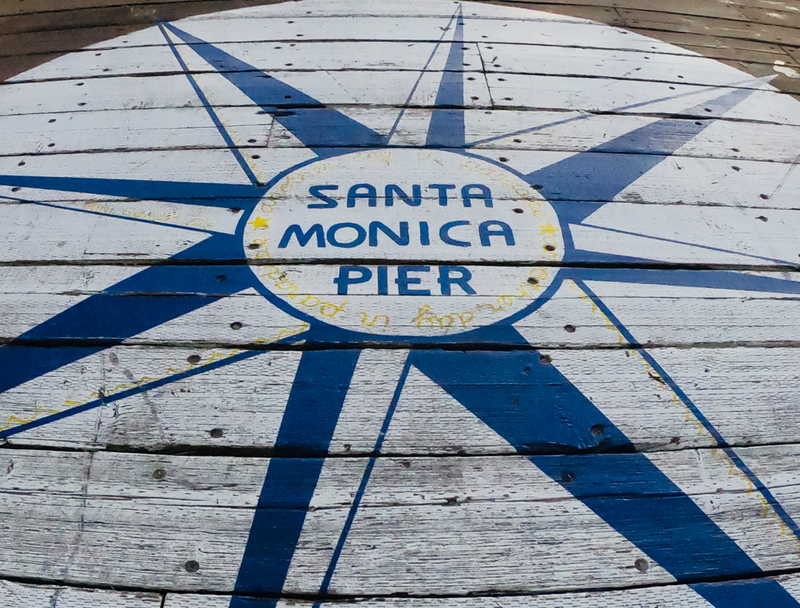 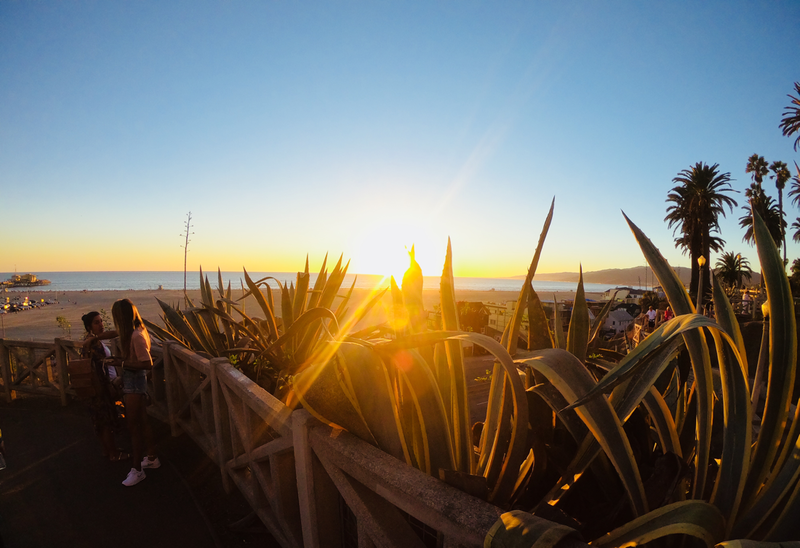 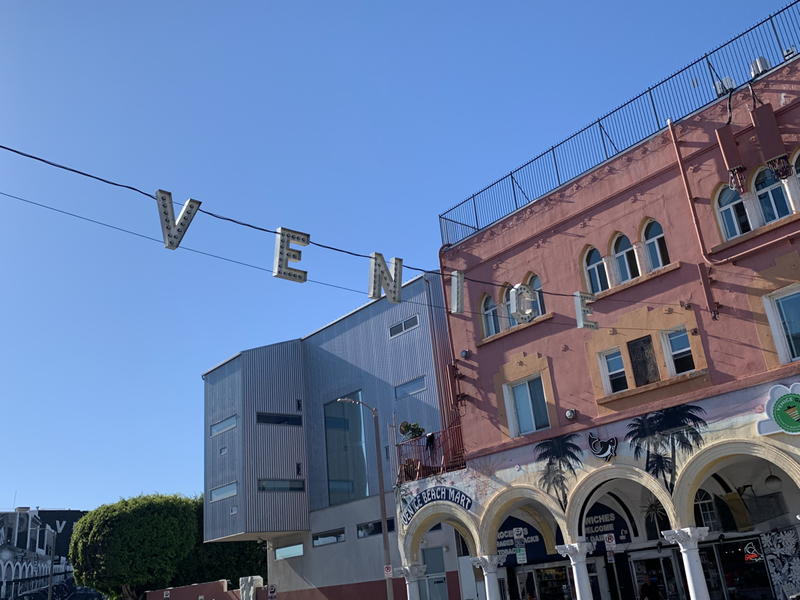 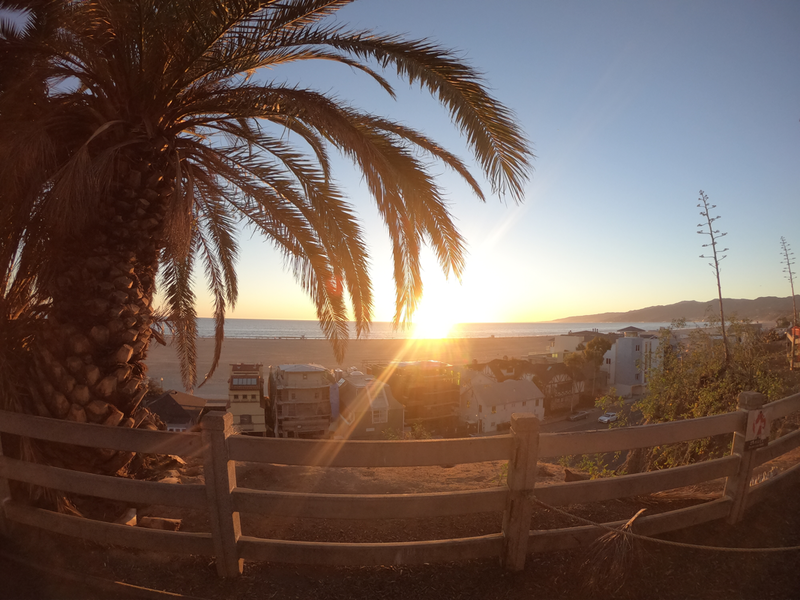 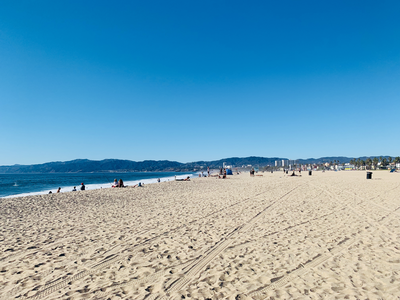 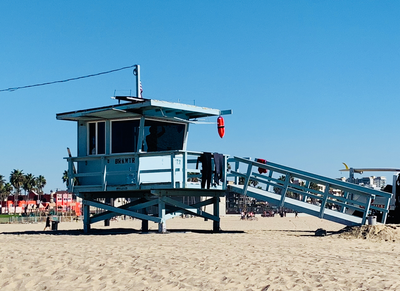 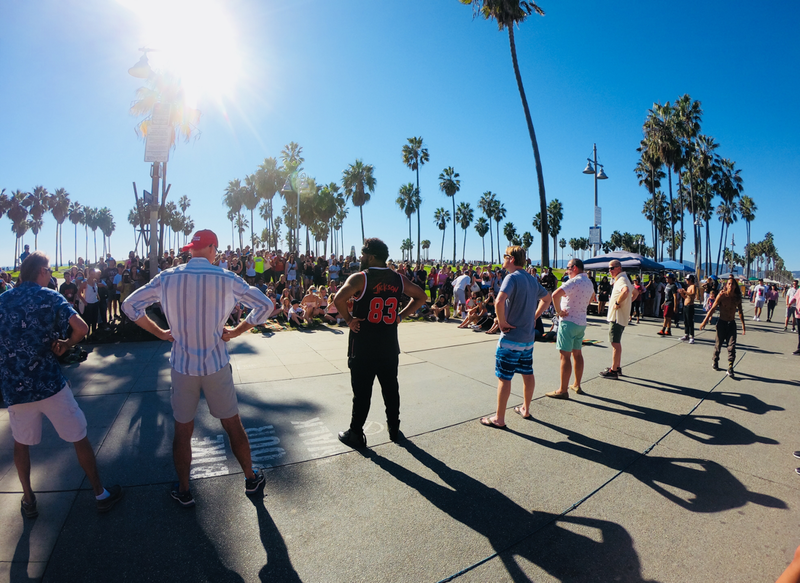 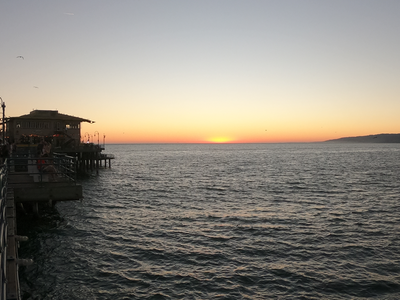 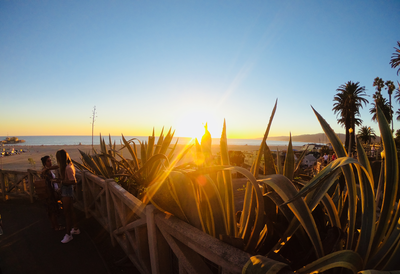 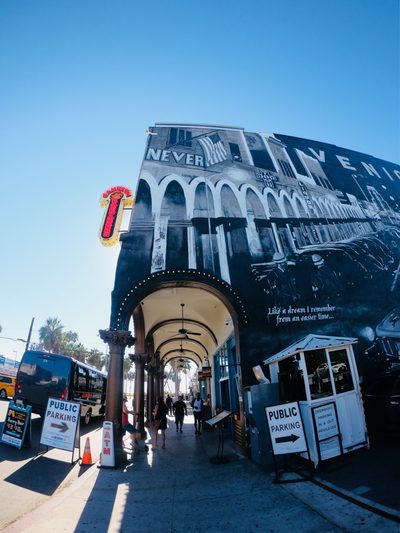 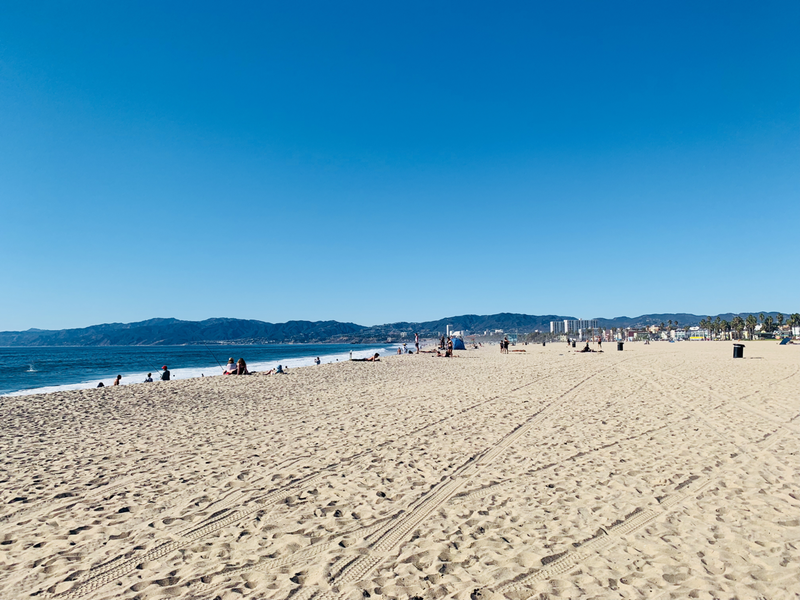 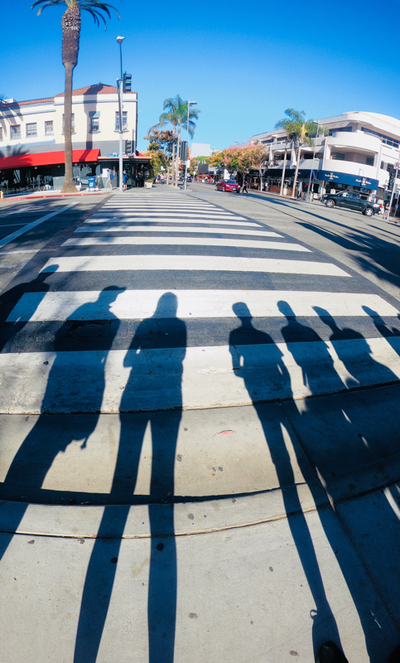 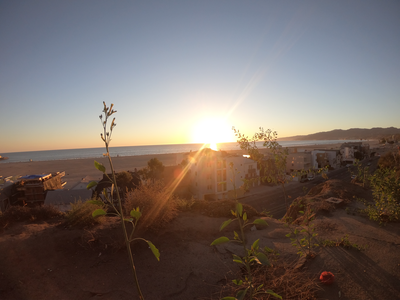 After Greg, our coach driver, dropped us off whe walked through the entrance to Venice Beach. 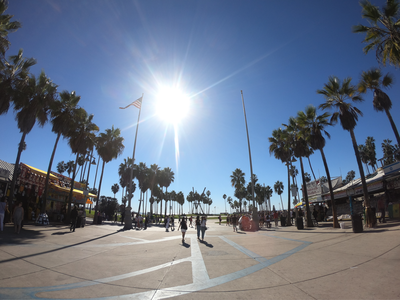 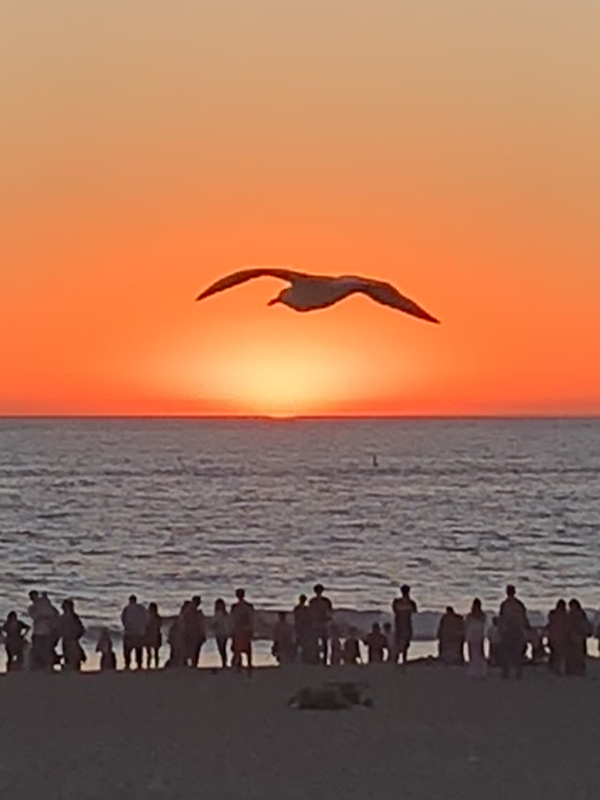 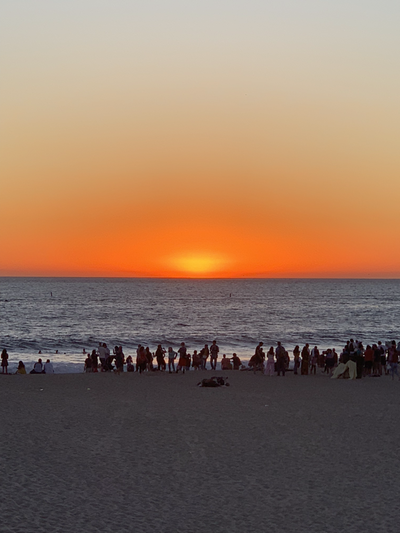 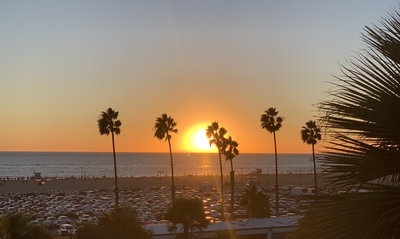 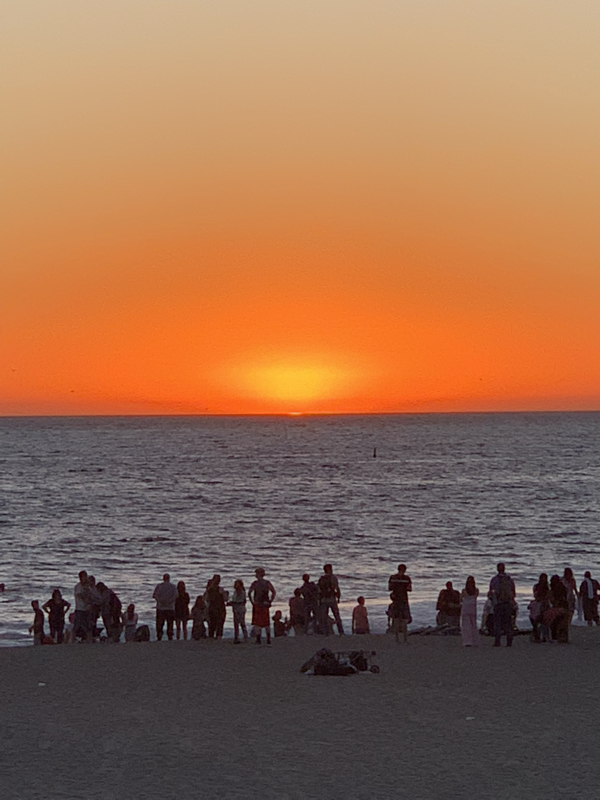 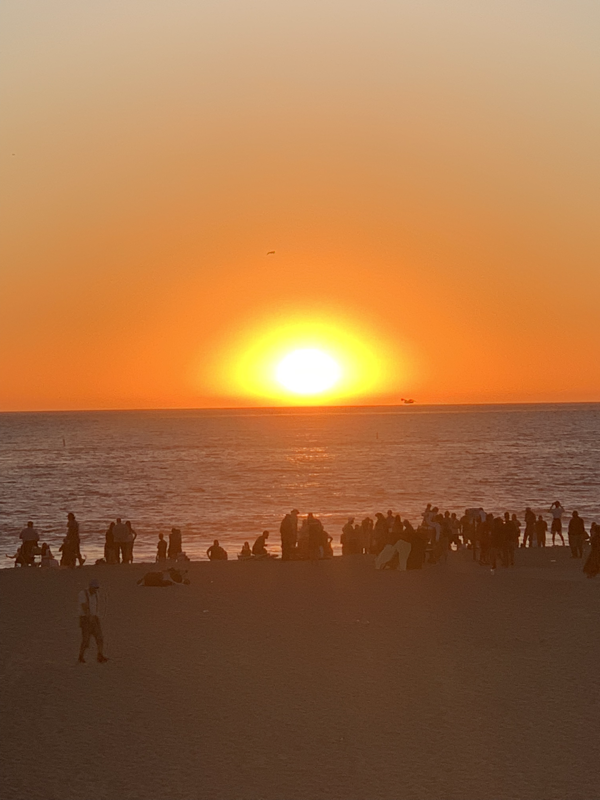 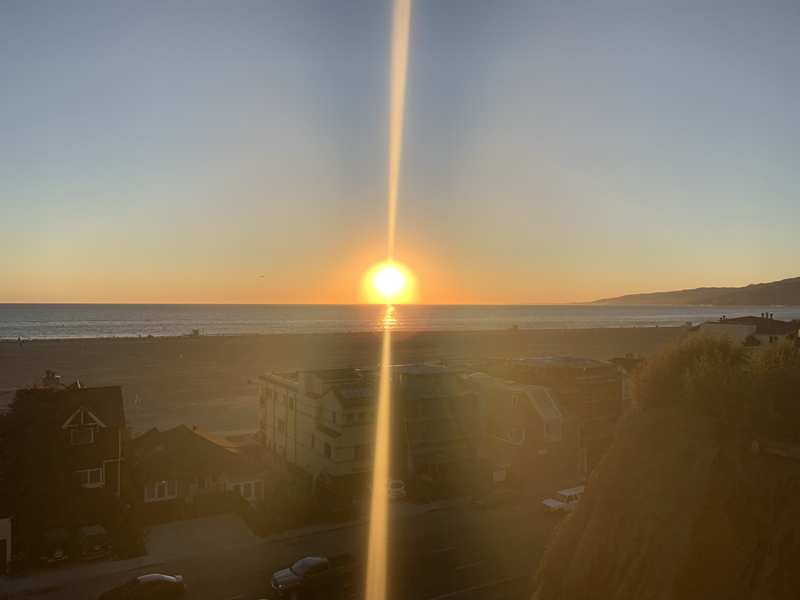 Immediately we were struck by the beautiful view of the sun over the water, palm trees and the entertainment for the beach goers. 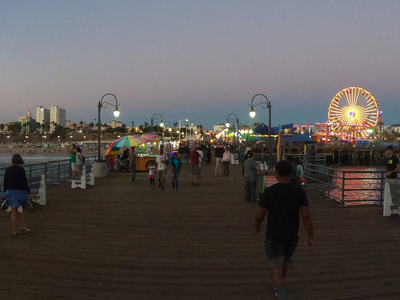 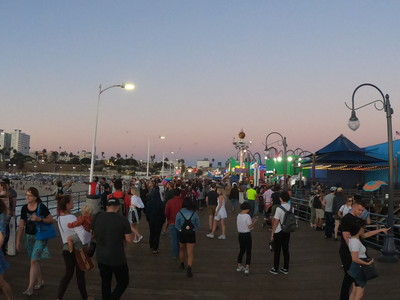 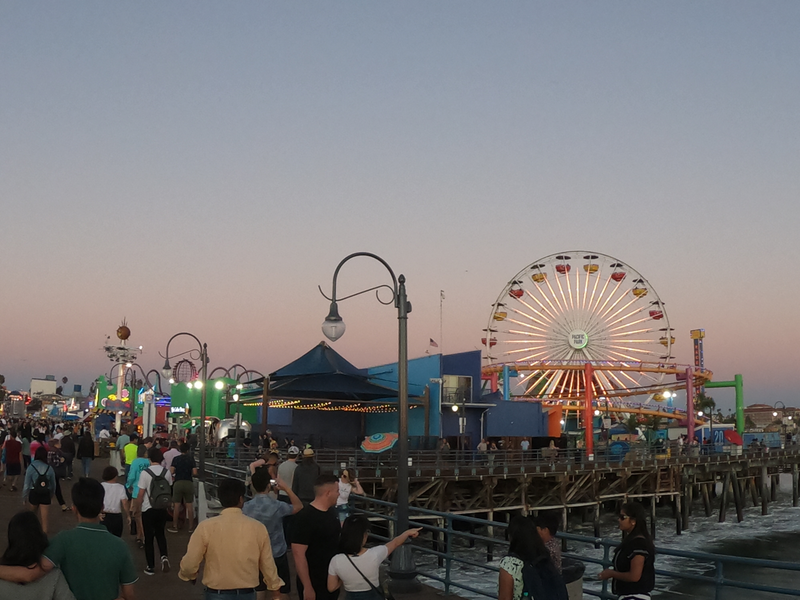 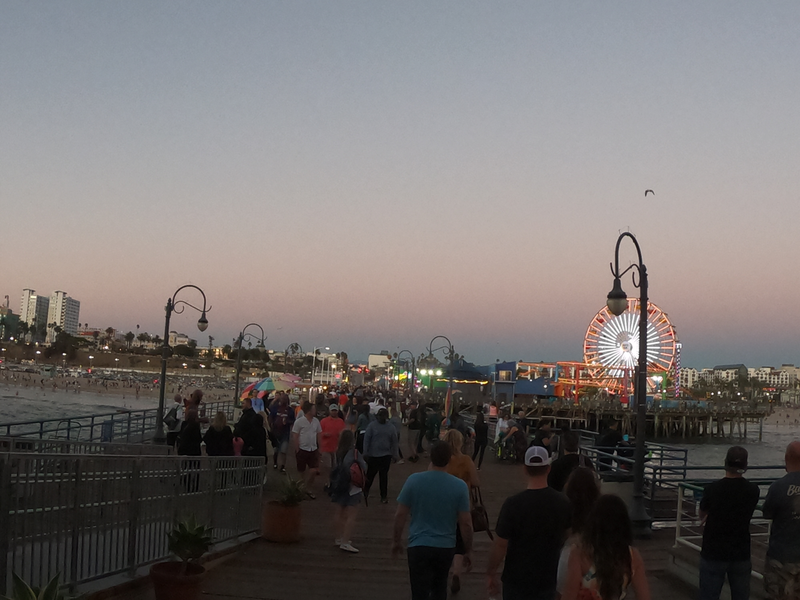 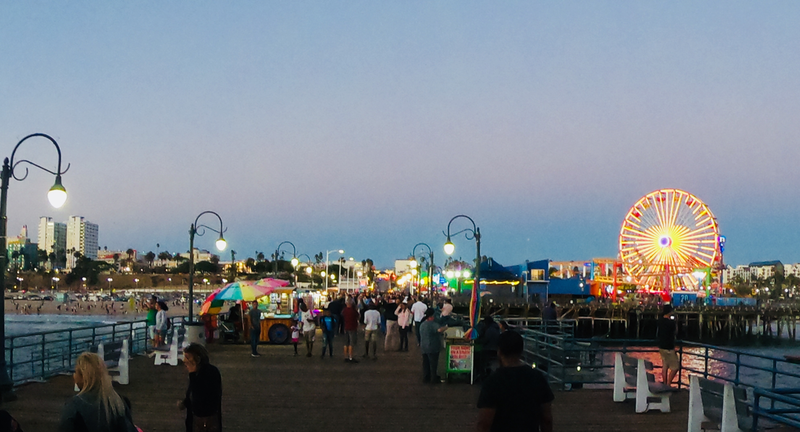 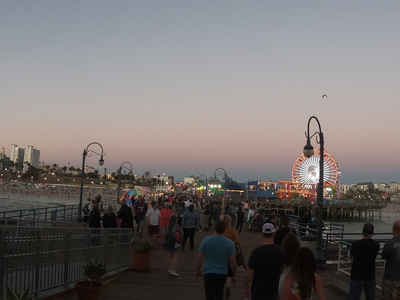 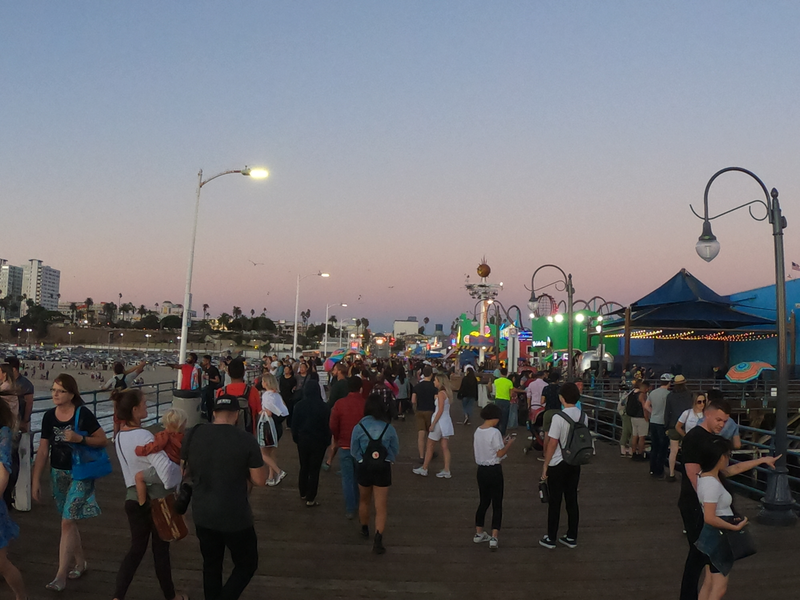 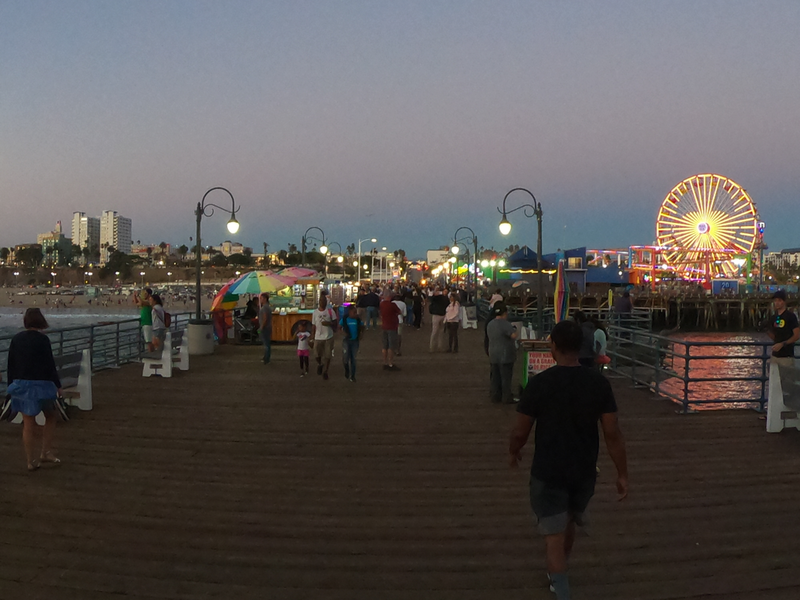 We walked down the prom enjoying live musicians, performers, basketball games, skaters and more. 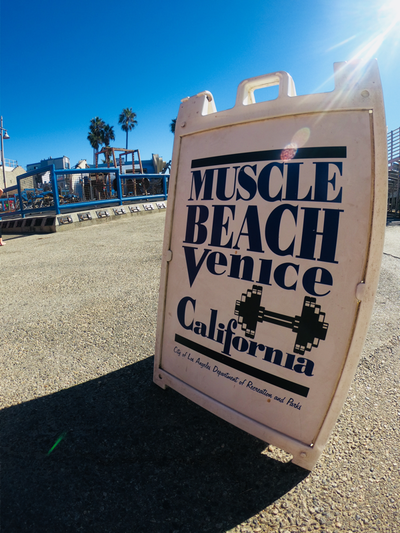 We stopped for a drink and ice cream near the famous Muscle Beach; it is a little different from it’s hey day when Arnie used to frequent the gym! 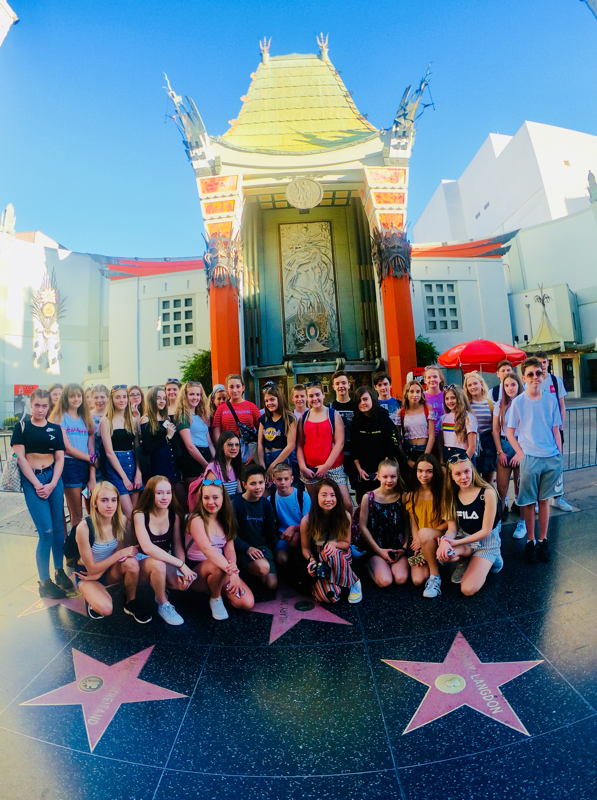 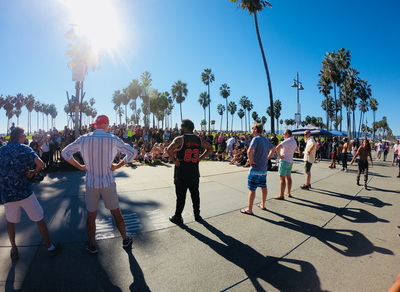 Another half hour for everyone to have their own look around provided Mr Grimer with an opportunity to assist the street performers in a dance number before we made our way to Santa Monica! 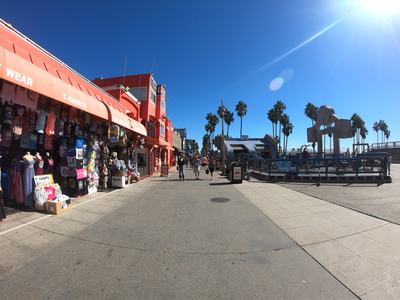 In Santa Monica we had a couple of hours for the group to look around the shops, much to their delight, before we headed back to the beach for dinner. 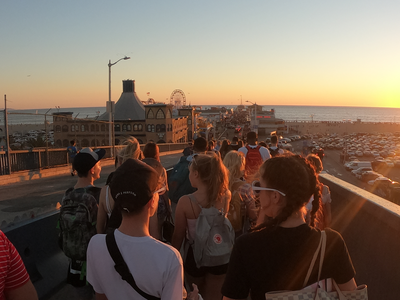 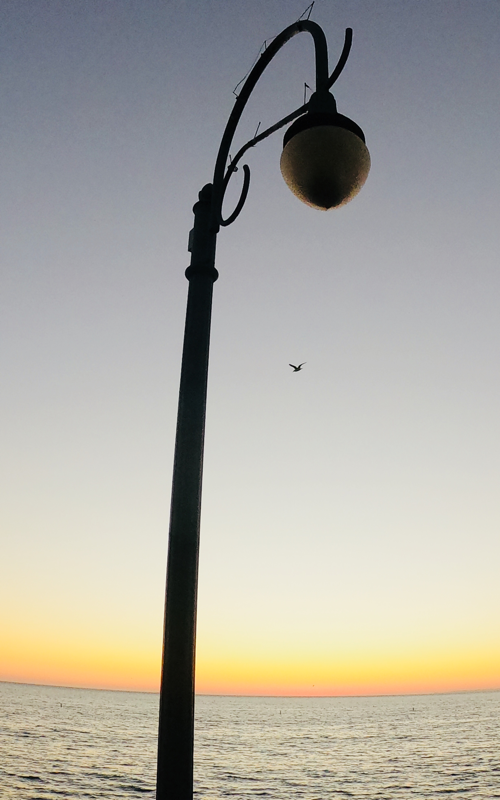 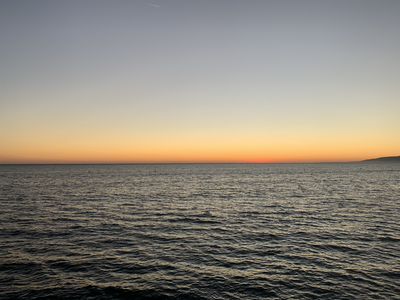 As we approached the seafront the sun was hanging low and creating an incredible array of fiery colours in the sky. 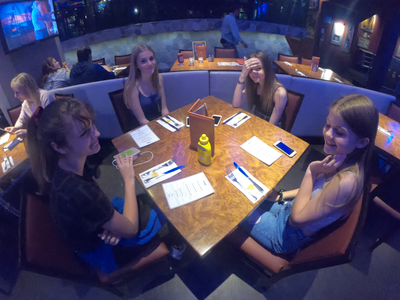 We watched in awe as it sank down below the waves before we went for our fill in Bubba Gumps. 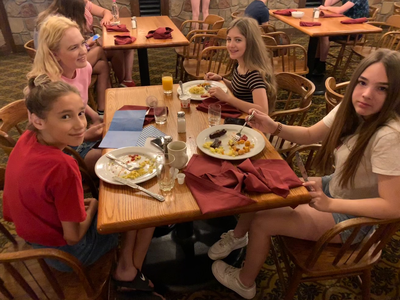 At dinner we were entertained with some Forrest Gump trivia and prizes before we embarked our coach for the final time today and made our way back to the hotel. It was straight to our rooms to pack our bags in preparation for our travels in the morning. 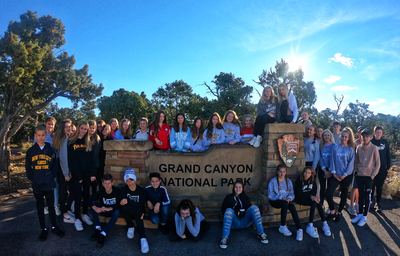 All in all another great day in which the group made us proud yet again. 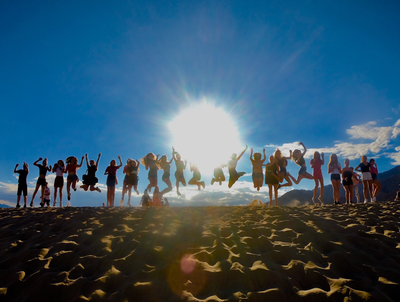 With new friendships forming and memories being made they are all really making this a holiday to remember. 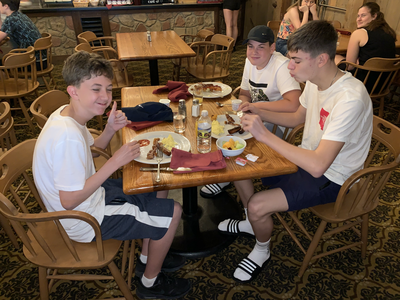 A lie in today with breakfast at 8am and our departure by 9. 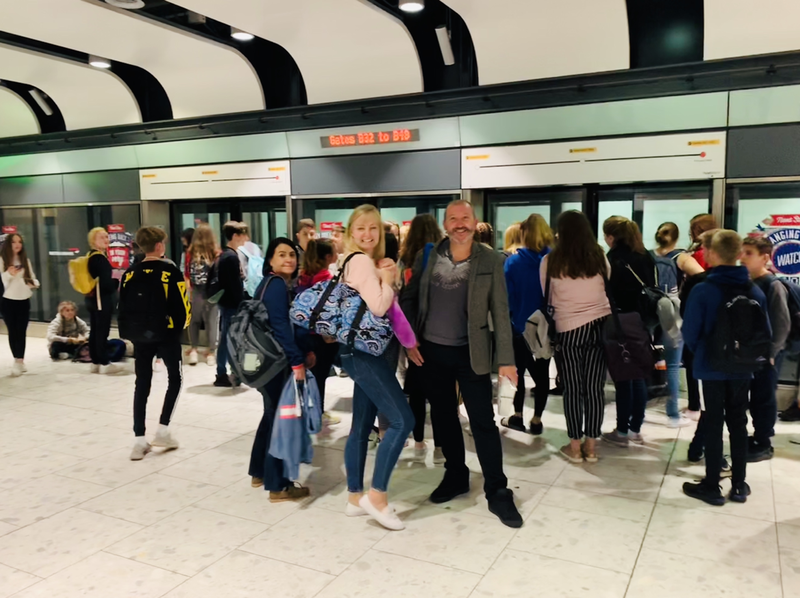 We load our baggage onto the bus with our new driver, Salvador, as we make our way to the Science Centre. 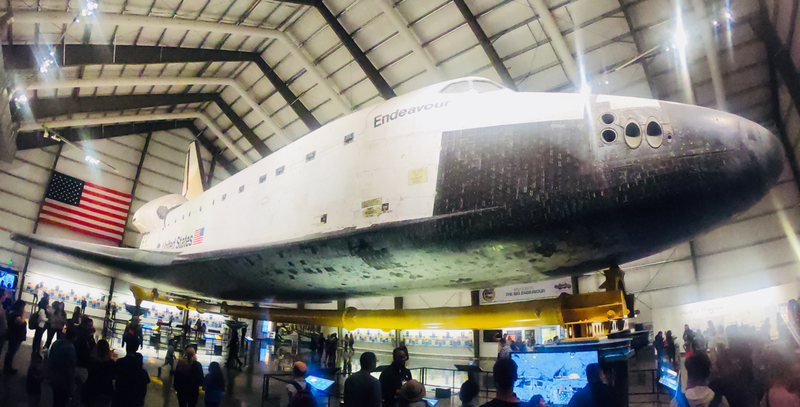 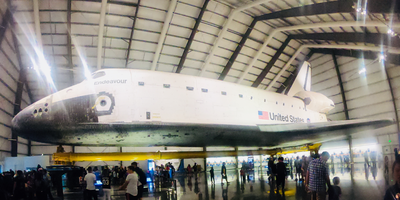 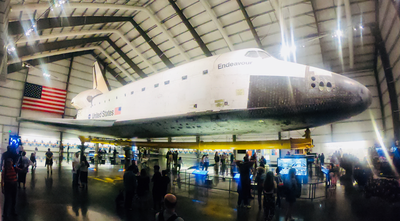 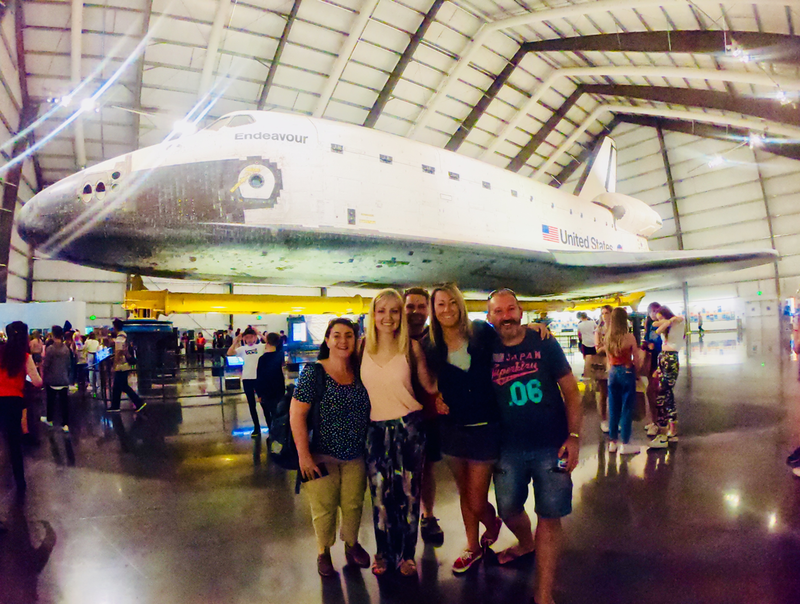 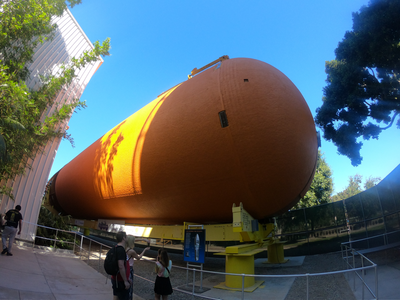 Here we saw the Space Shuttle Endeavour, NASA’s most travelled spacecraft. Having completed 25 successful missions and helping build the International Space Station it really was a sight to behold. 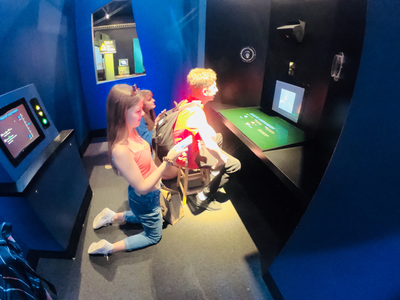 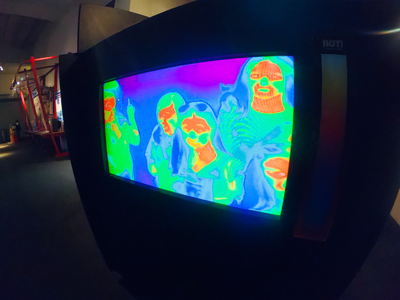 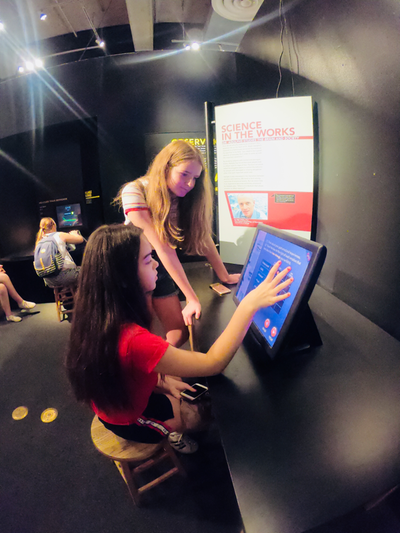 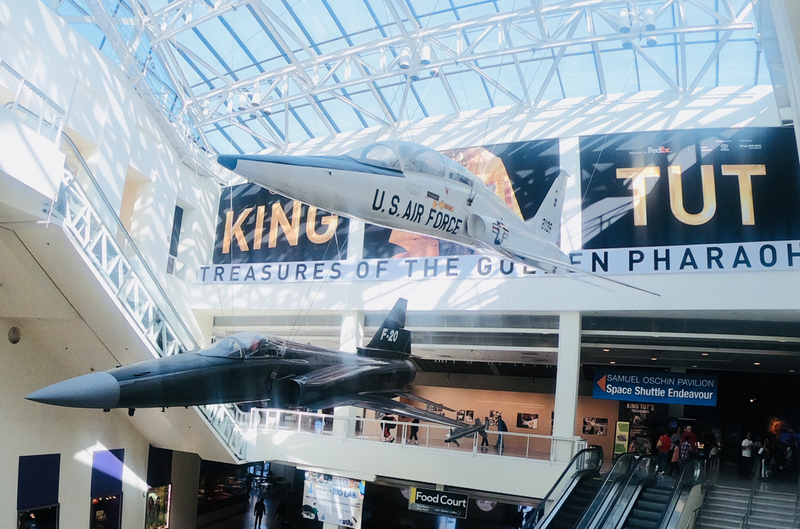 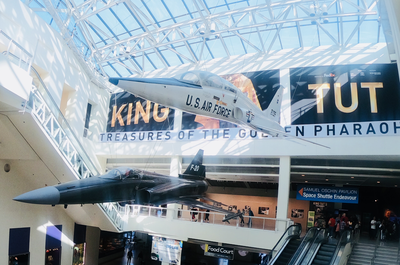 Other interactive exhibits included hurricane simulations and testing fears. 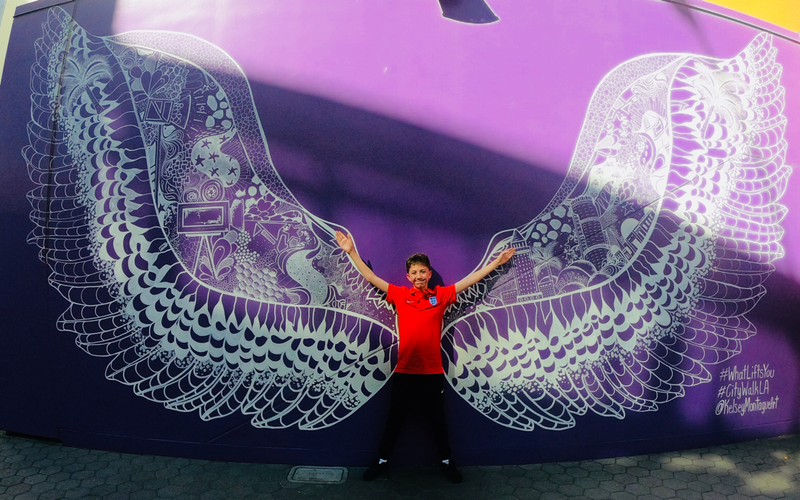 For lunch we had a flying visit to Universal Studios where we lined our stomachs in preparation for our long road trip to Death Valley. Here, our guide Evan rejoined our school party and became our MC on the coach imparting his knowledge and humour to the group. The change in scenery from the hustle and bustle of the city to the vast stretching salt plains and mountains is awe inspiring. 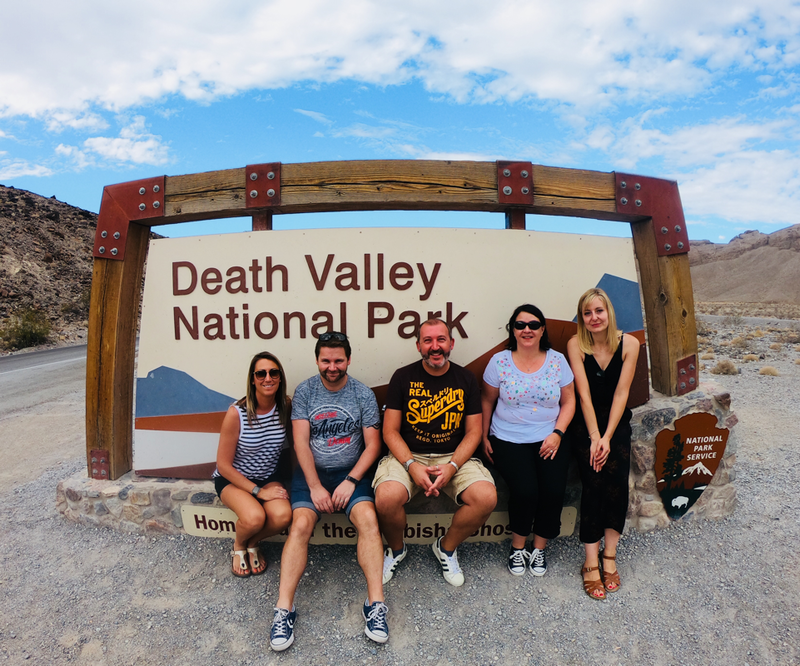 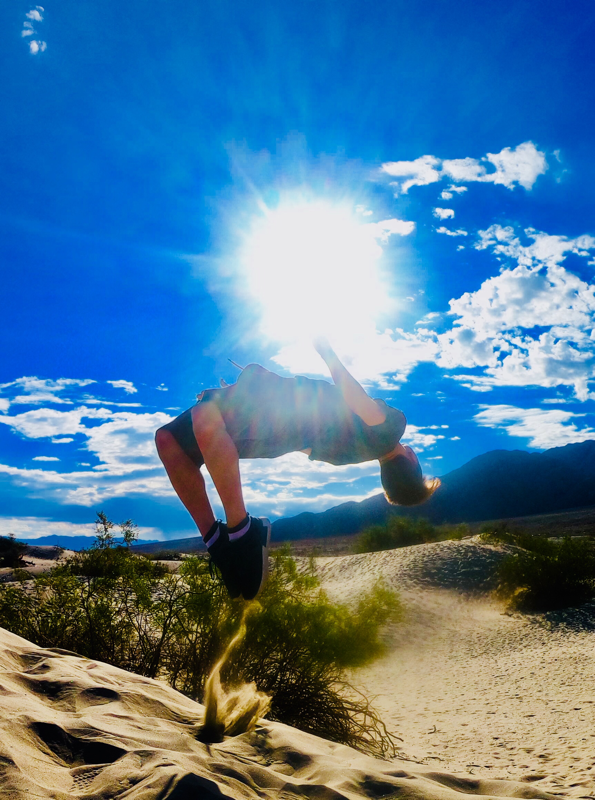 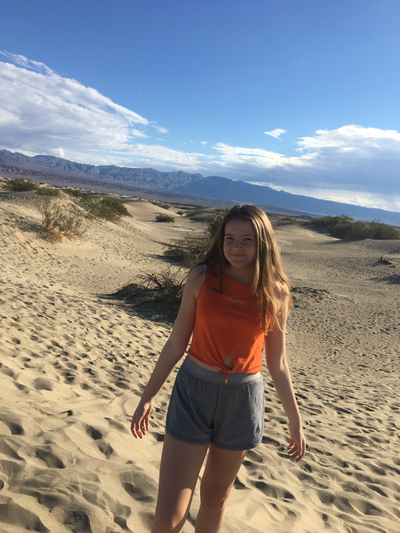 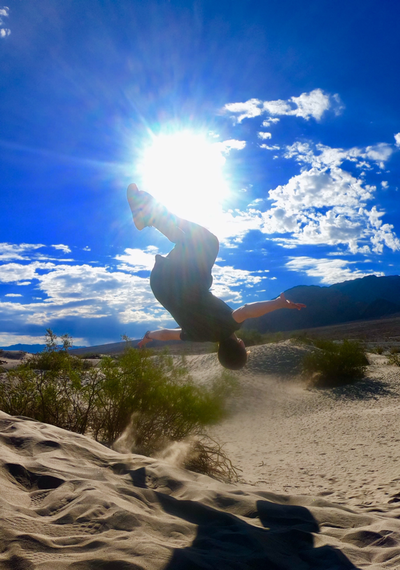 Our destination is incredibly remote in the northern part of Death Valley, will be off grid for 24 hours with no WiFi or 3G, it will be a shock to their system but most definately worth it! 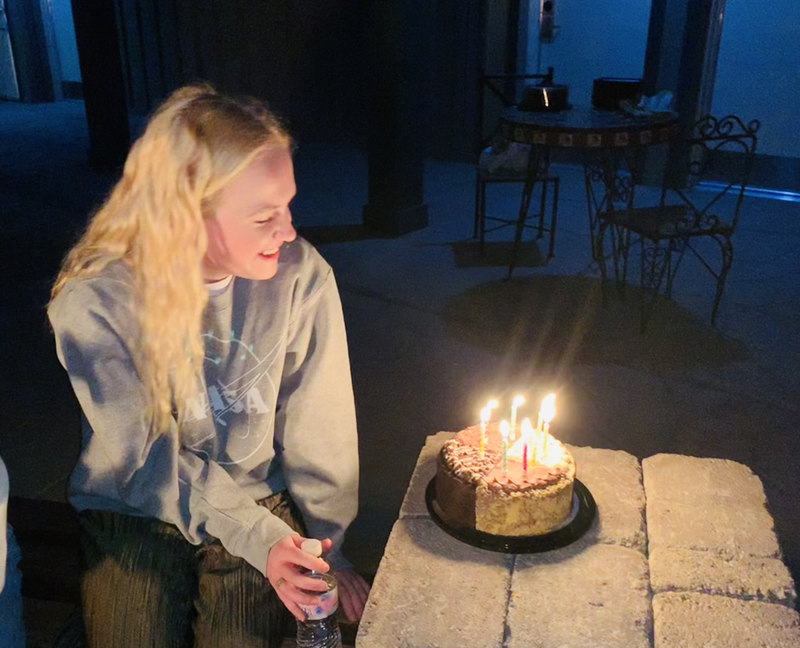 For dinner we will have sandwiches and salad around the fire under the stars with another birthday cake for desert. A meteor shower is due to be passing overheard so if we are lucky we will have shooting stars above us as we gather underneath the night sky. After a brief lie in we had breakfast in our second hotel, Stovepike Wells. 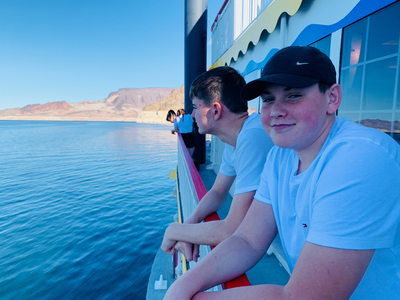 The views here were incredible to wake up to with crows perched outside our rooms keeping an eye out for scorpions and tarantulas. 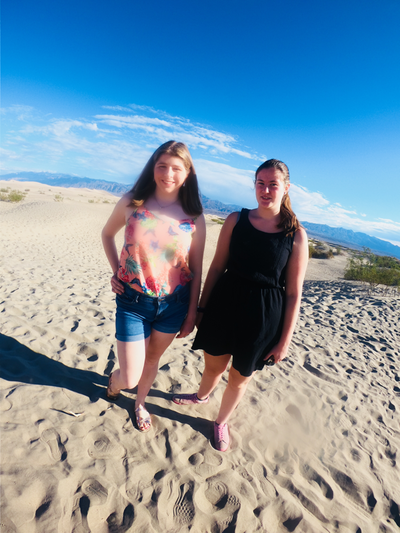 The sunrise was hidden from view behind some angry looking clouds but they were soon burnt off giving way to the beautiful blue backdrop for our next stop - the sand dunes. From being bleary eyed on the bus the group soon woke up when they saw the sights of the sands sprawling towards the mountains. 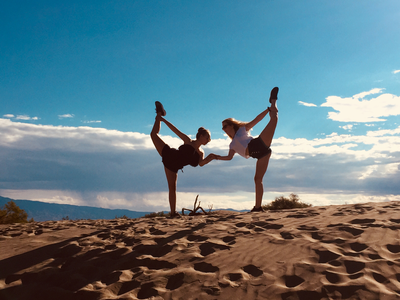 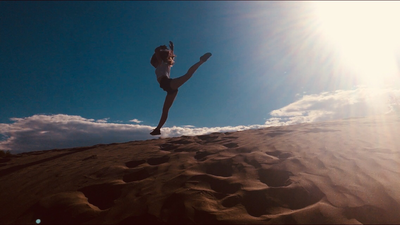 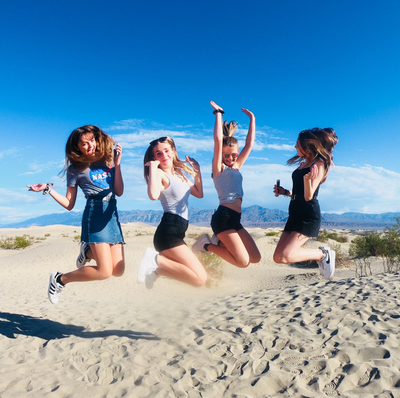 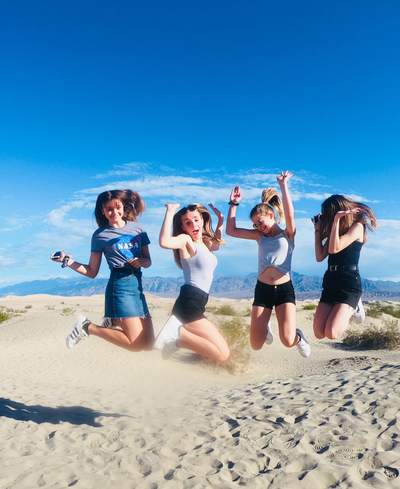 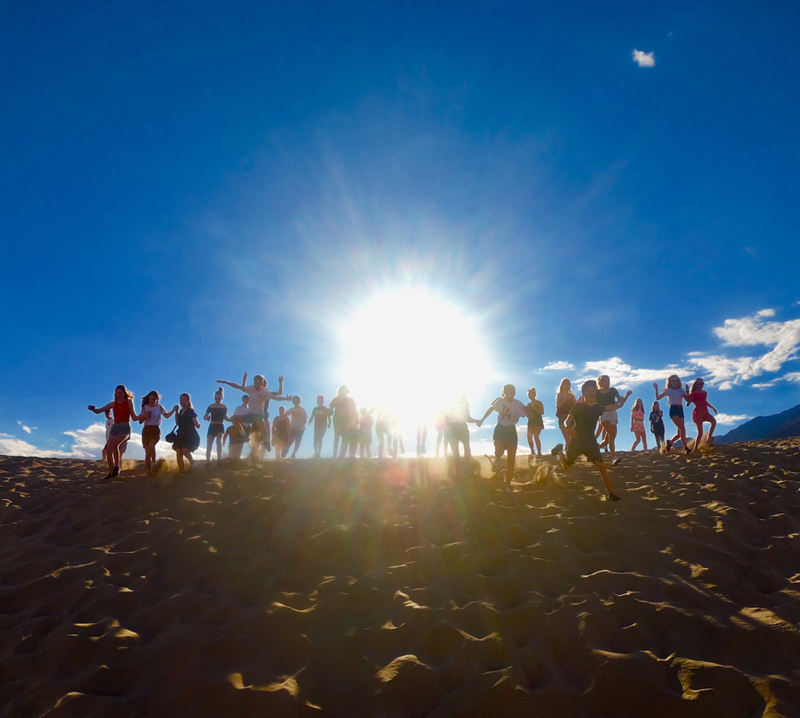 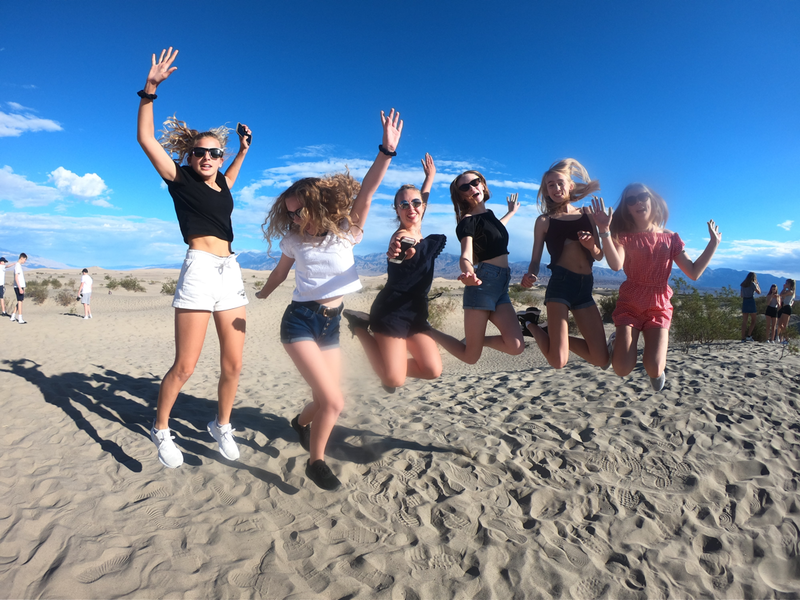 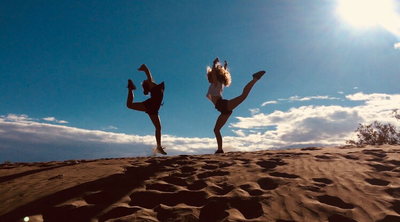 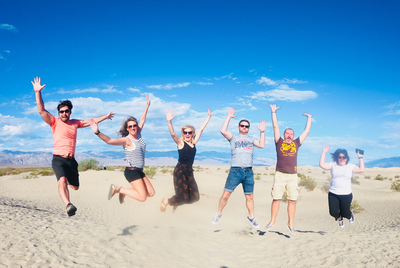 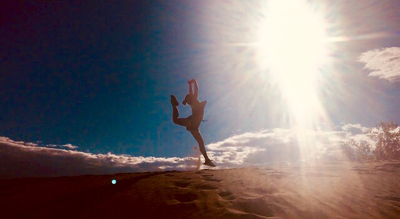 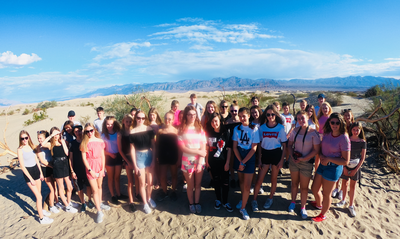 By 9.30 am we could already feel the heat on the dunes but this didn’t stop us making the most of the photo opportunities with all sorts of athletic poses! 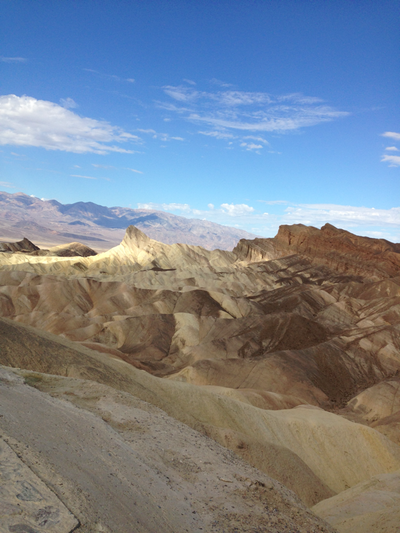 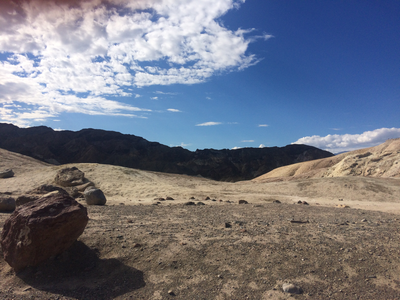 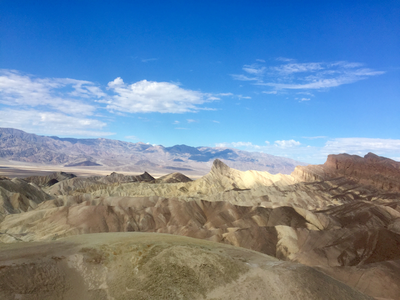 Next we had a short stop at Zabriskie Point. 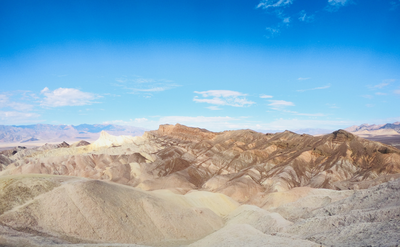 The landscape here is truly like that of another world; it has been used as a backdrop for the films Star Wars, Spartacus and groups such as Pink Floyd and U2 due to it’s unique typography and erosional landscape. 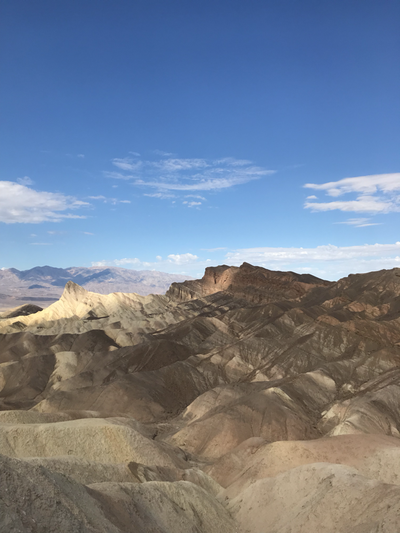 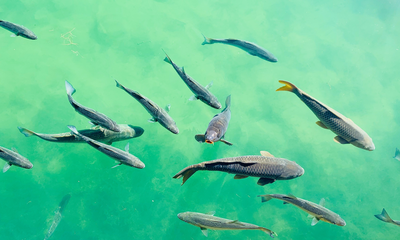 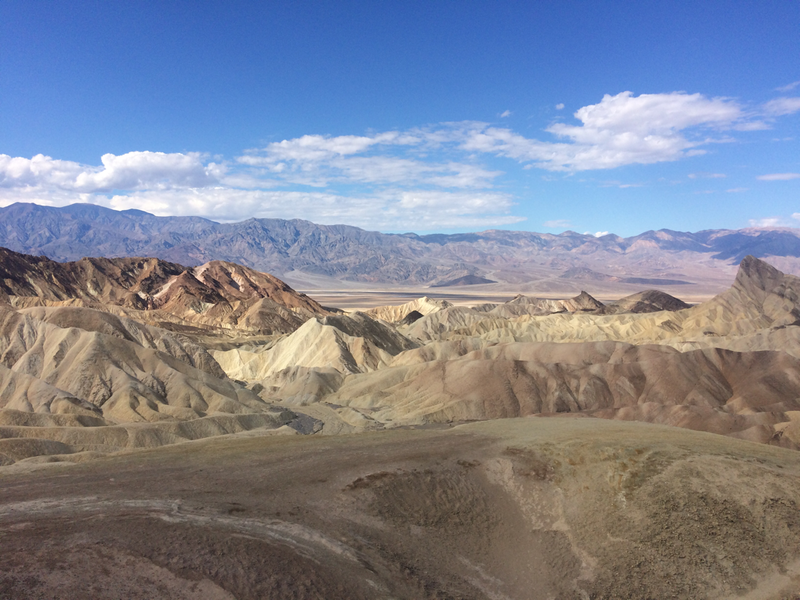 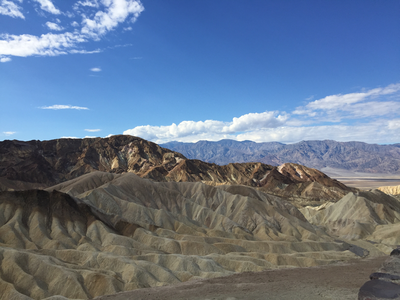 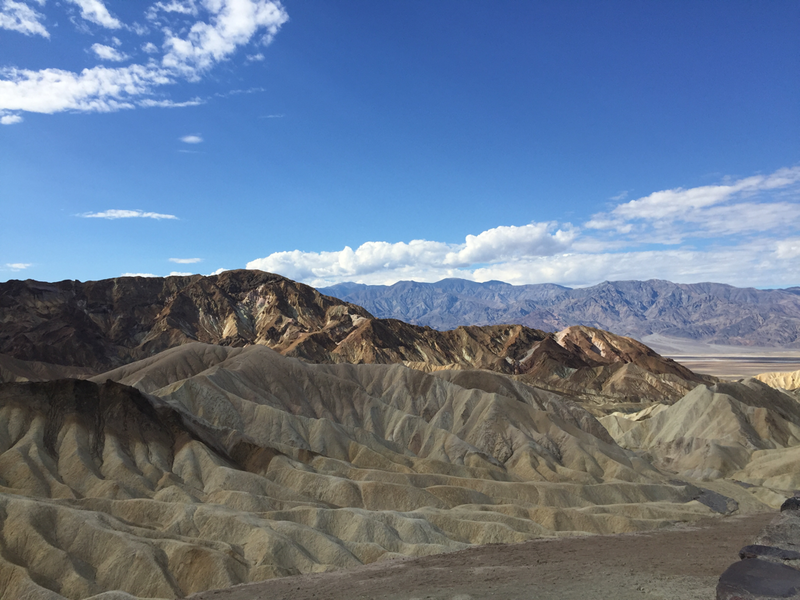 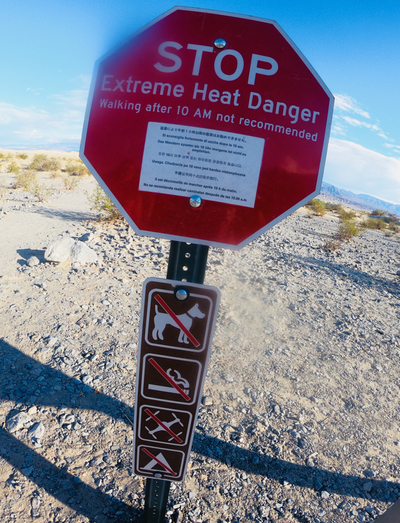 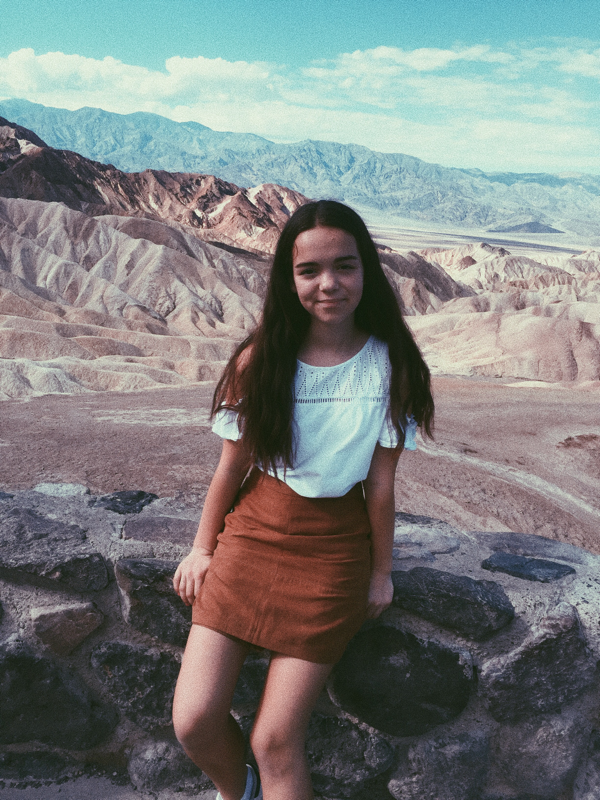 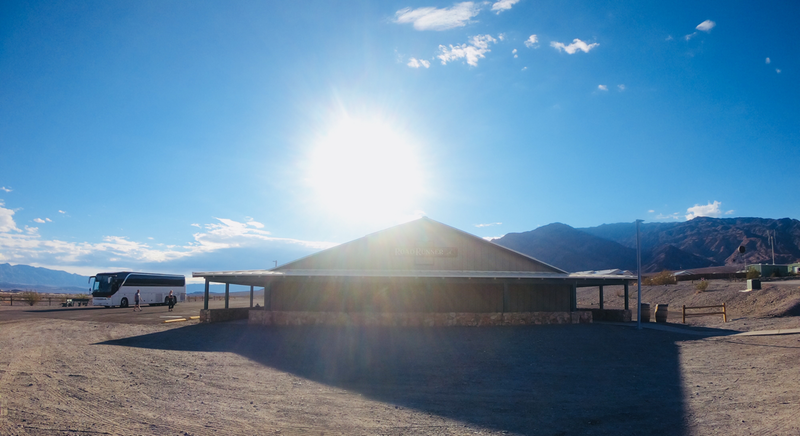 It is composed of sediments from Furnace Creek Lake which dried up 5 million years ago, long before Death Valley existed. 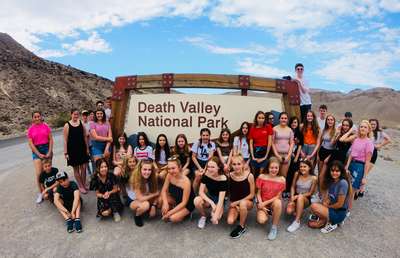 From her we took the opportunity for another group photo by the National Park sign before we made our way to the one and only Las Vegas! 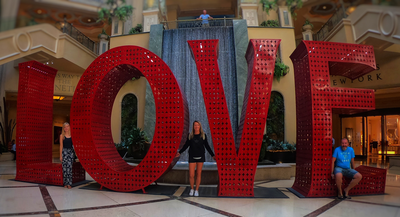 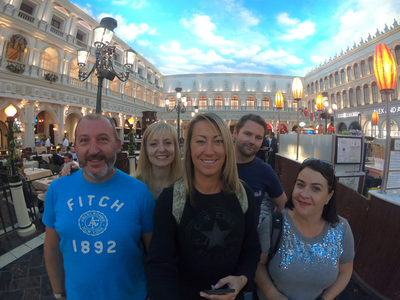 Our first stop in Vegas was the outlet mall where there were indeed some bargains to be had. We returned to our coach hearing stories of the great offers that had been found with a sense of accomplishment; it is more than likely there will be a few new outfits being worn over the next few days. Once we had been wild in the aisles it was back to the bus and our new hotel. 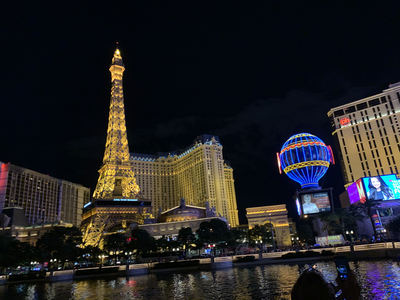 A quick freshen up in our new abodes for the next two nights and we were heading for the strip. 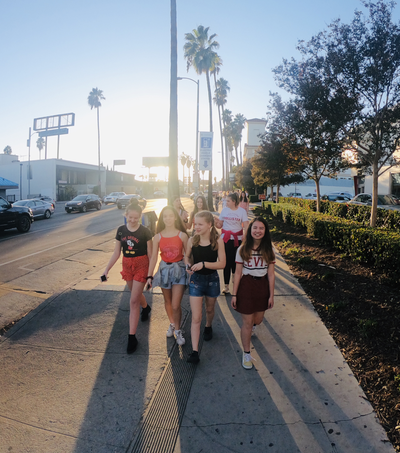 Walking with a school party of forty two is no mean feat but they all did excellently as we navigated our way through the crowds following our guide Evan. 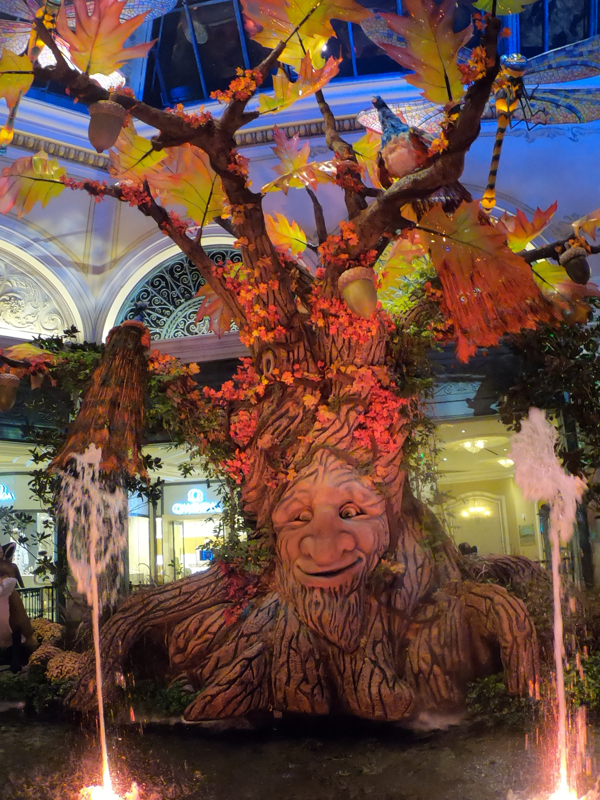 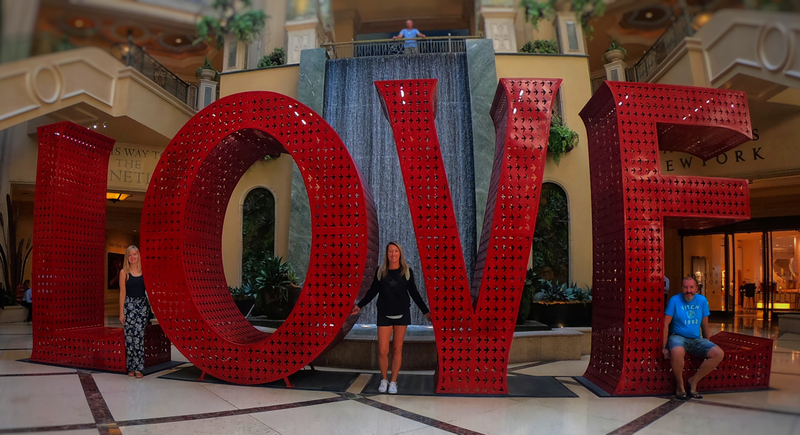 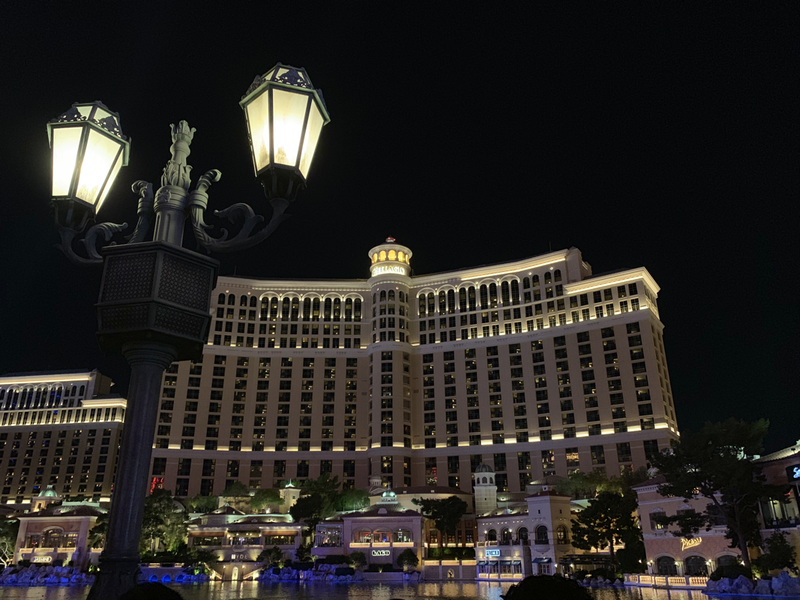 Our first stop found us outside the Bellagio where we saw their iconic fountain display. From here we went inside for our first buffet dinner, the range of delicacies and dishes was mind boggling; there really was something for everyone. 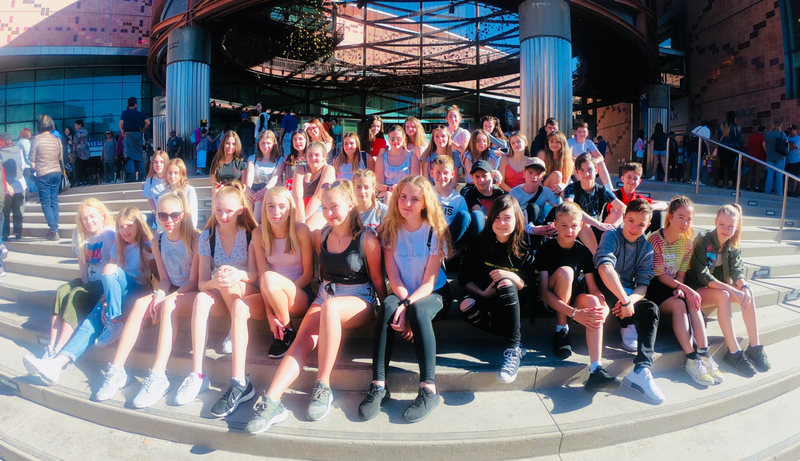 Once our stomachs were suitably filled we saw saw a seasonal display of autumnal colours and characters before we returned to our coach and hotel. 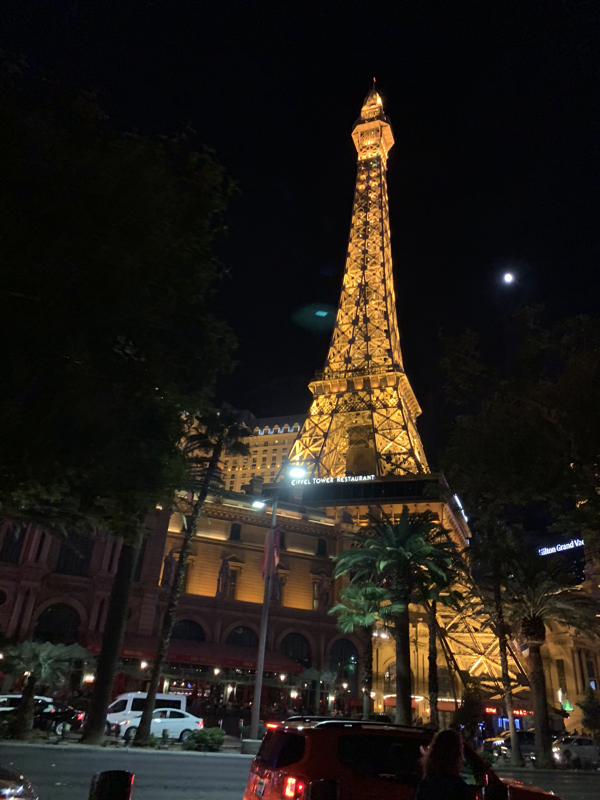 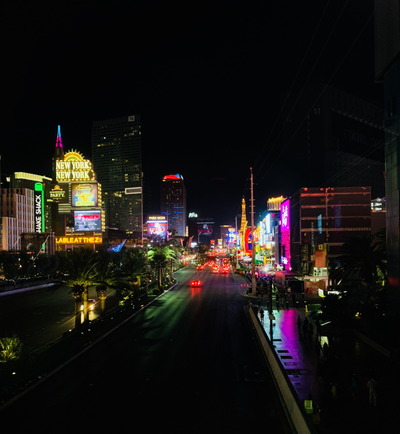 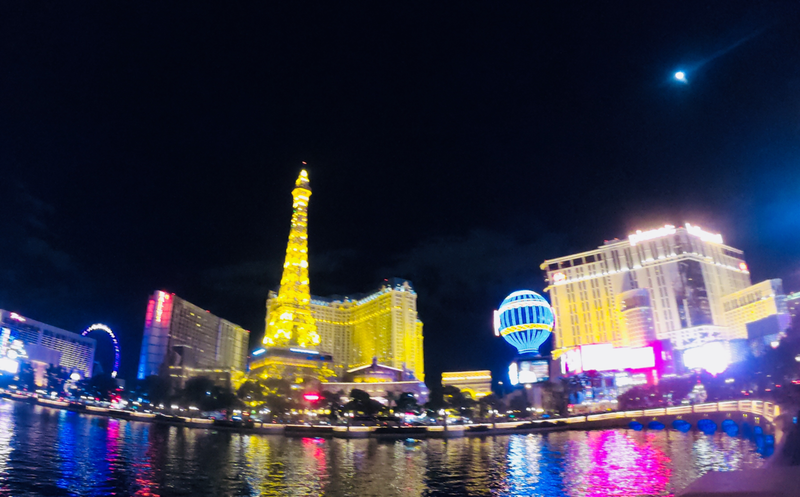 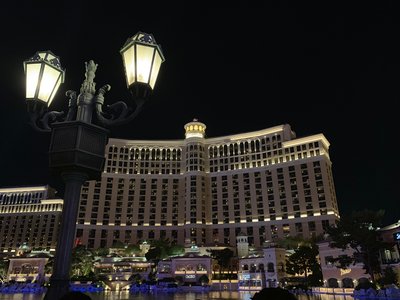 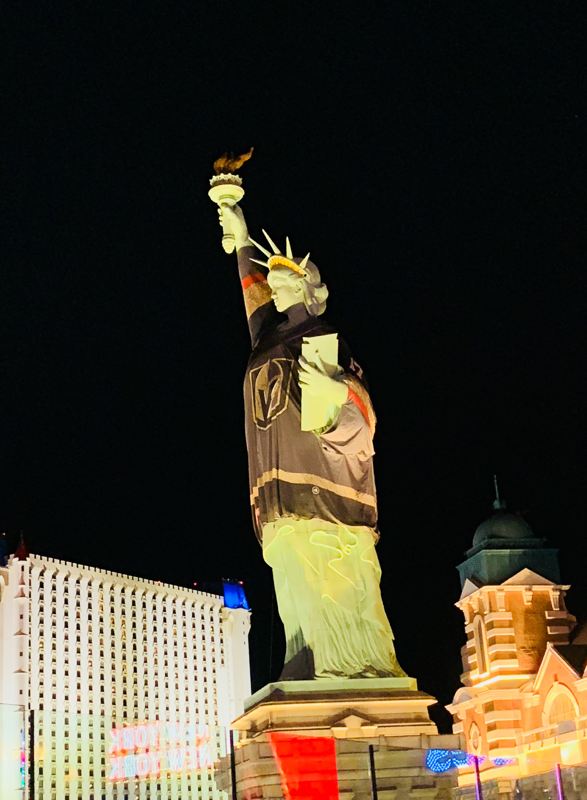 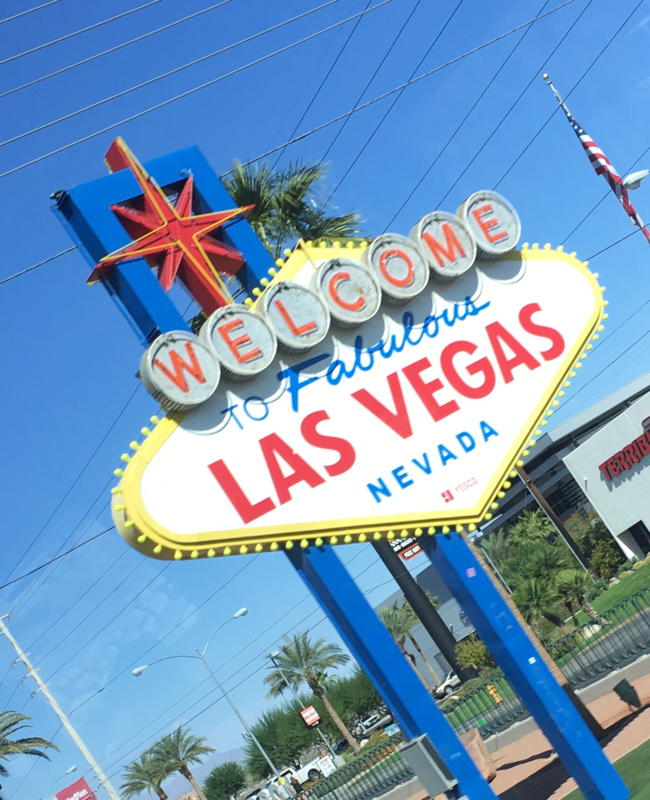 The walk had given us a real taste of Vegas by night with the bright lights, warm evenings and throngs of people. By the time we made it back to our driver, Salvador, we were all yawning contagiously. 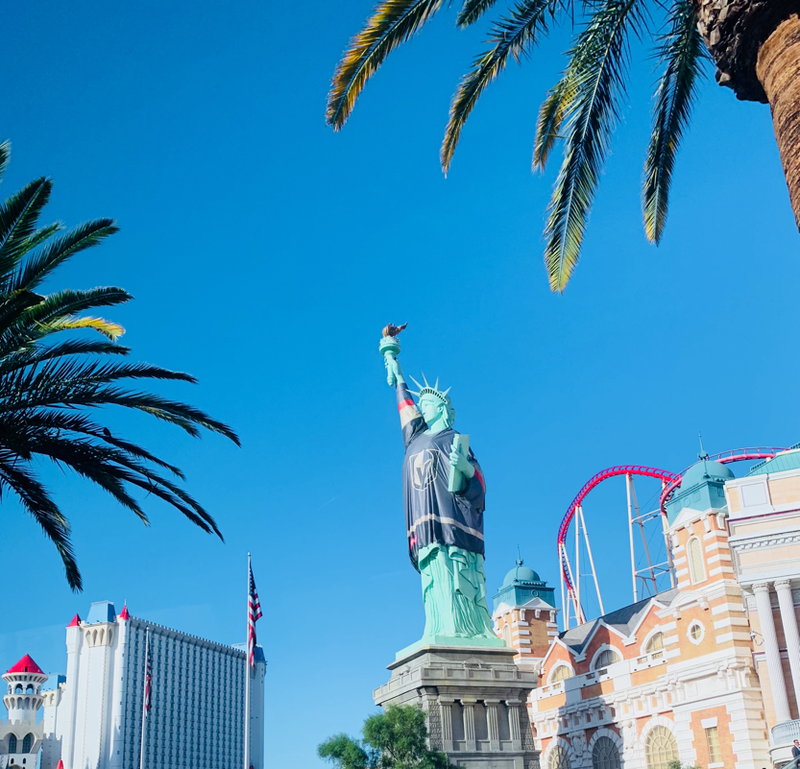 We made it to bed in good time to recharge for our second day in Vegas. 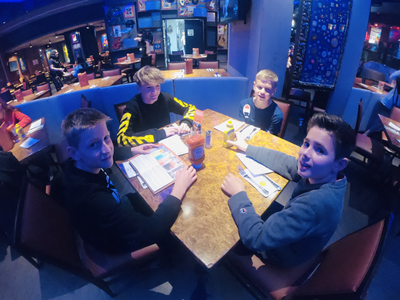 For breakfast today we decided to give the group an American diner experience and preordered our choices as a Denny’s. 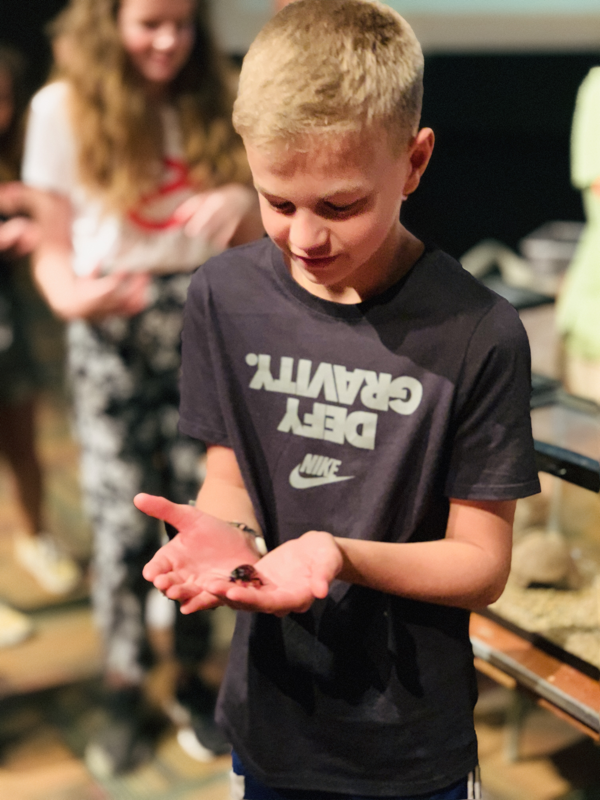 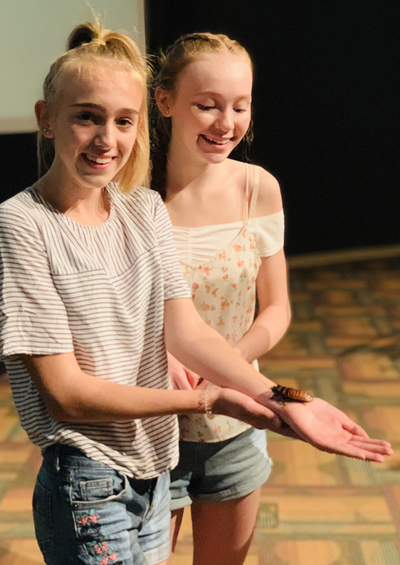 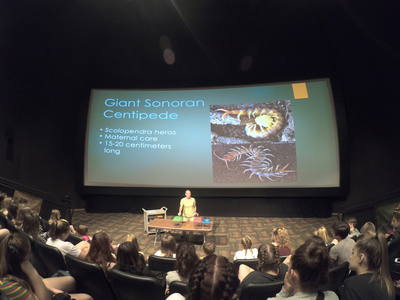 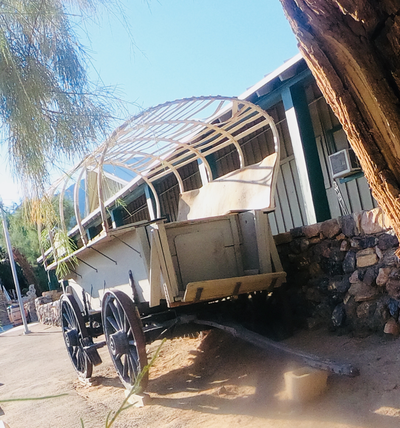 After refuelling ourselves with pancake stacks we were off to Spring Preserve to learn about the bugs and insects native to the desert land we were travelling through. 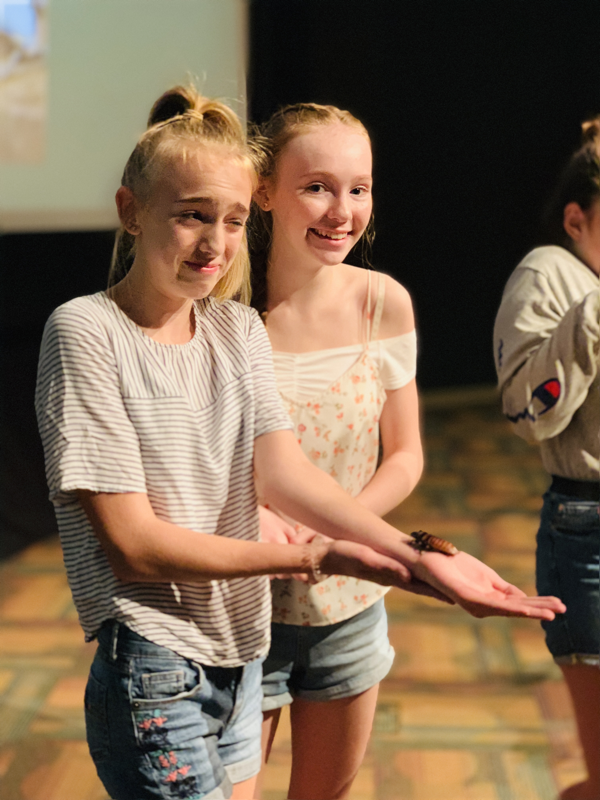 Katrina, the ‘bug expert’, handled and educated us on several different creatures including Death Feigning Beetles, Giant Sonoran Centipedes, Millipedes and Madagascan Hissing Cockroaches. We were also able to get up close to a tarantula and scorpion. 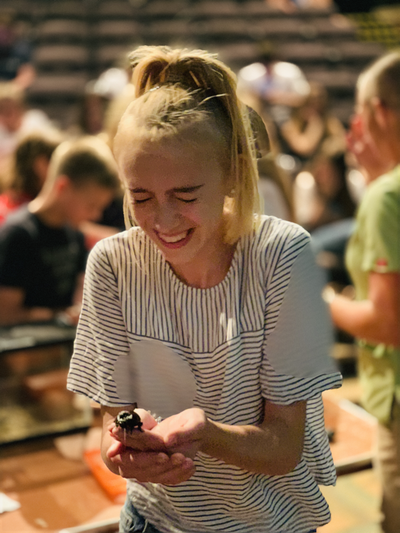 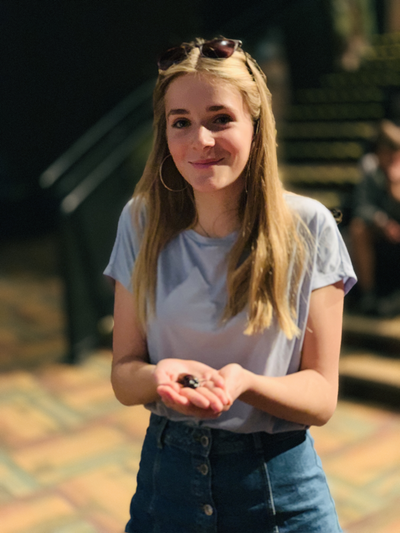 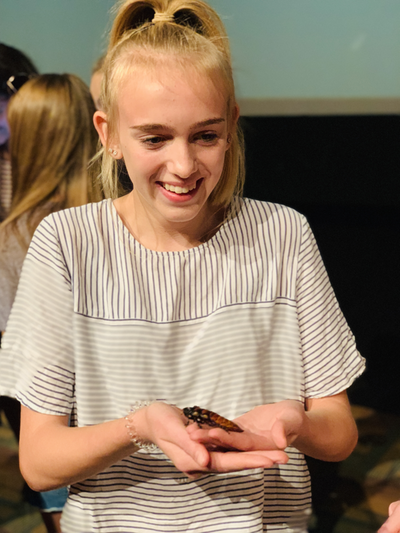 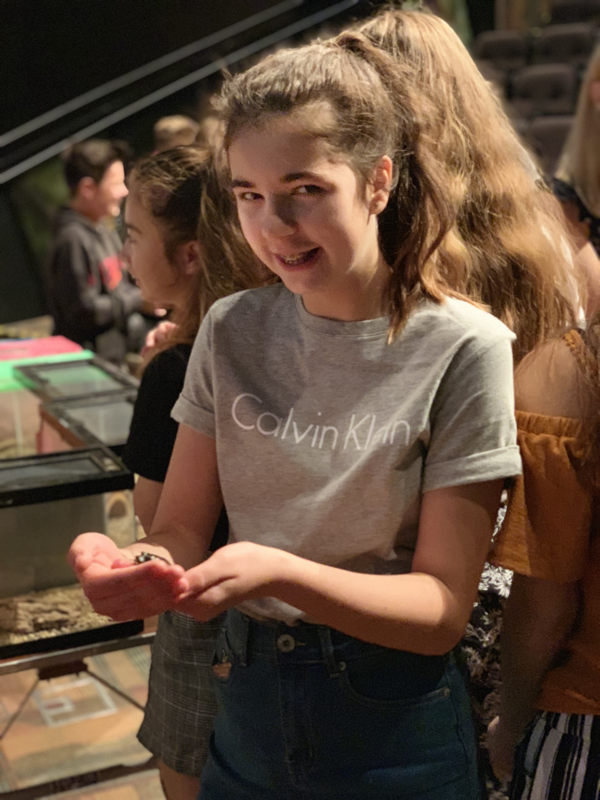 Some of the group were brave enough to handle some of the cockroaches which are used to being sociable. 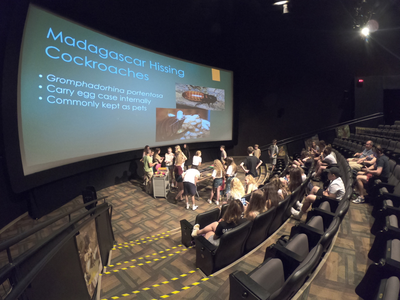 Thankfully, the scorpion and tarantula were left in their boxes for us to admire. From Springs Preserve we hit the road again. 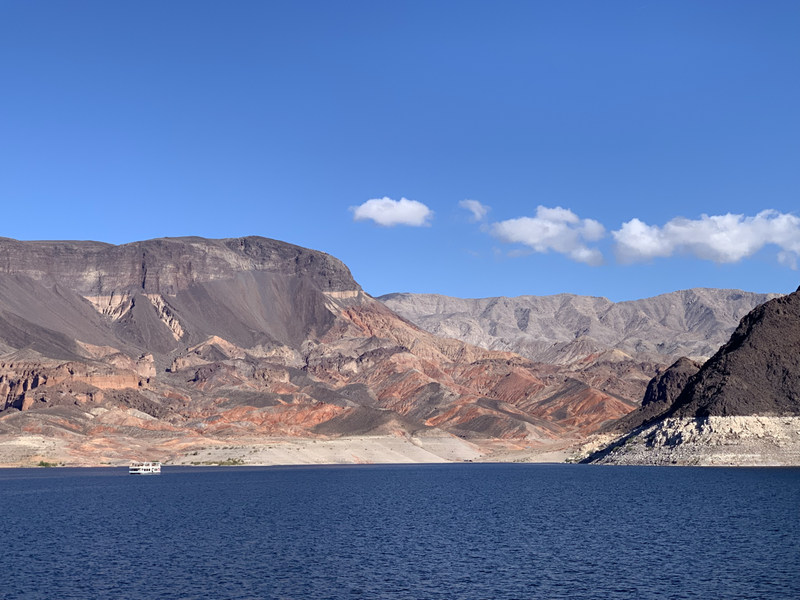 Twenty five miles out of Vegas the road turned and gave way to the incredible blue expanse before us. 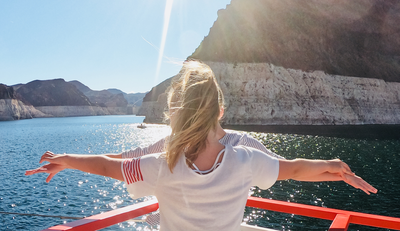 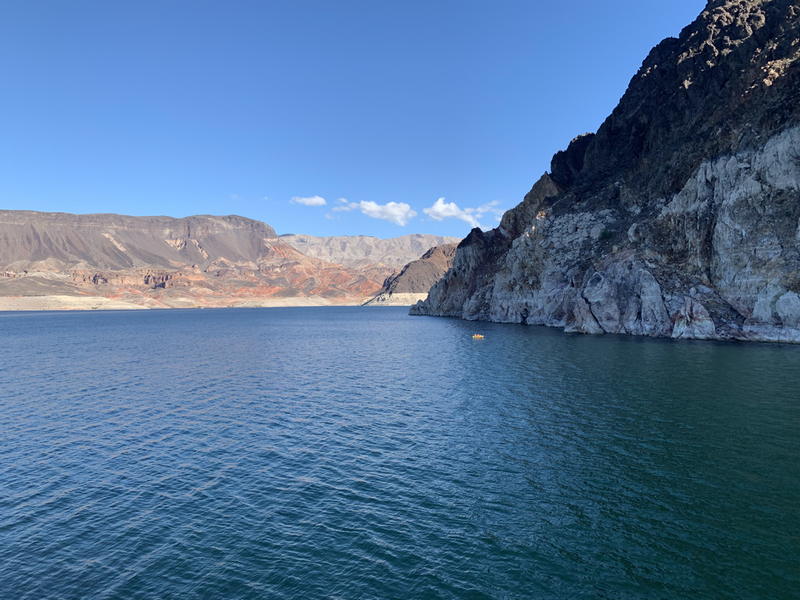 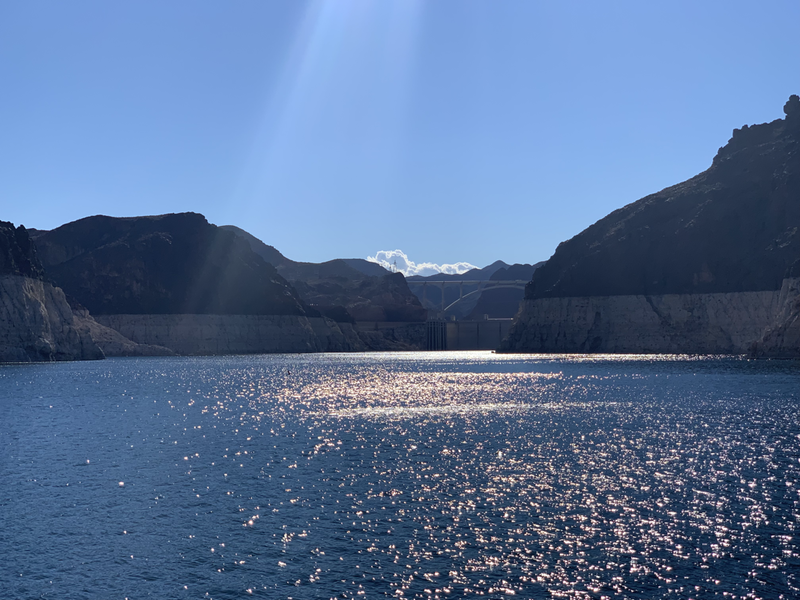 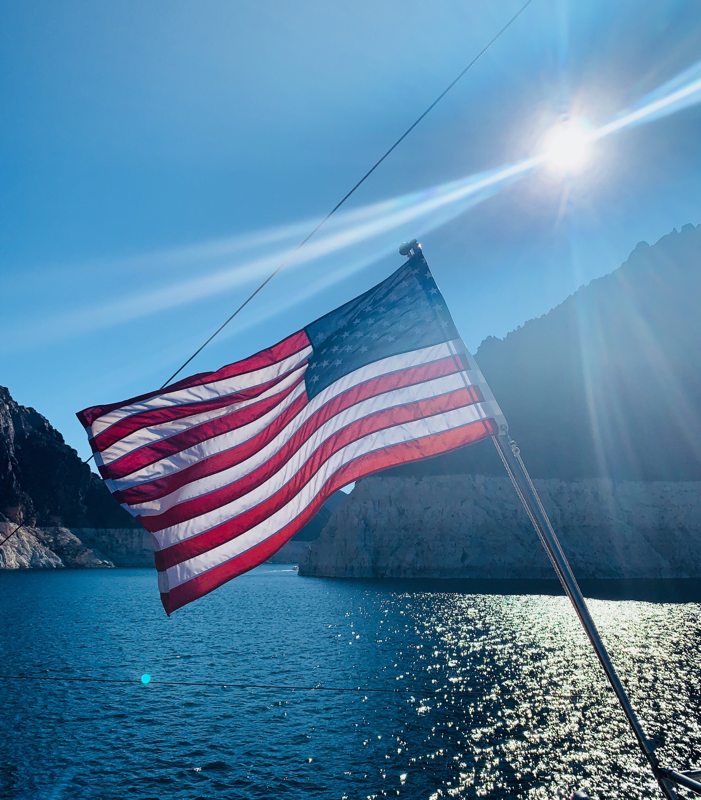 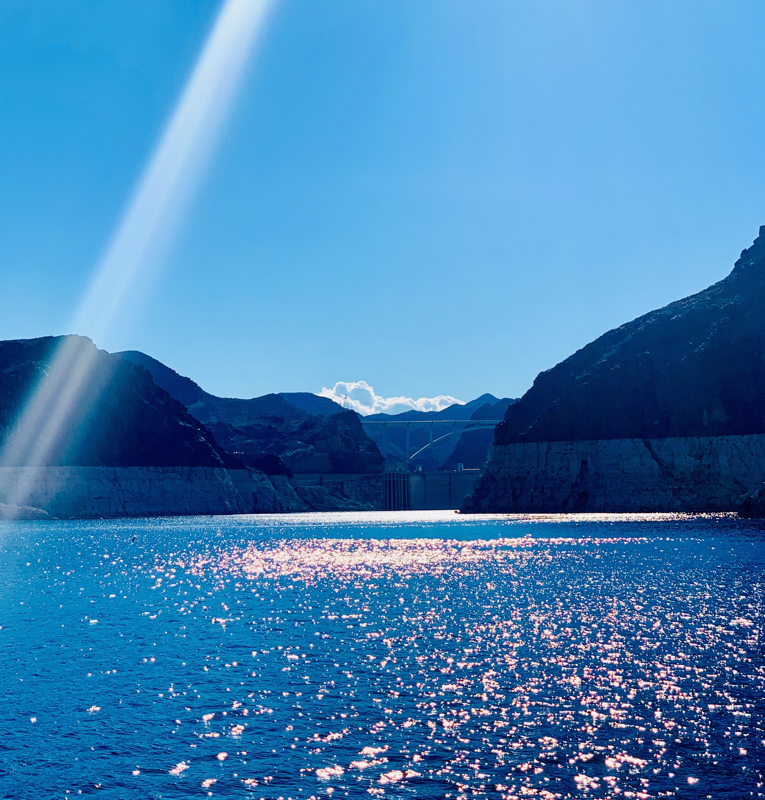 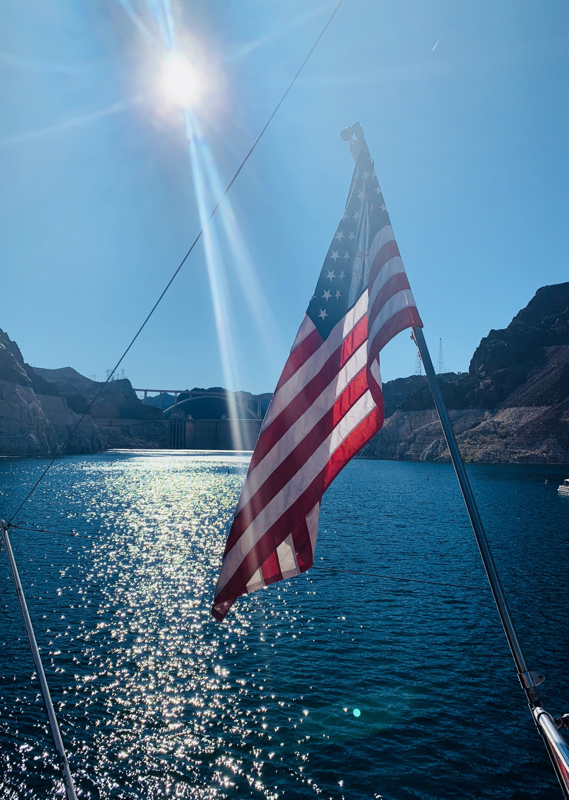 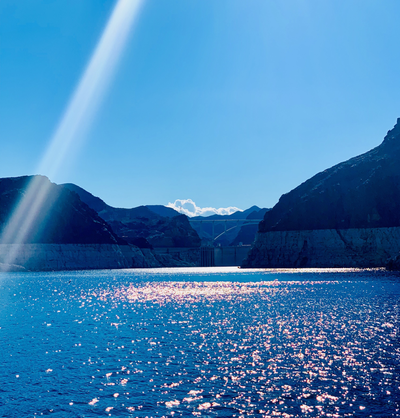 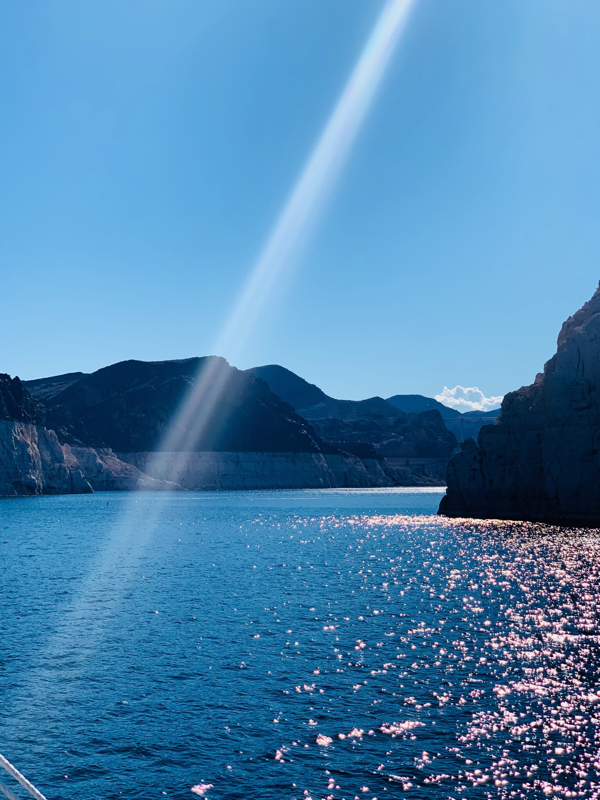 Lake Mead was shimmering in all it’s glory; the water was in complete contrast to the brown and reds of the rocks surrounding it and was simply breath taking. 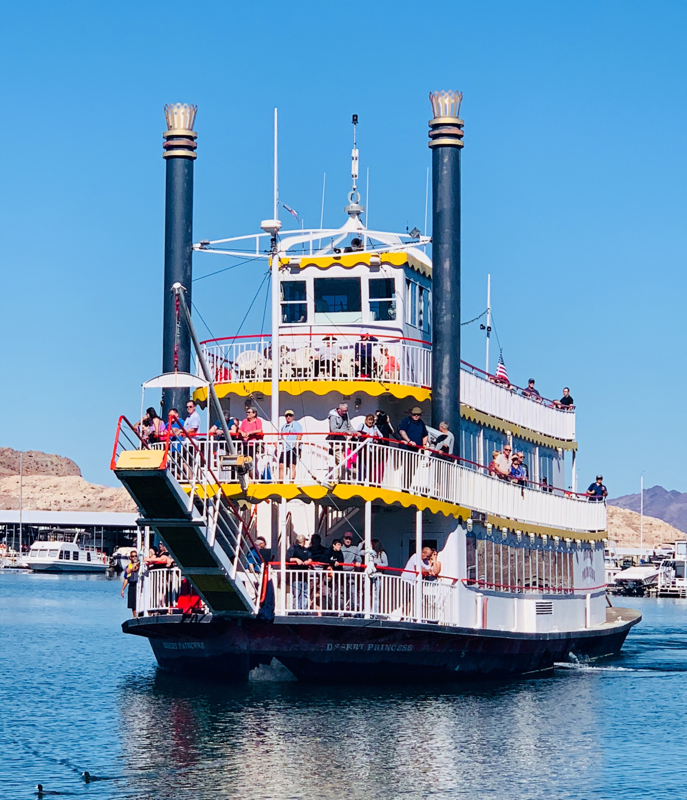 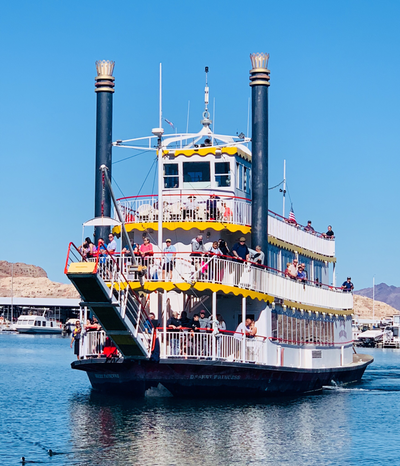 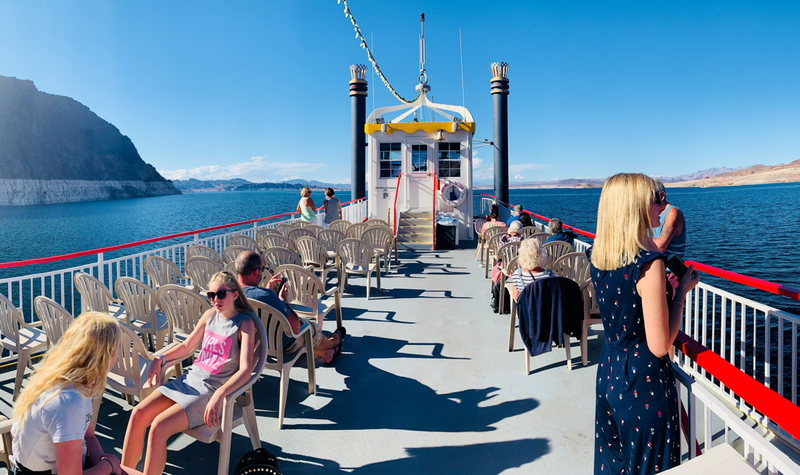 We made our way down to the jetty and waited for our boat, the Desert Princess to come in. 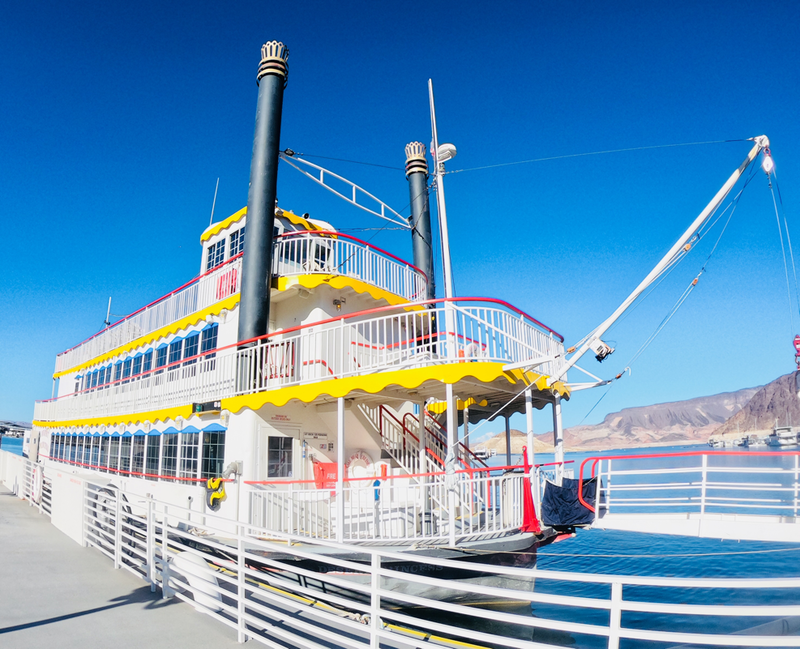 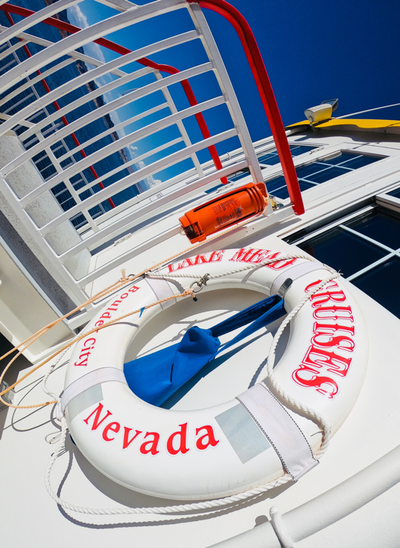 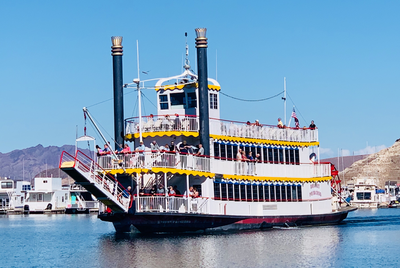 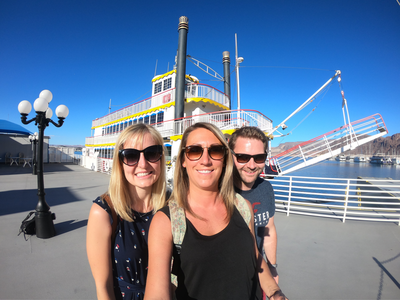 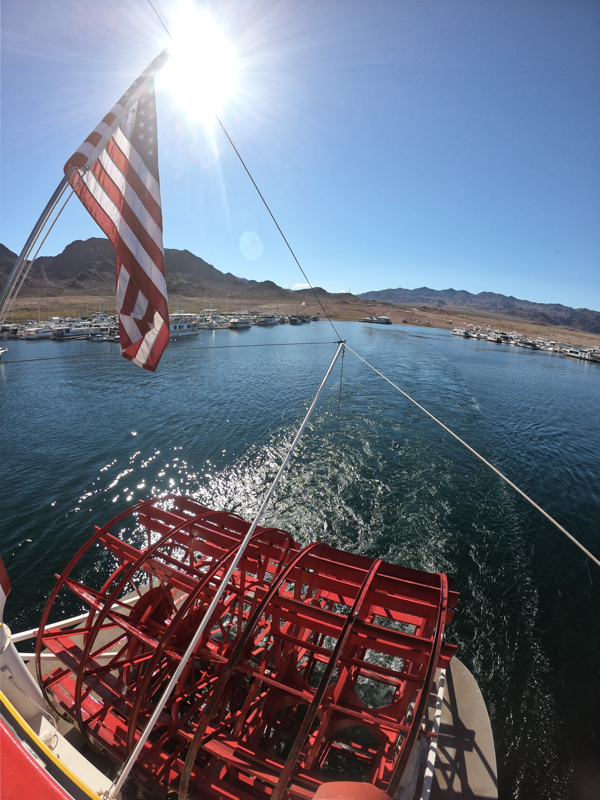 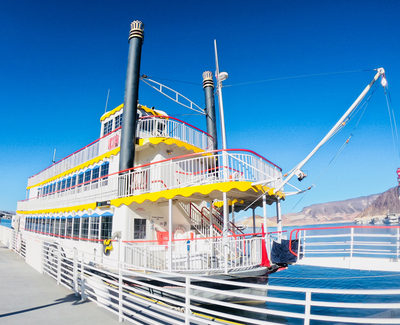 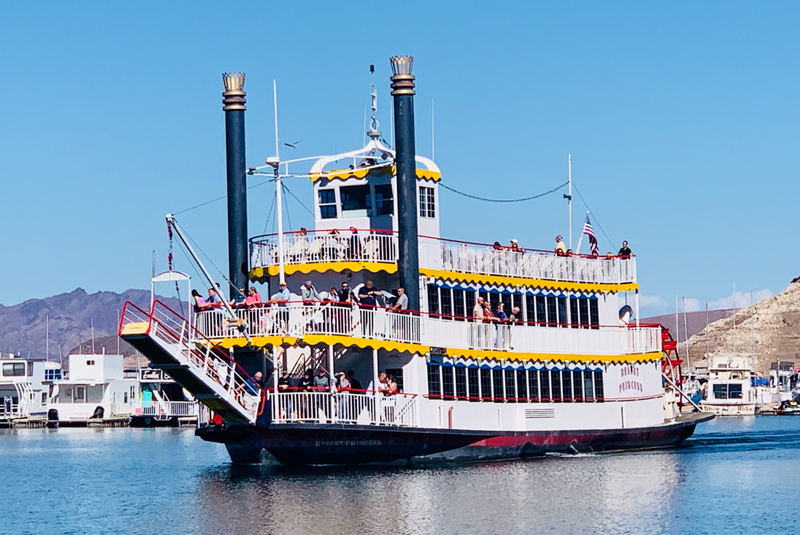 We soon boarded our 3 level Mississippi-style paddlewheeler with most of us making our way to the top for the panoramic views. 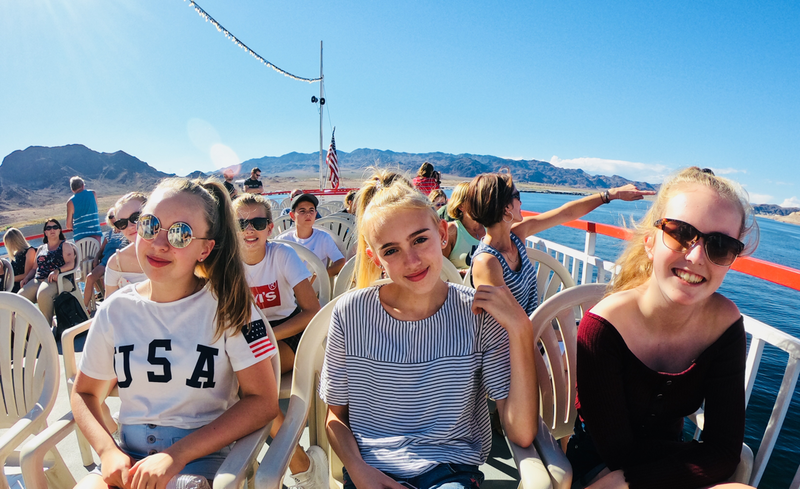 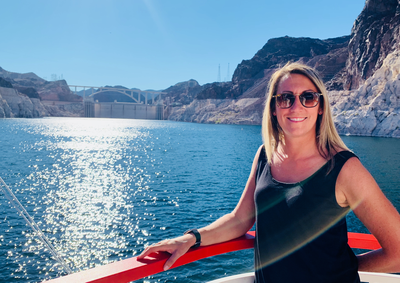 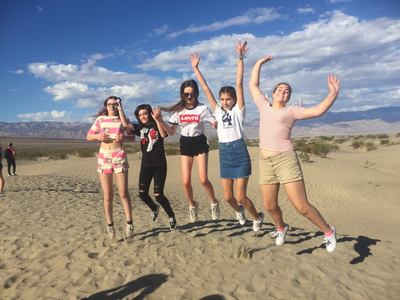 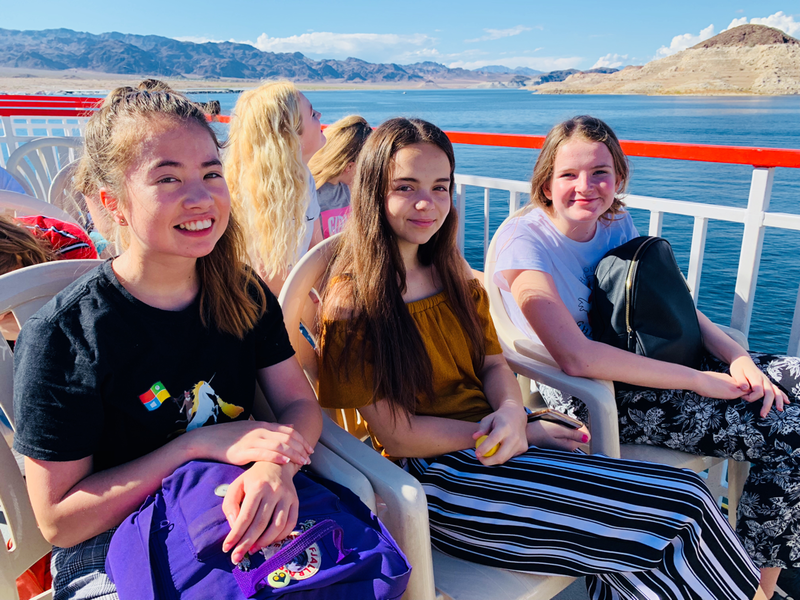 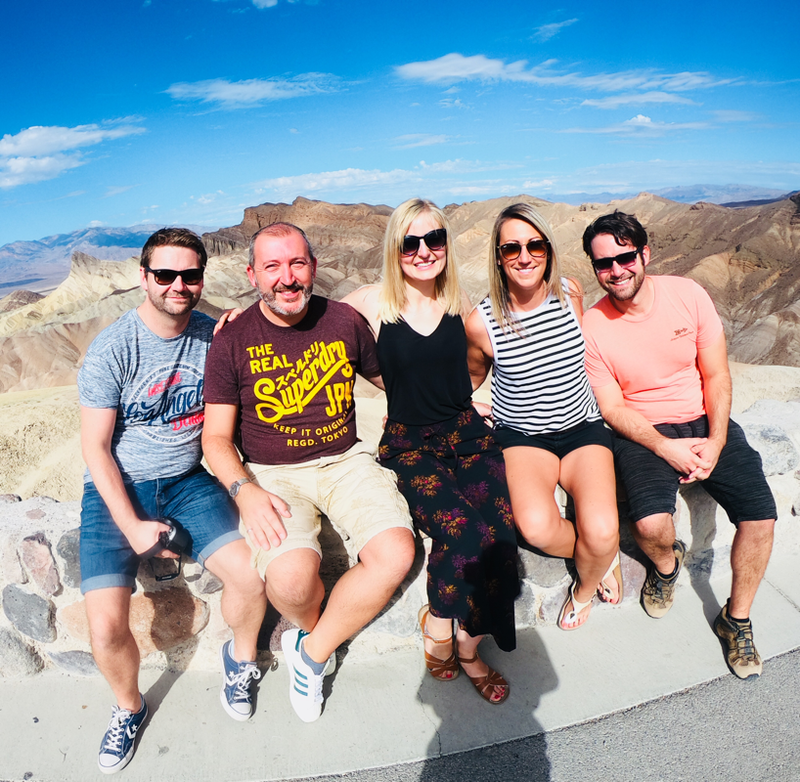 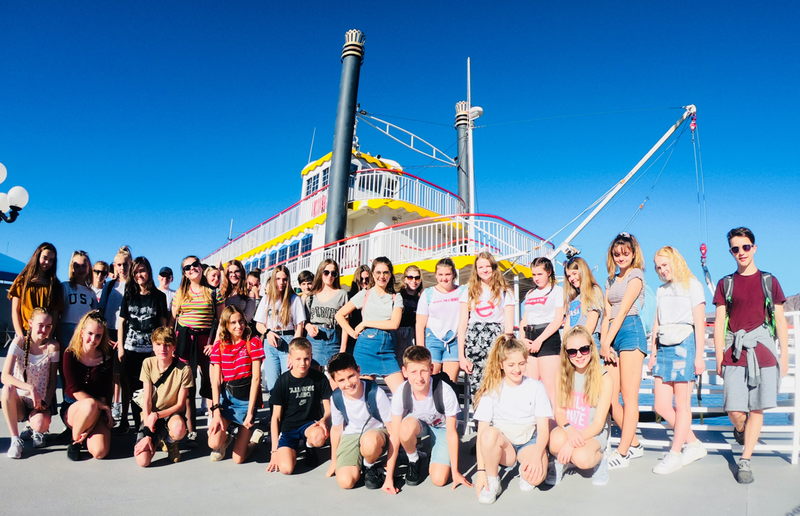 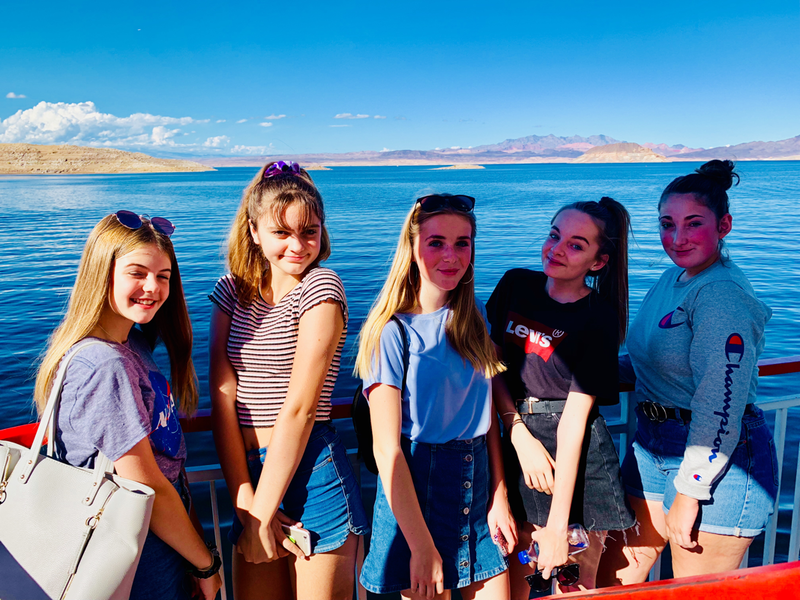 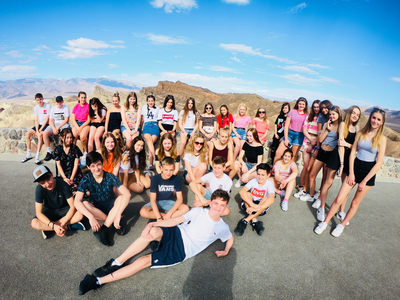 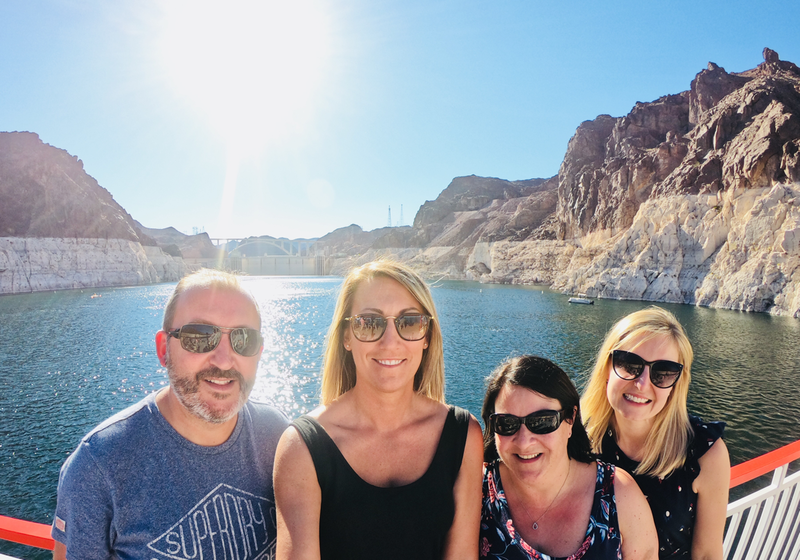 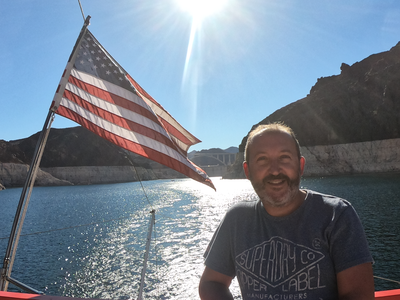 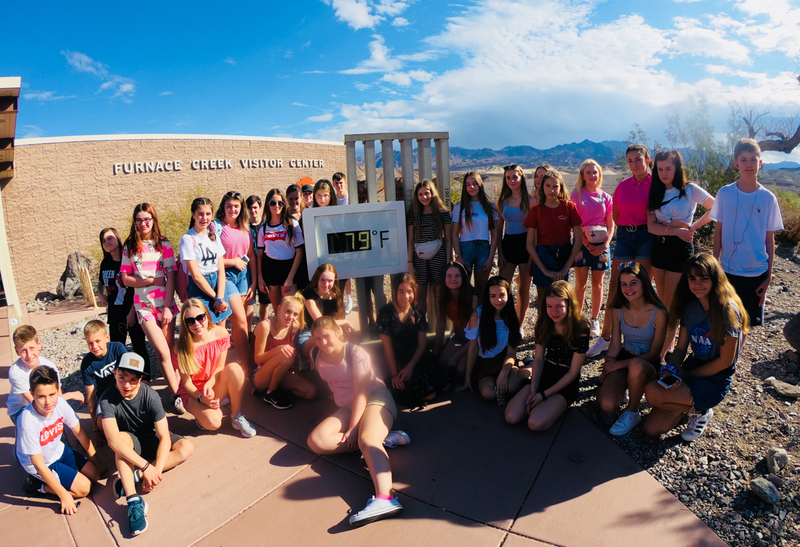 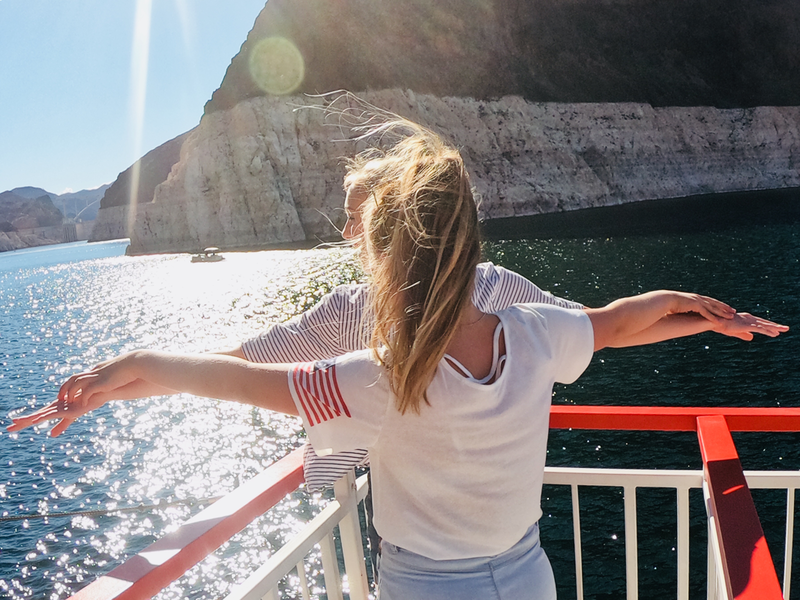 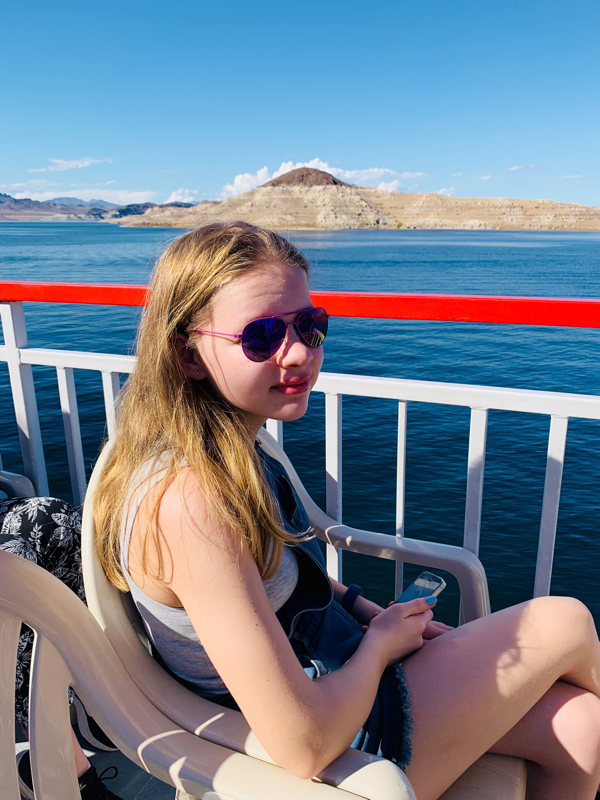 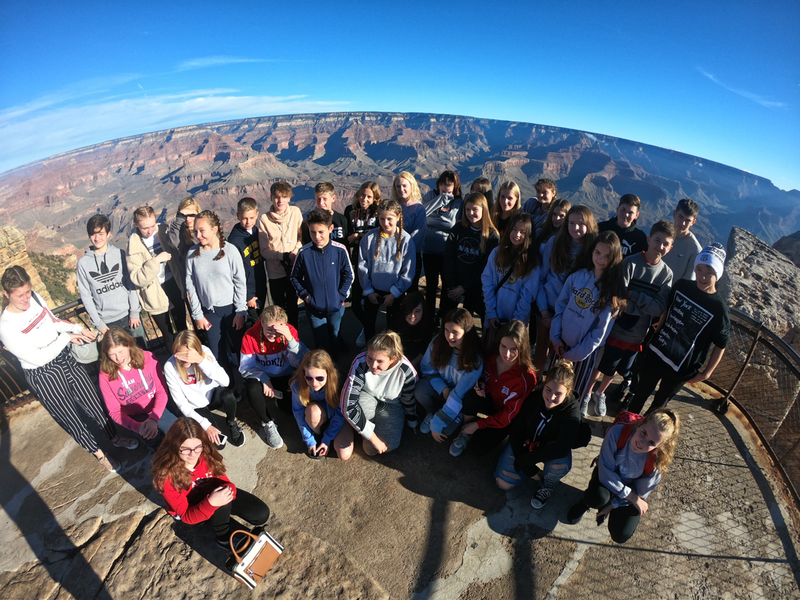 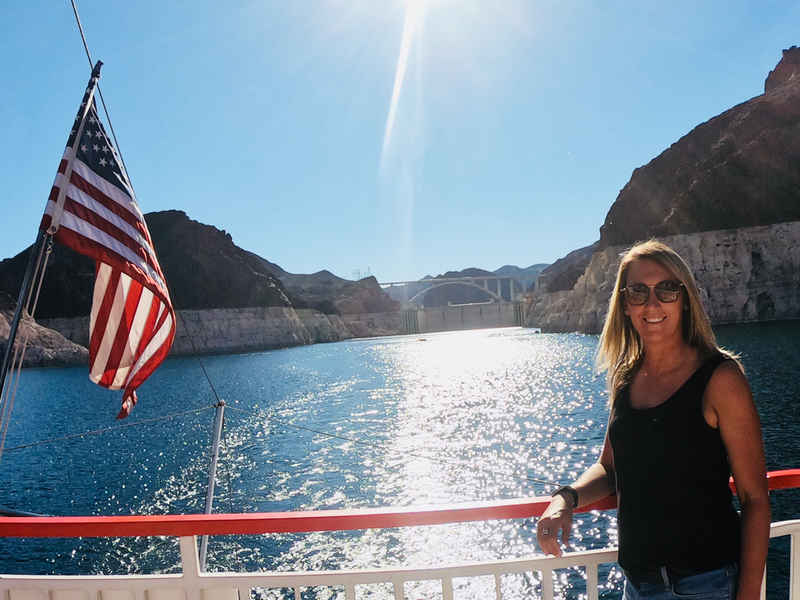 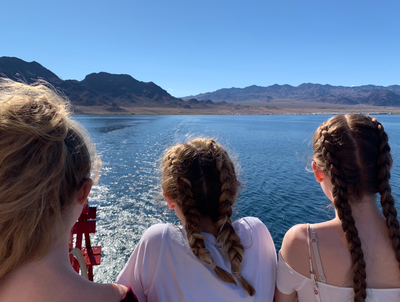 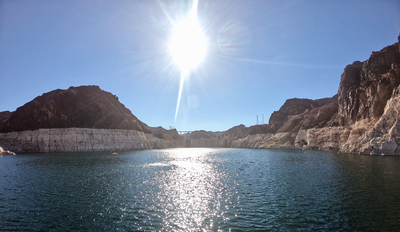 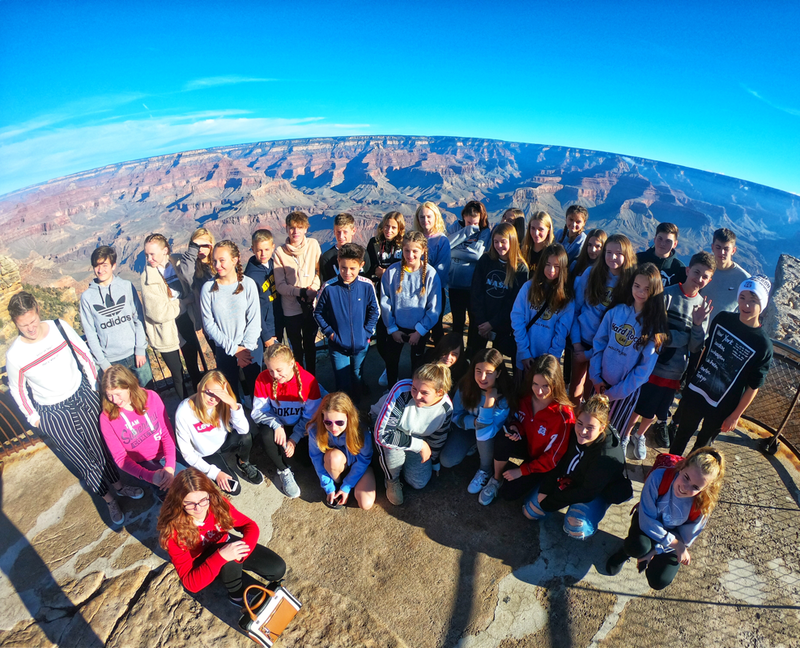 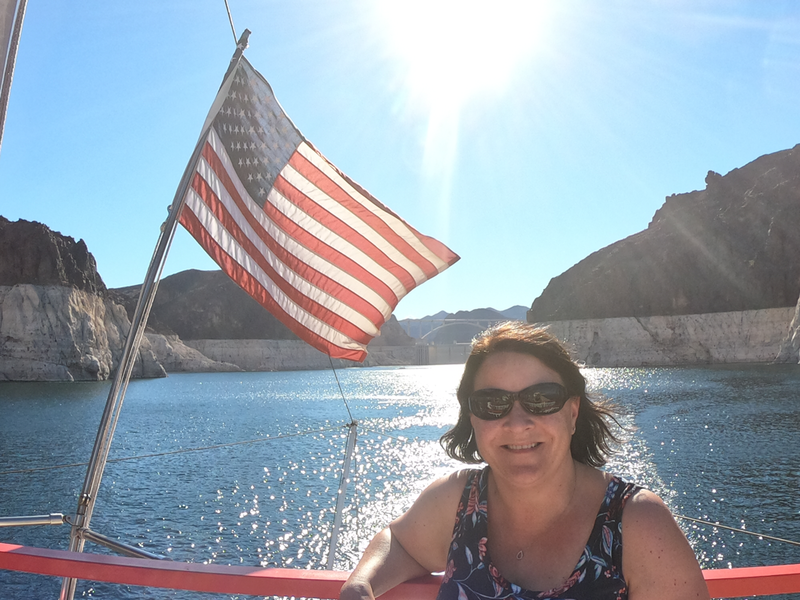 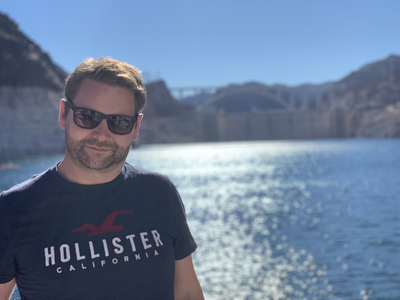 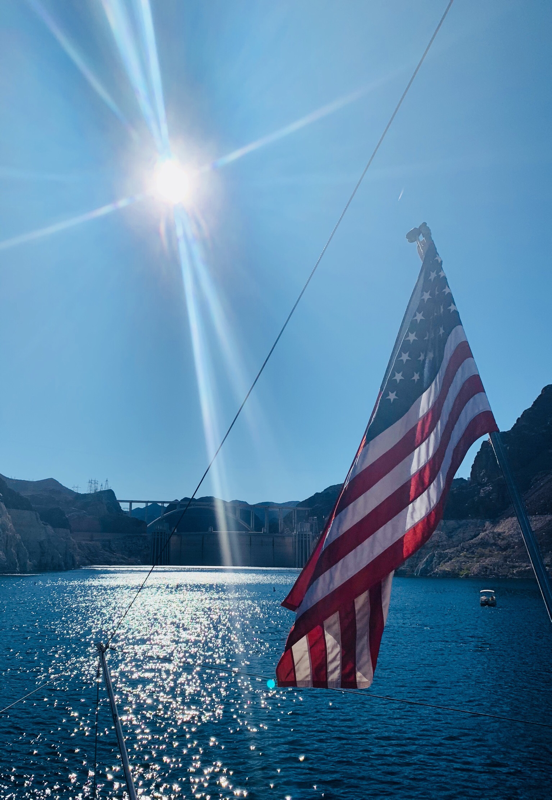 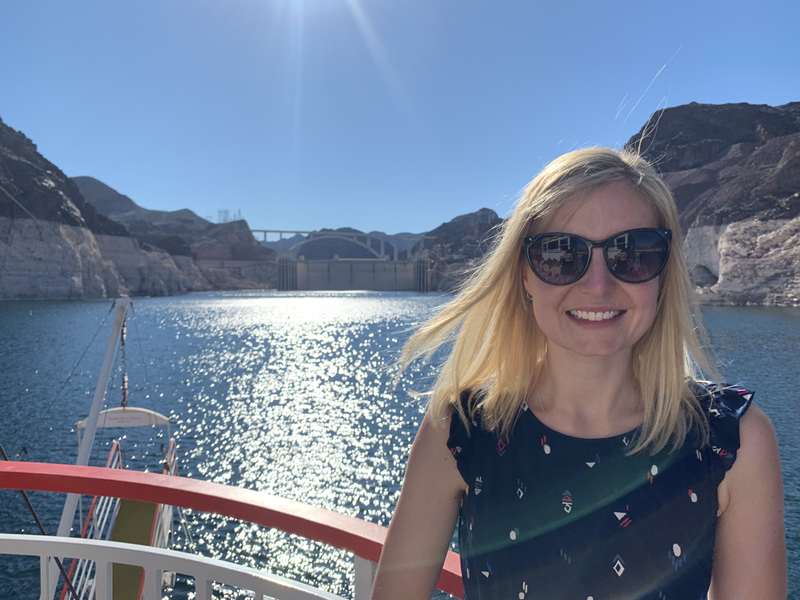 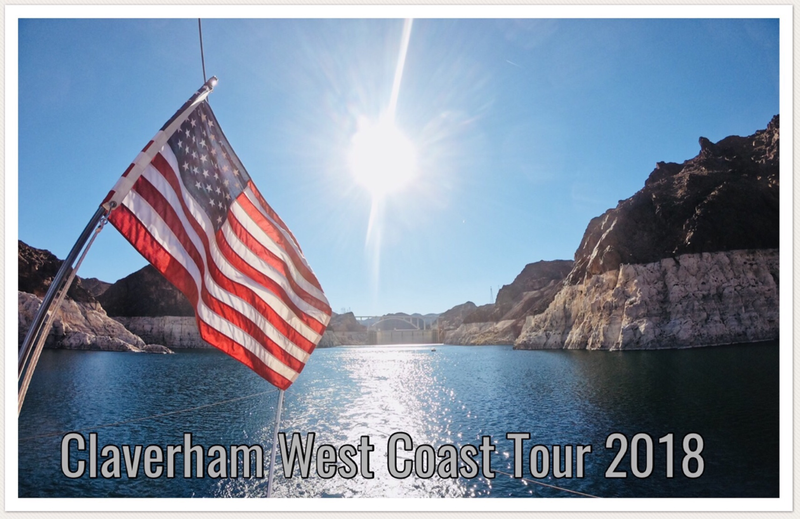 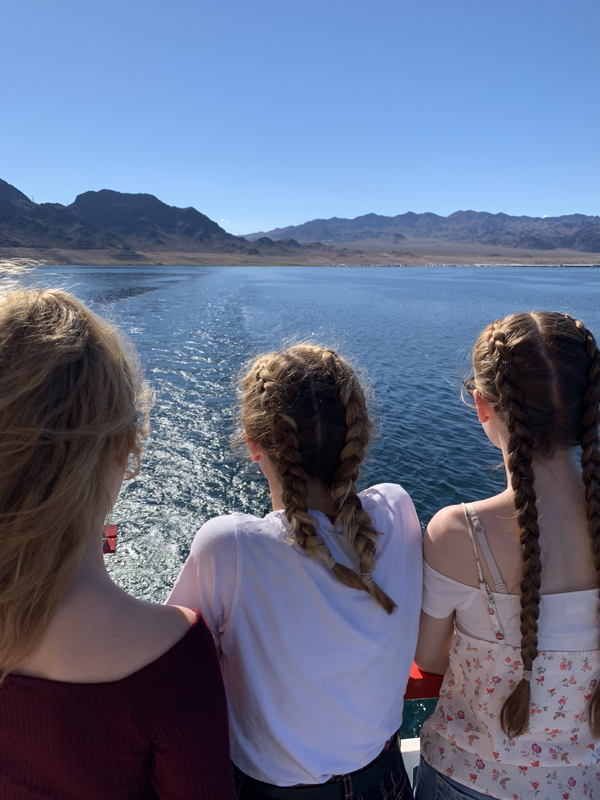 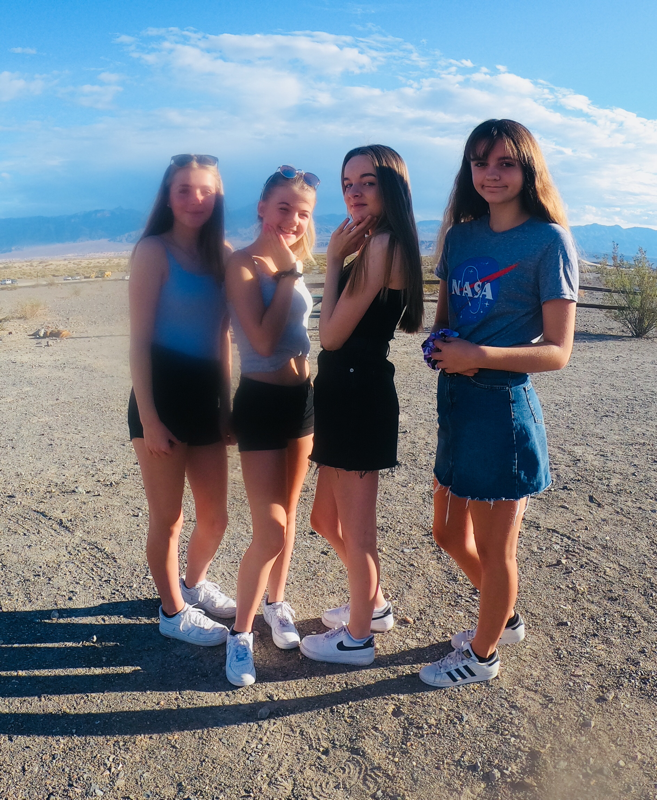 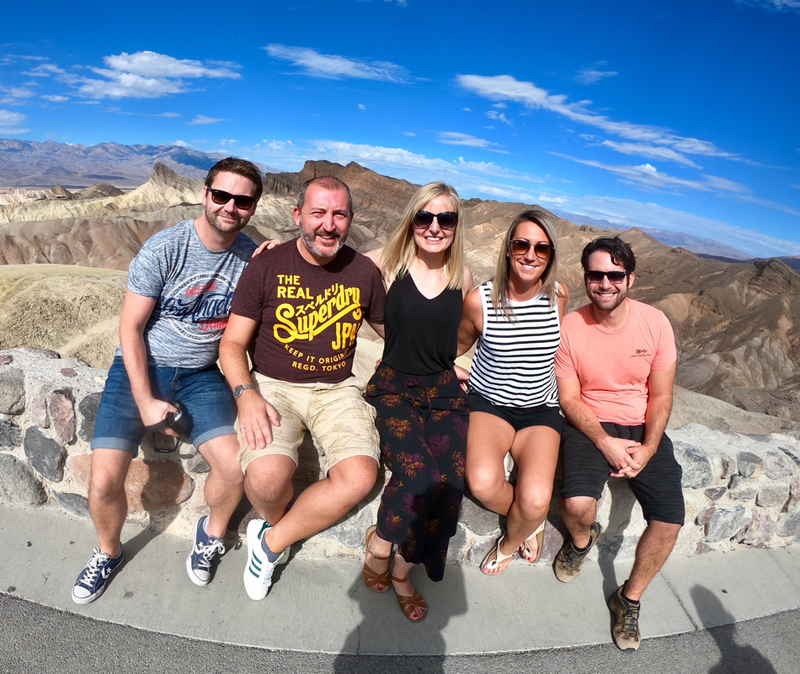 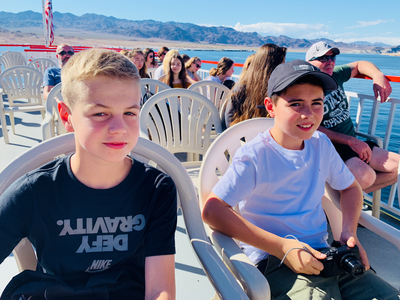 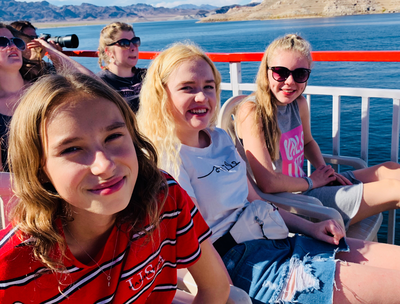 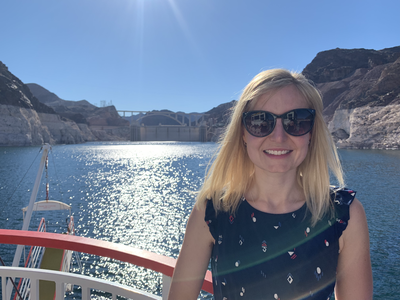 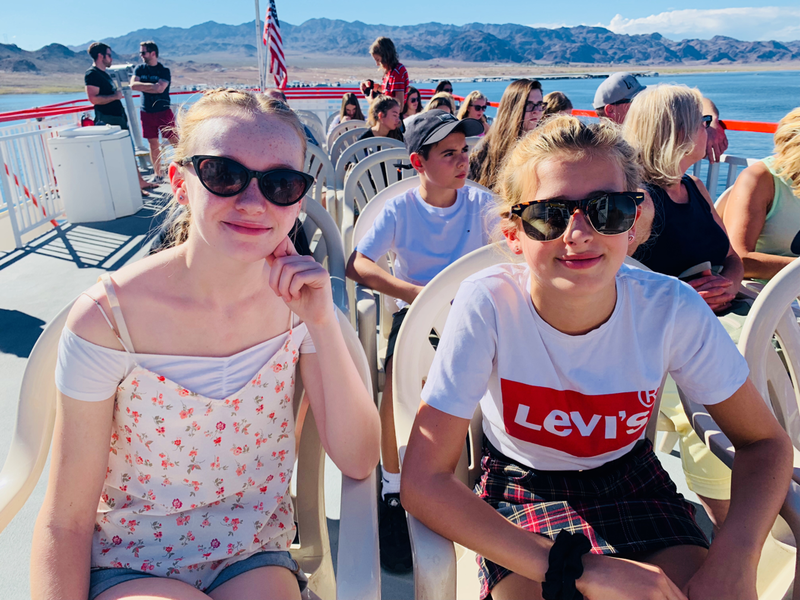 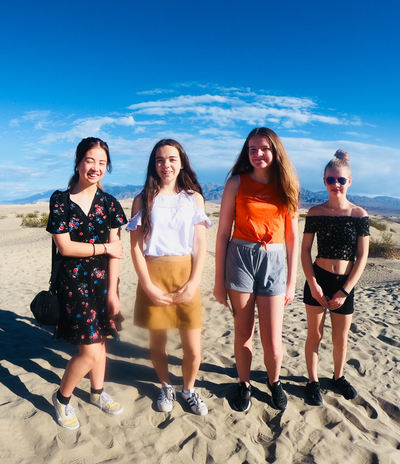 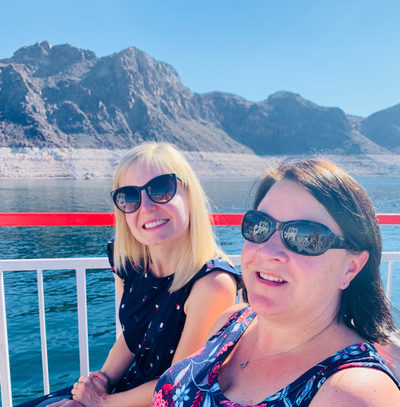 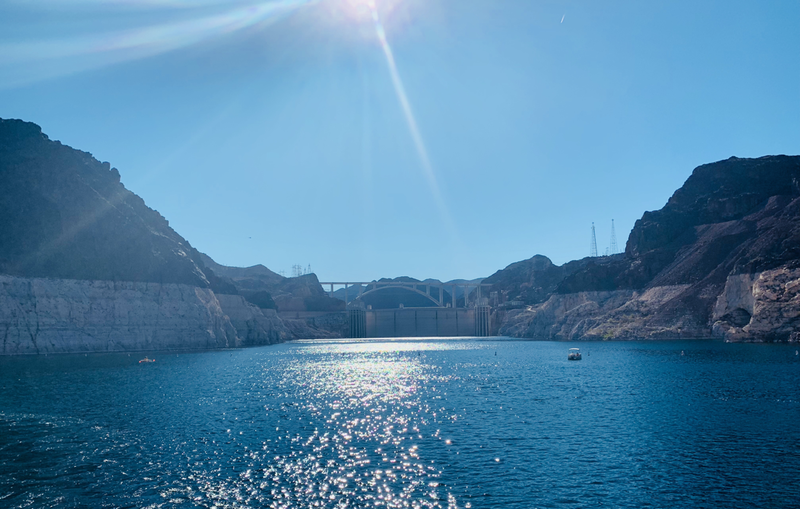 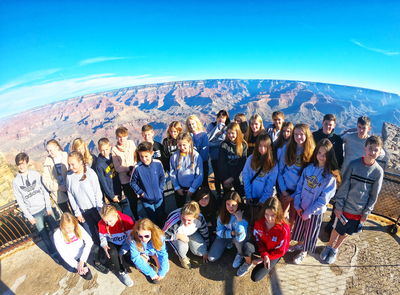 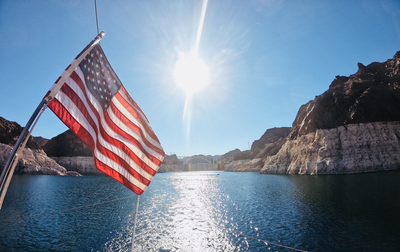 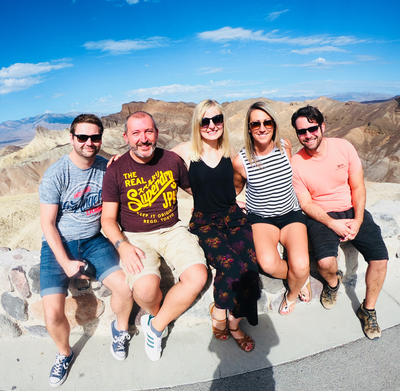 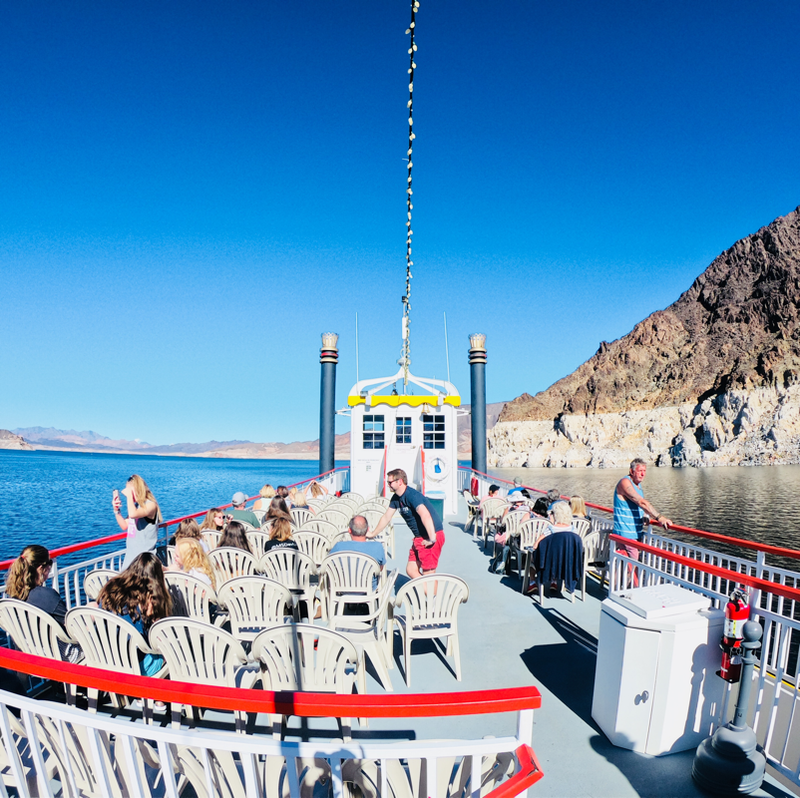 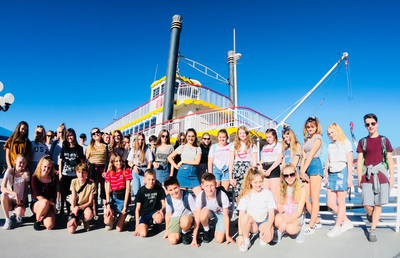 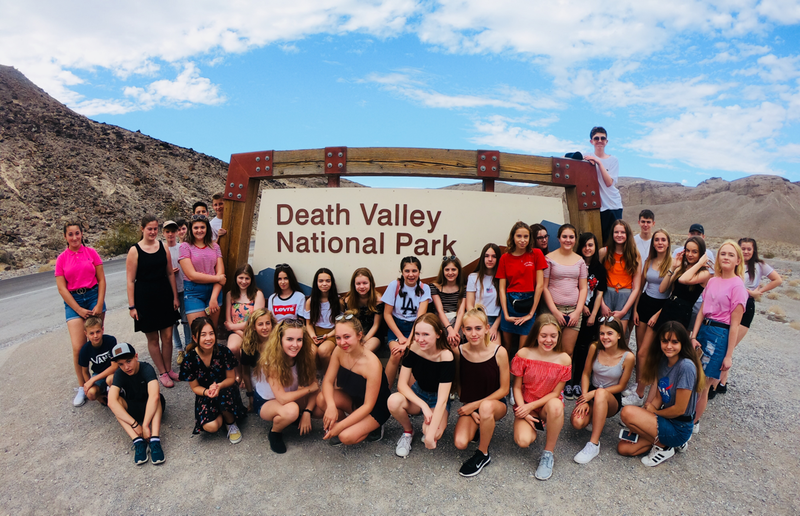 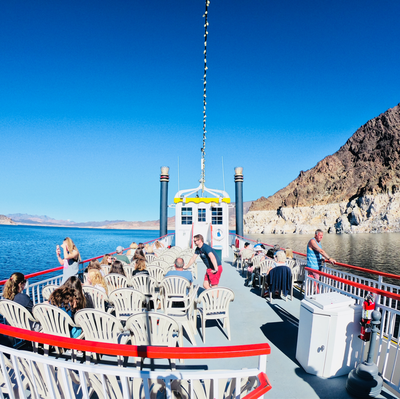 We leisurely made our way towards the Hoover Dam as the sun shone down taking yet more photographs as we took in the picturesque scenery. 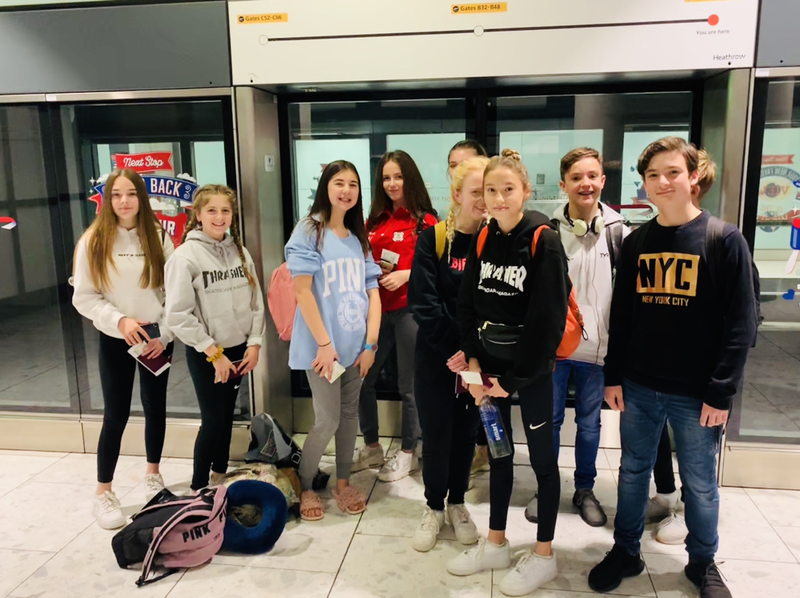 The group were absolutely fantastic and led to staff and passengers complimenting them and us on how polite and personable they were. 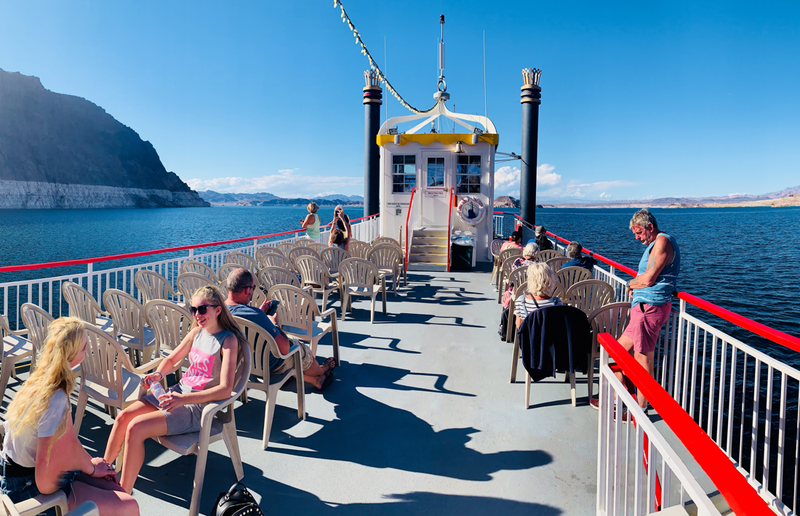 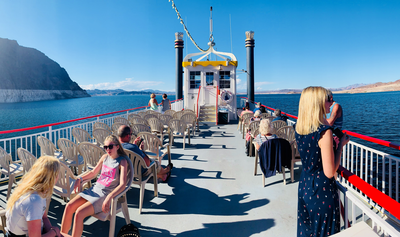 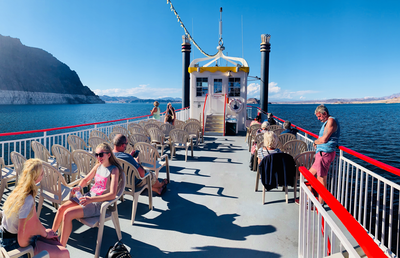 It was a lovely and relaxing way to spend the afternoon on what is quite a jam packed holiday. 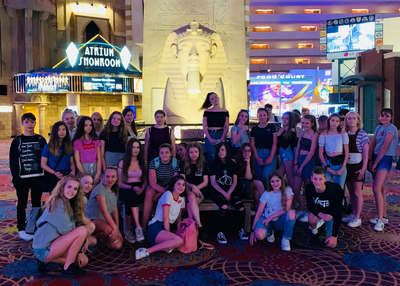 After our 3 hour tour it was back onto the coach to head back to our hotel to freshen up before our evening’s entertainment. 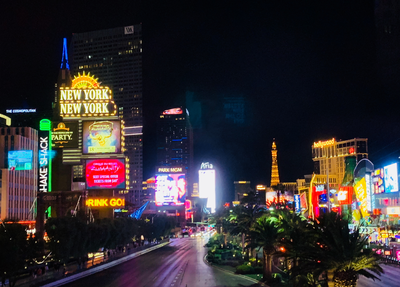 Once back on the strip we made our way to the hotel New York New York. There was a buzz of nervous energy as we escalated the levels of the hotel. 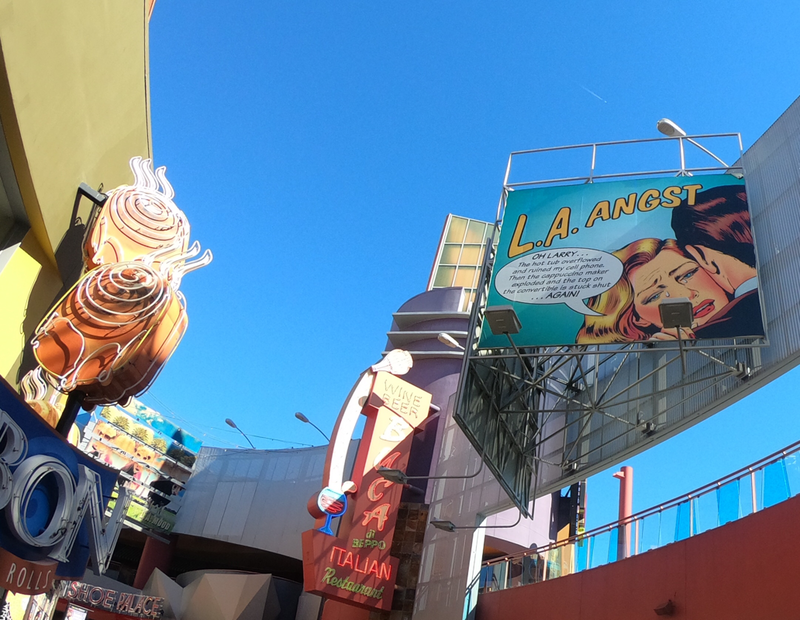 After going through a large games arcade we arrived at our next activity; The Big Apple Coaster! They boarded the New York cab style carriages, were buckled in and wide eyed as they pulled away.The screams of what we hope was joy started instantly and faded as the coaster roared away. 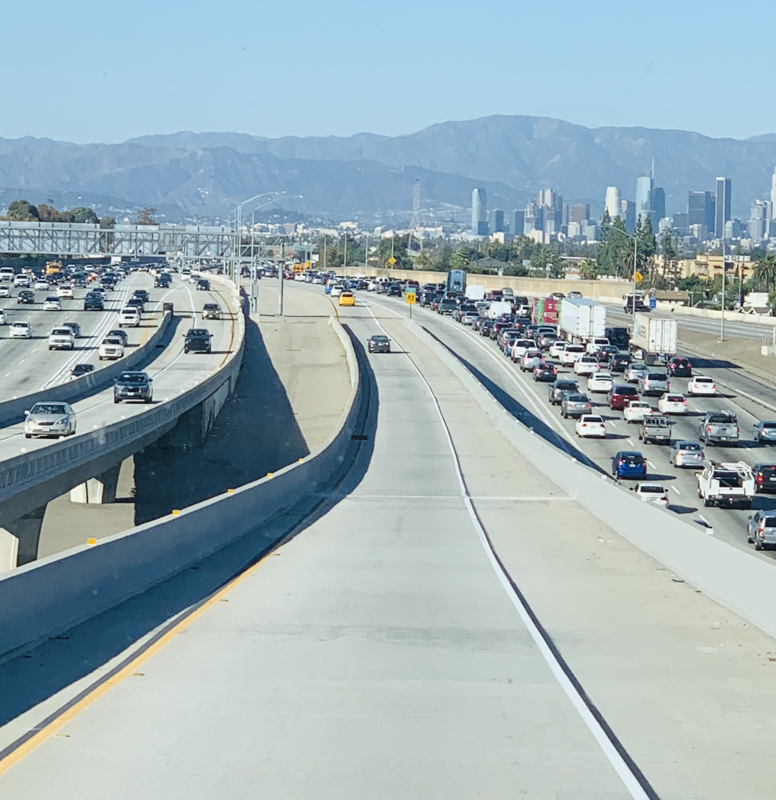 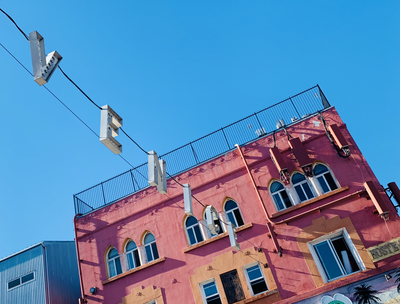 The ride gave way to fantastic views over Vegas, albeit if you blinked, you missed them and only had seconds to take them in before the carriages hurtled downwards and looped the loop. 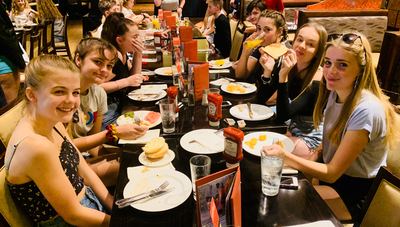 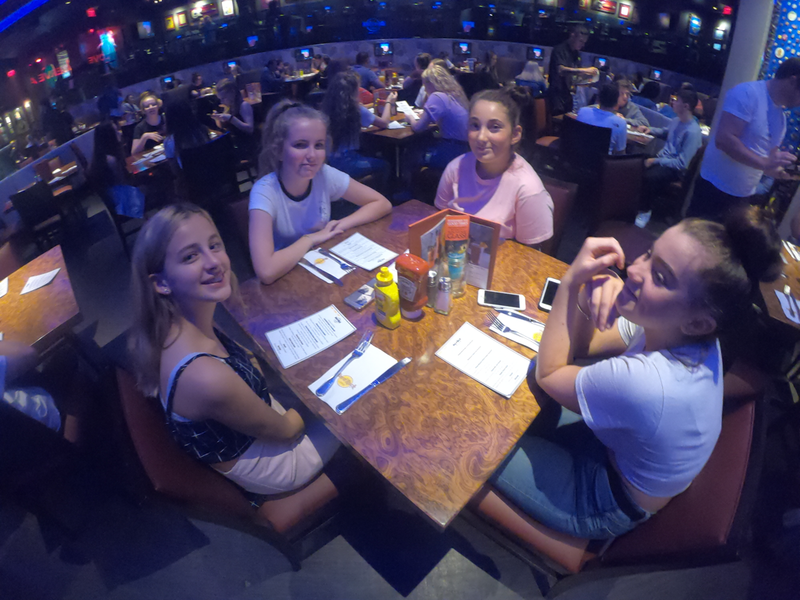 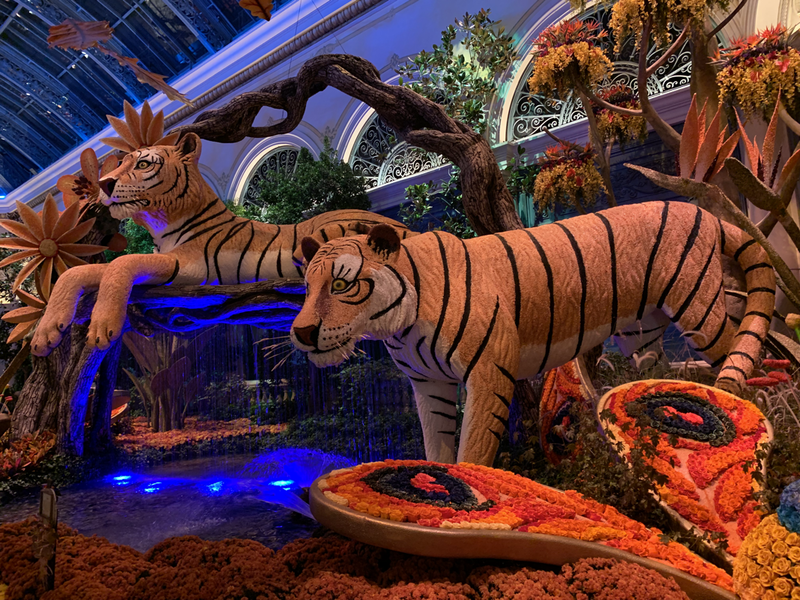 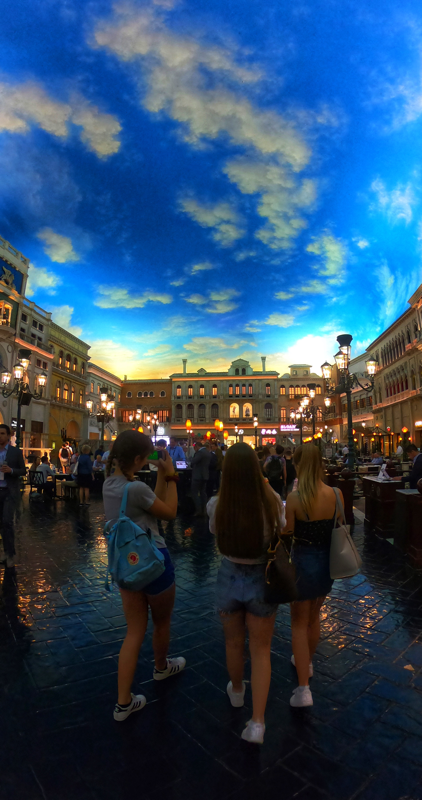 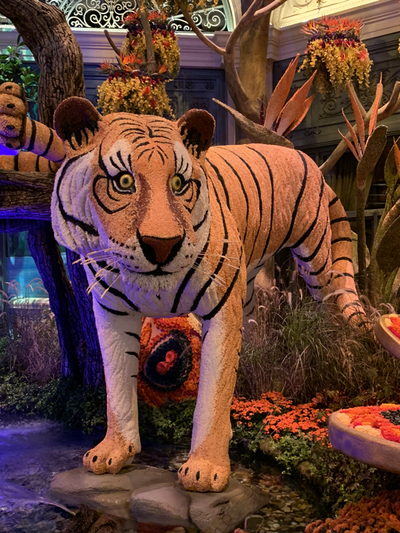 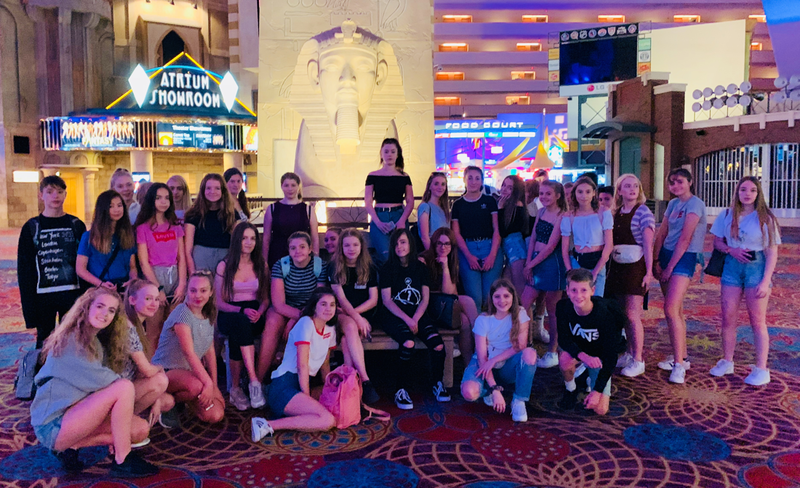 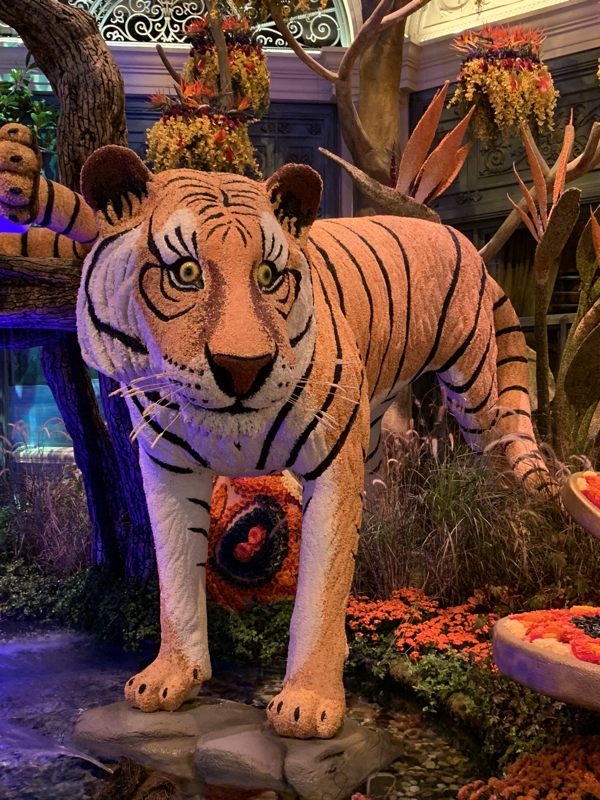 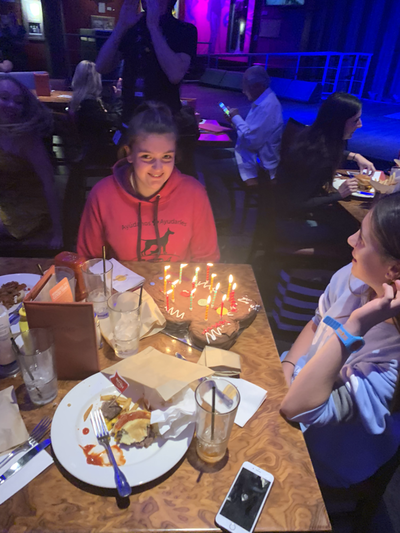 Once all had disembarked and shared stories about their favourite twists and turns of the ride we headed to MGM for dinner where we were again in awe of all the different foods we could choose for our last meal of the day. Once again, we were all ready for bed by the time we got back to the hotel where we packed for another early start for our last morning in Vegas. 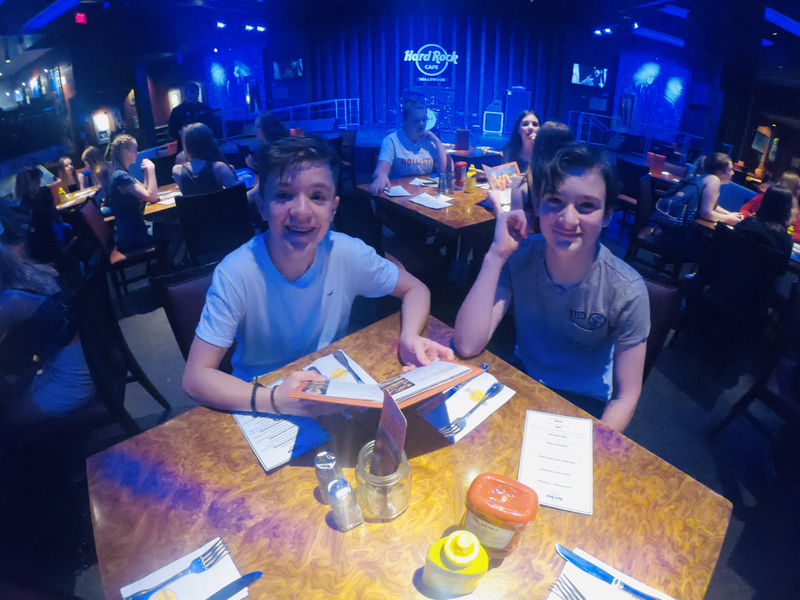 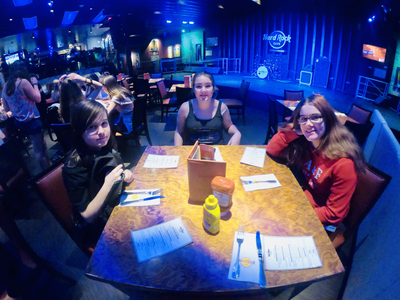 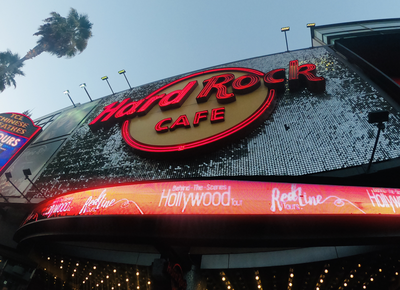 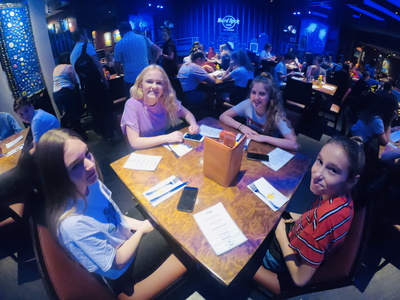 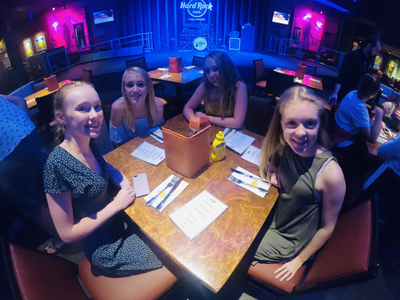 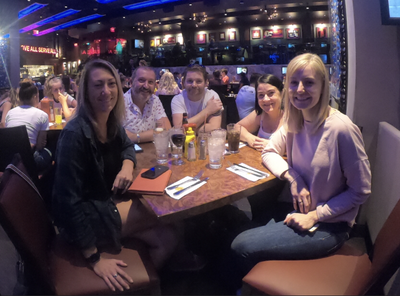 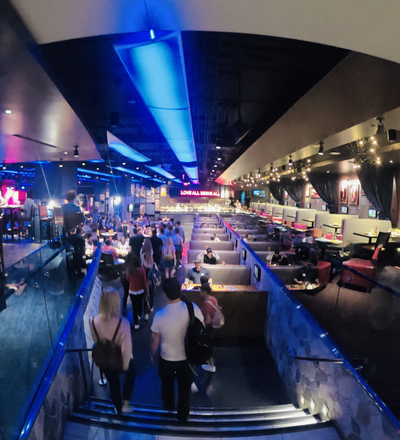 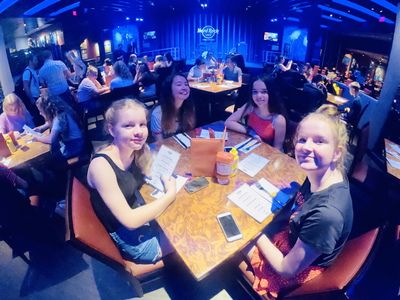 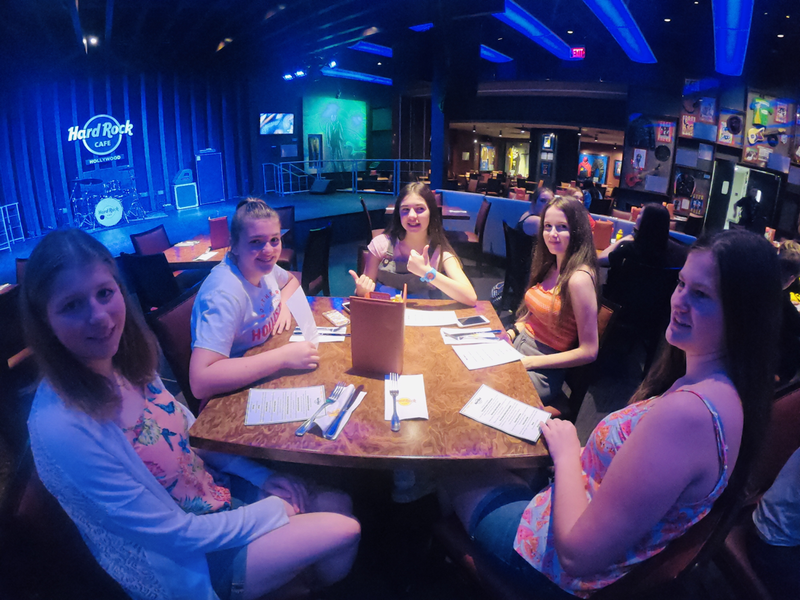 Breakfast today was held in The Hard Rock Cafe where we dined amongst incredible music memorabilia from Elvis, The Who, The Beatles and more. 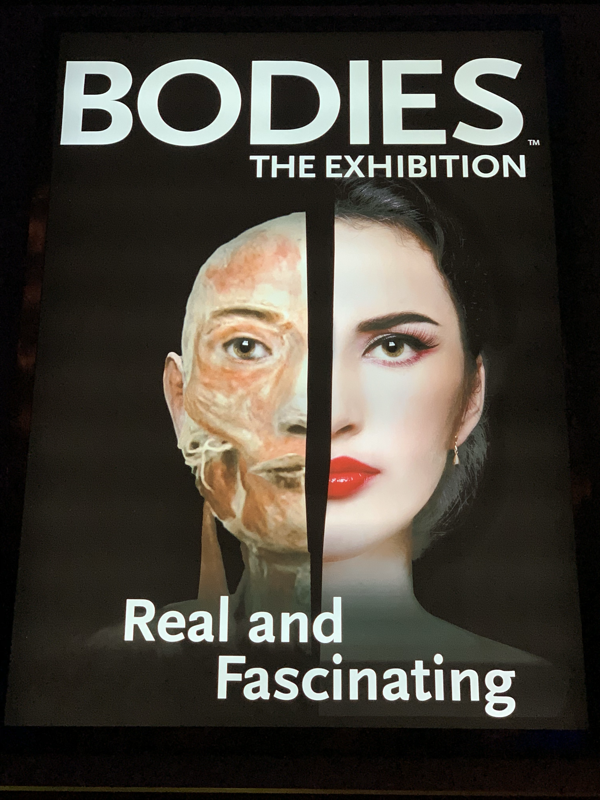 From here it was a short drive to The Luxor where we got down to more science with The Bodies exhibition. 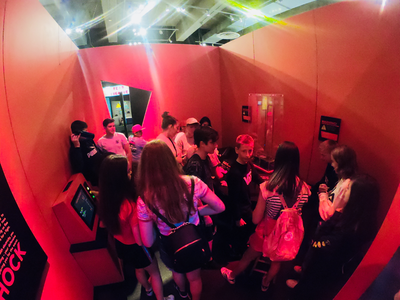 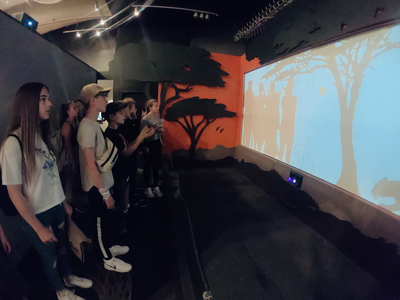 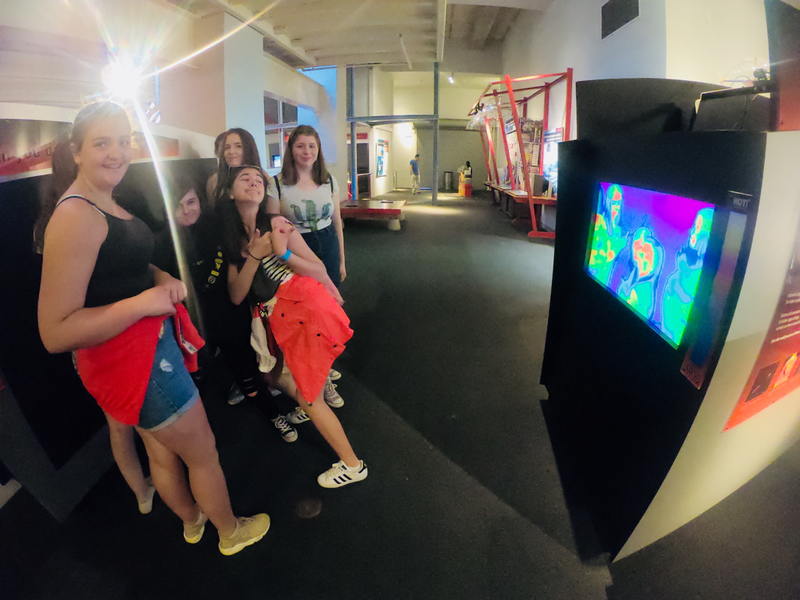 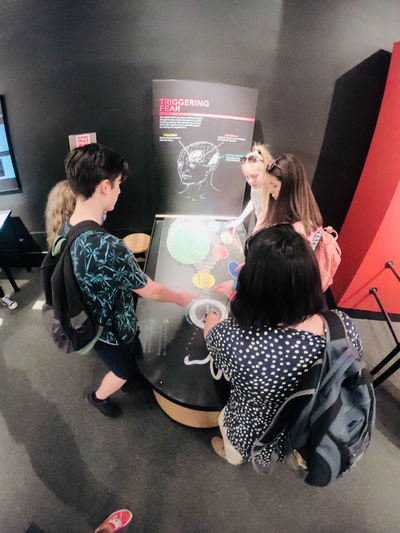 After the initial shock of realising all the specimens were indeed from human ‘bodies’ the group navigated their way around the exhibit with intrigue as they held discussions that would make their biology teachers proud! From The Luxor it was off to The Venetian. 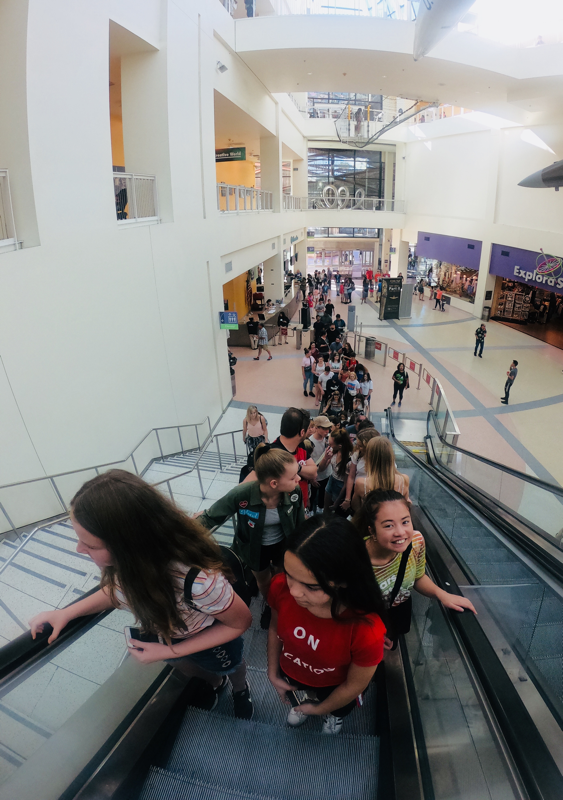 After walking through the lower level of the hotel the group boarded yet another escalator. 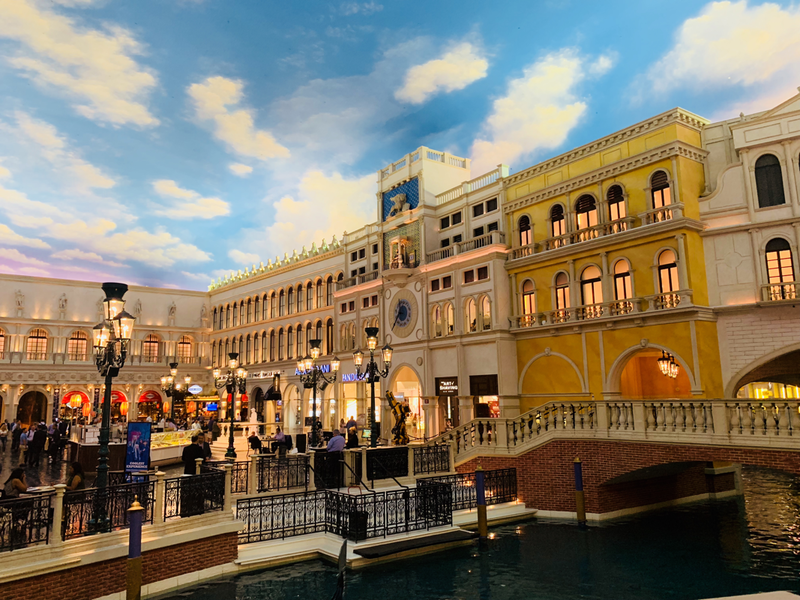 As we approached the main hall of the hotel audible gasps could be heard with the ceiling they saw before them followed by looks of confusion as they asked if they were still inside. They had two hours to enjoy the wonders of the hotel, have lunch and enjoy a little more shopping which they set off to do in earnest. 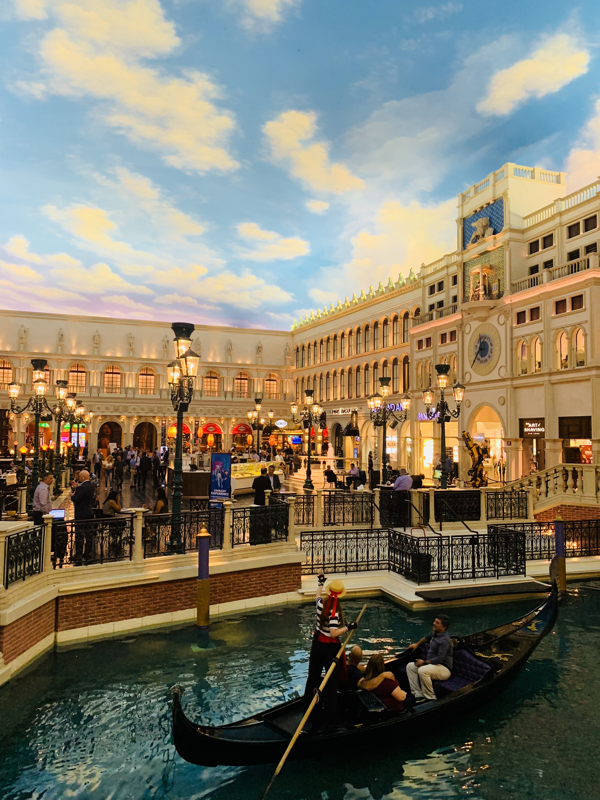 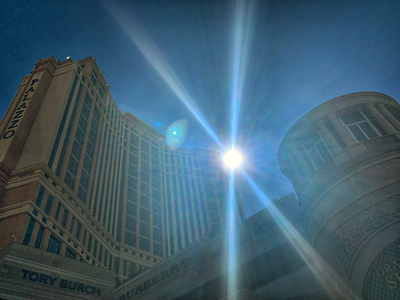 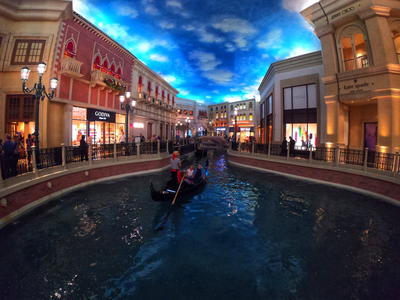 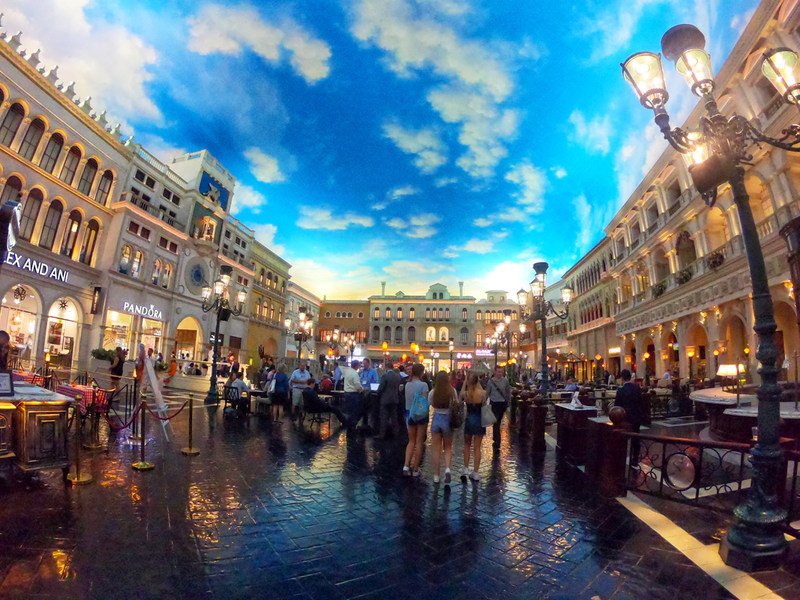 Upon leaving The Venetian we embarked on our journey of leaving Las Vegas and travelling east towards The Grand Canyon. 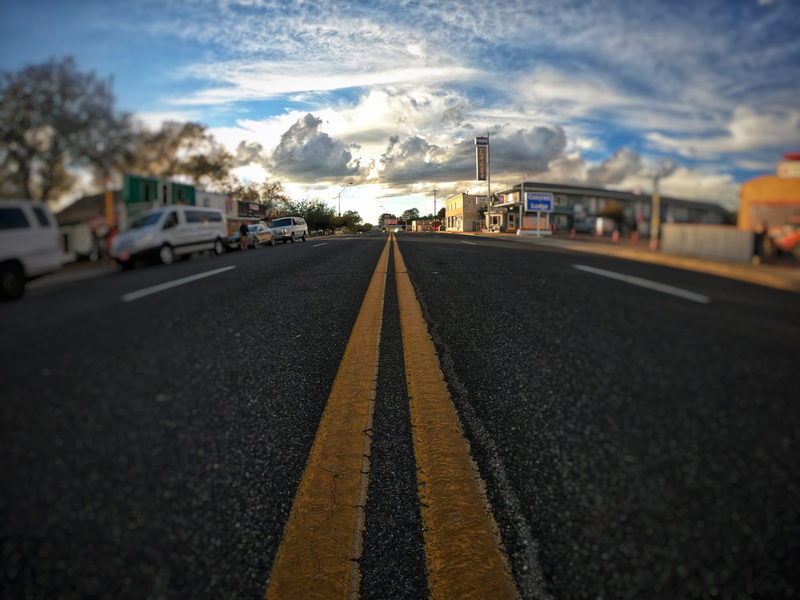 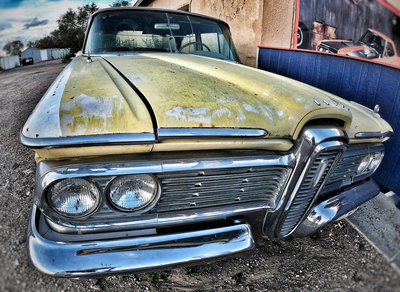 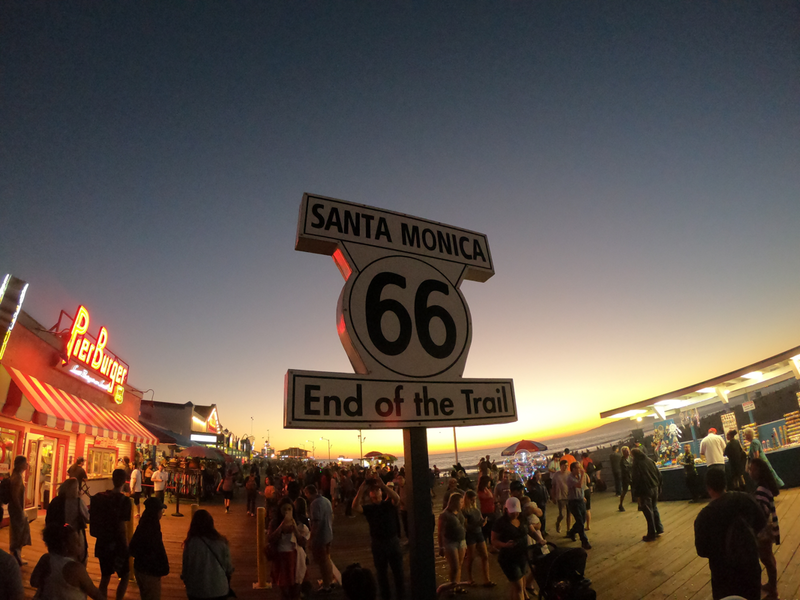 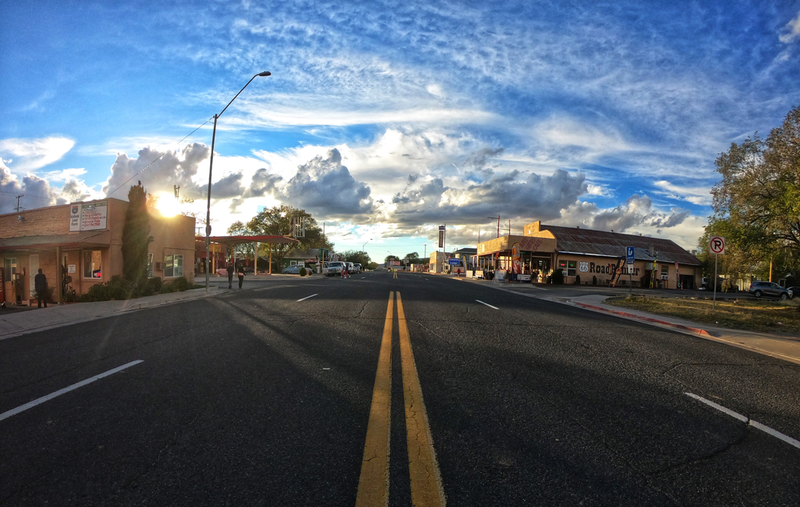 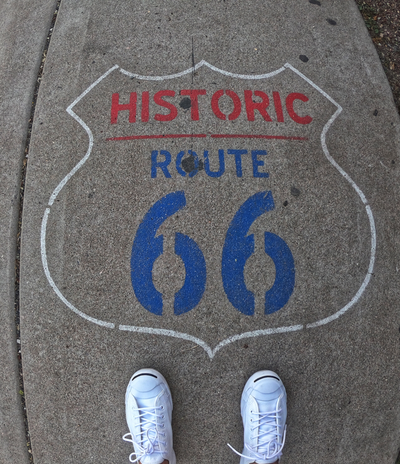 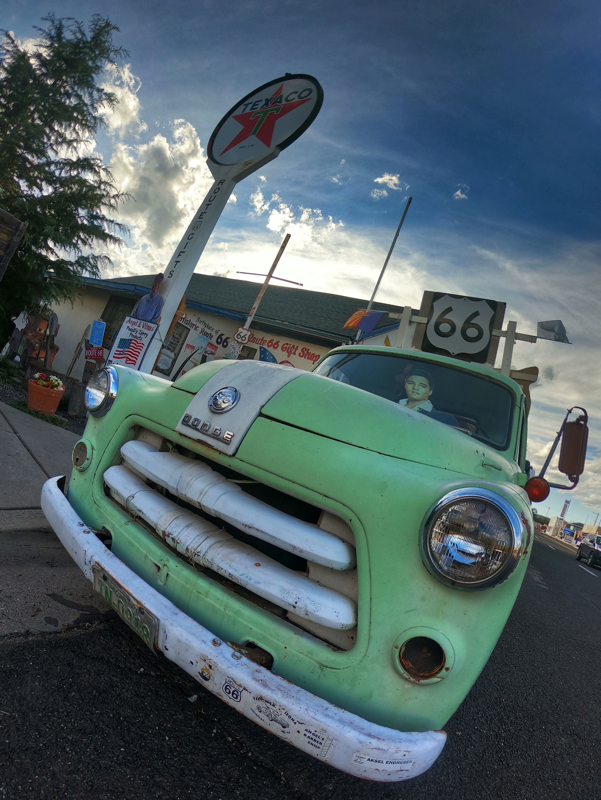 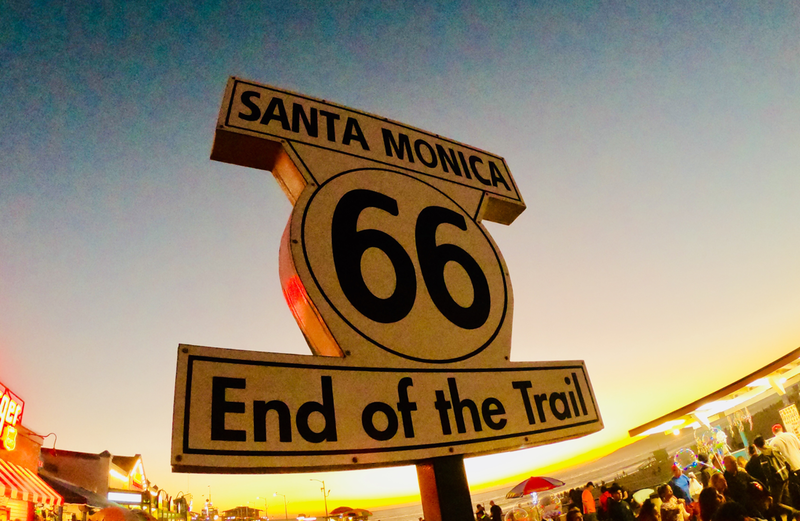 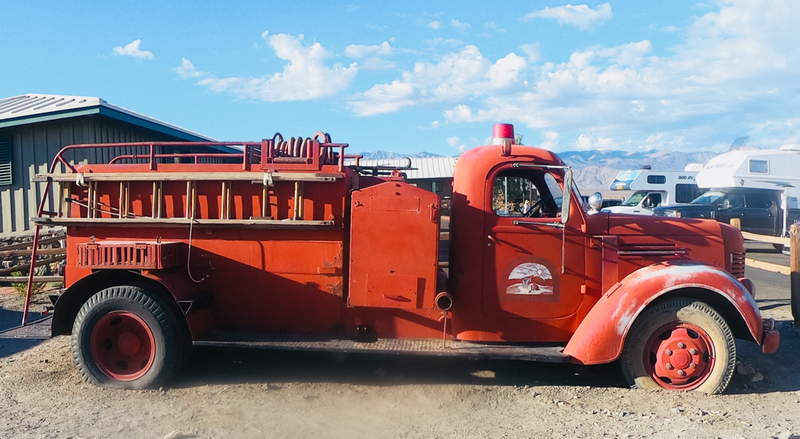 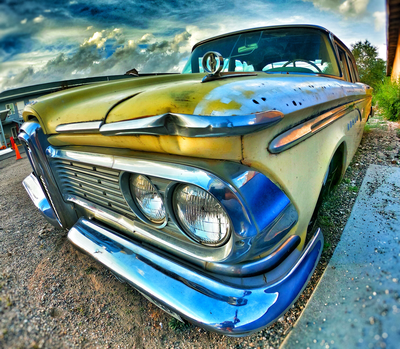 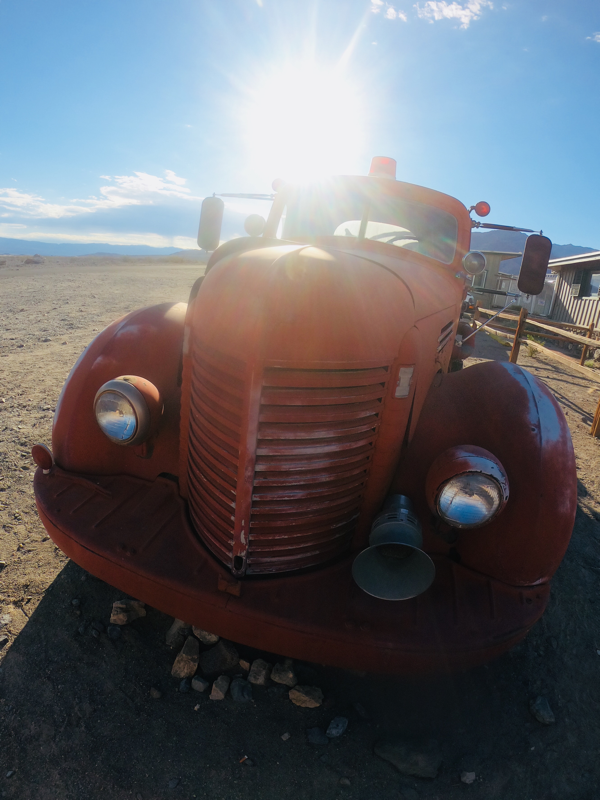 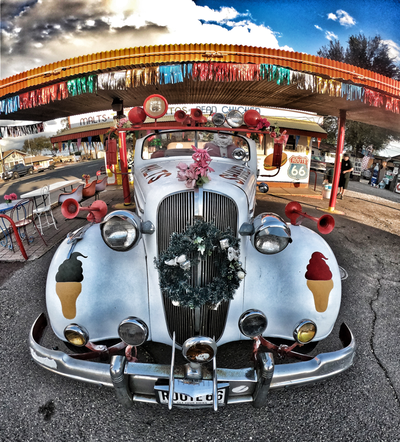 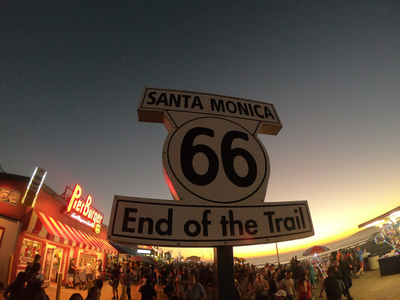 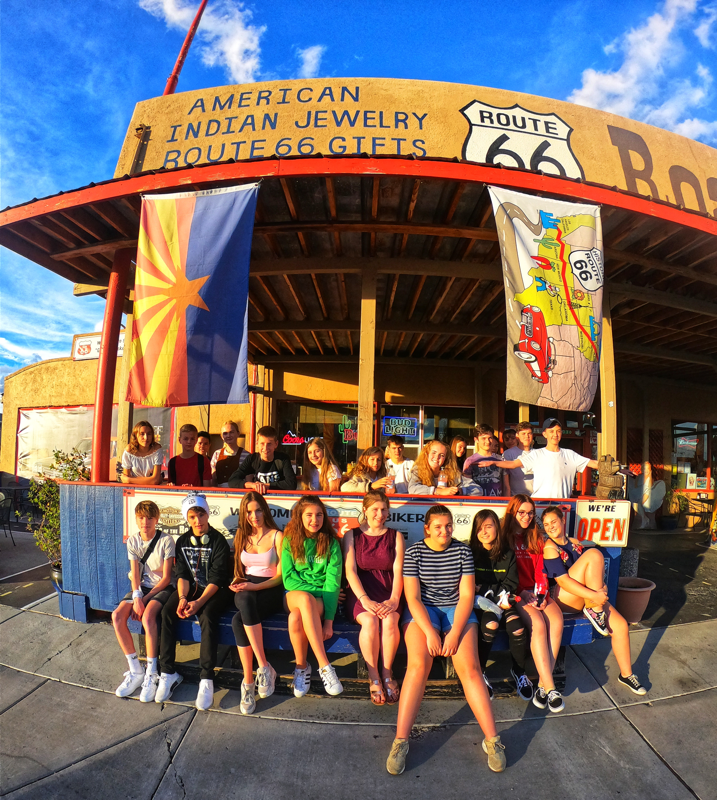 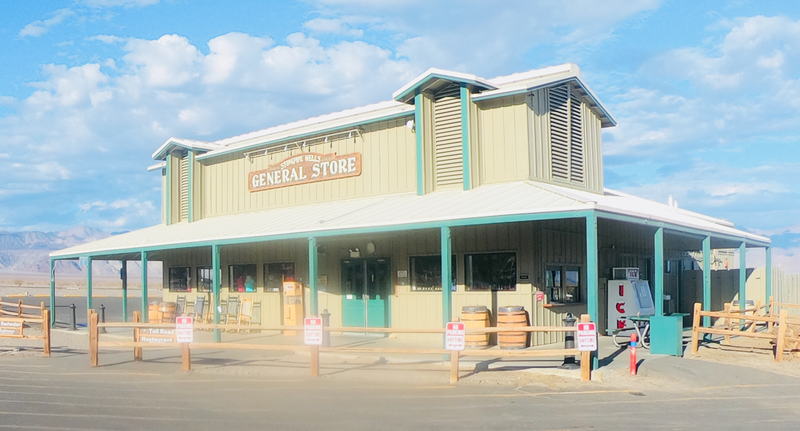 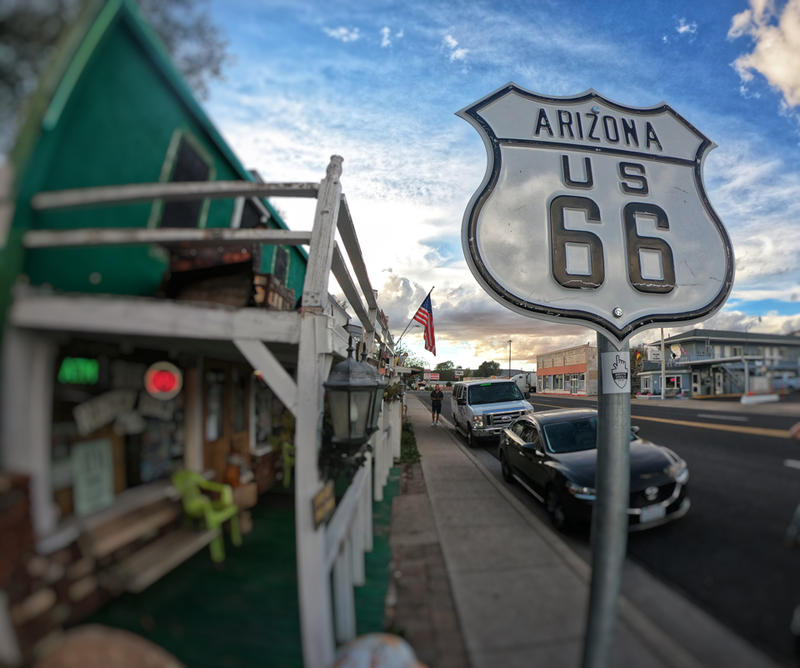 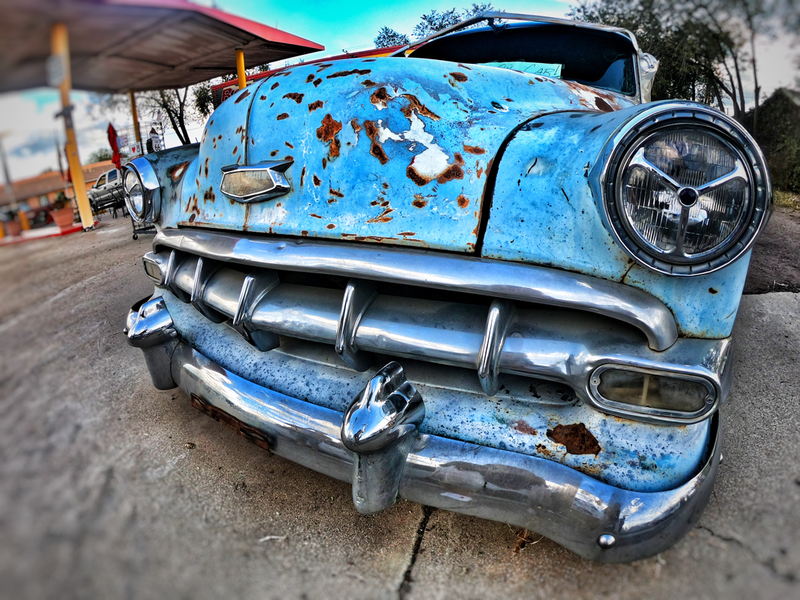 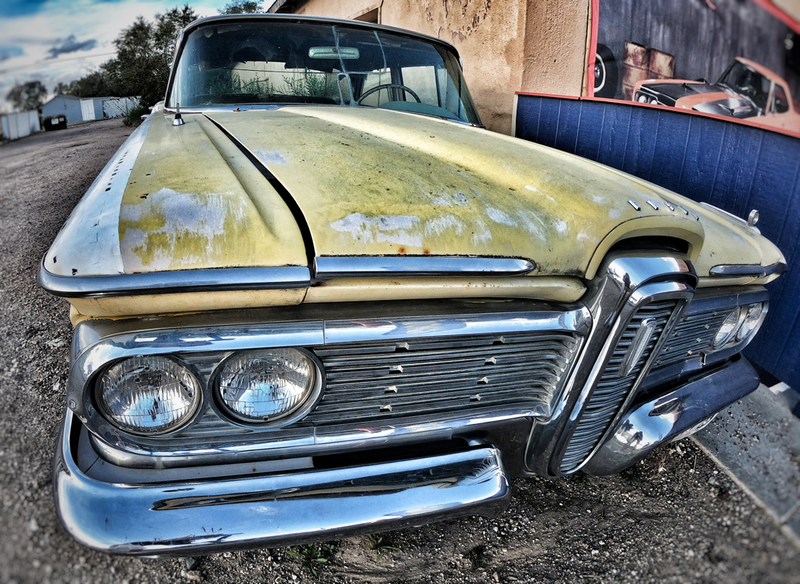 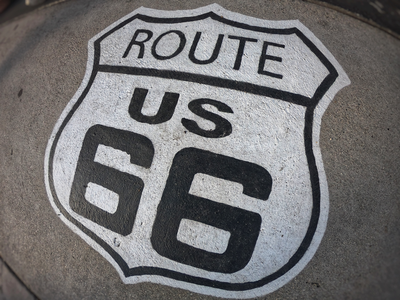 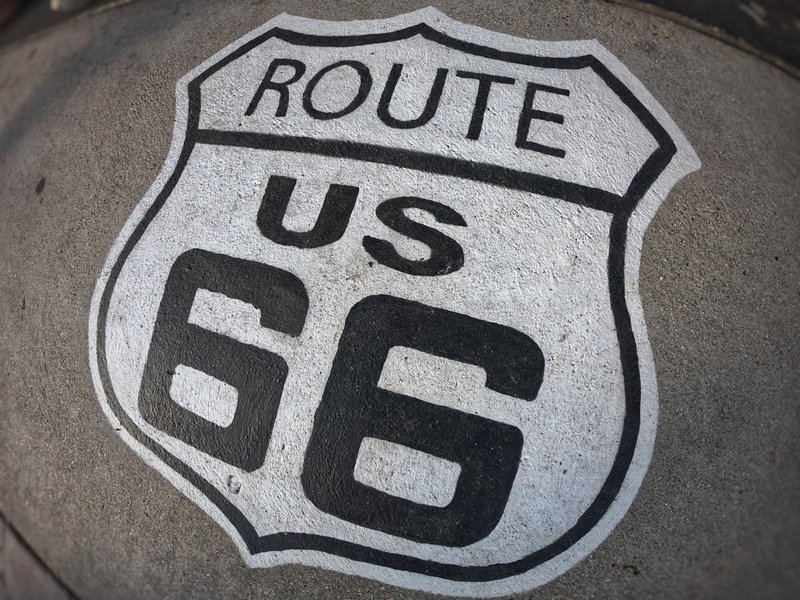 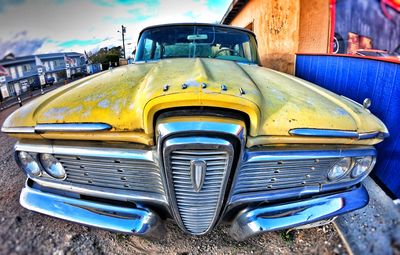 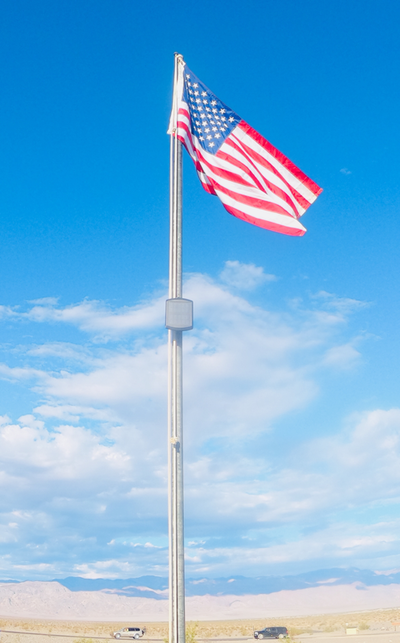 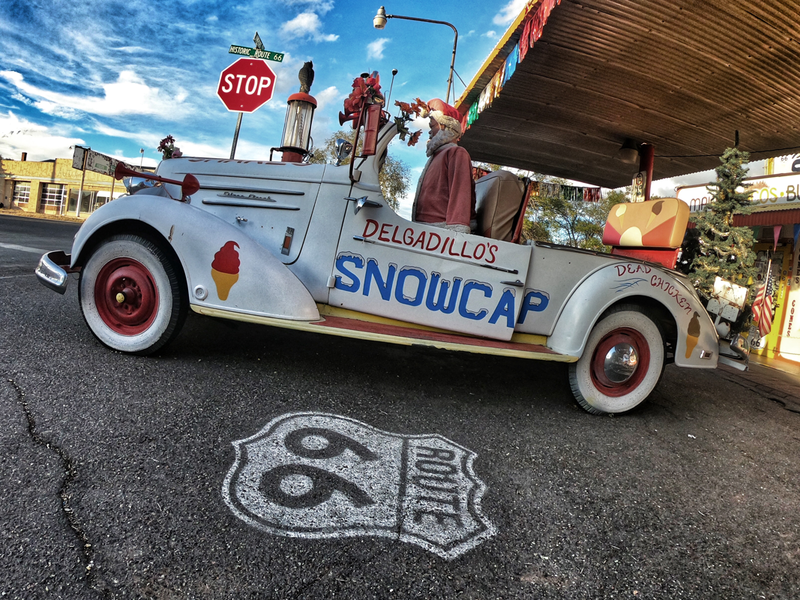 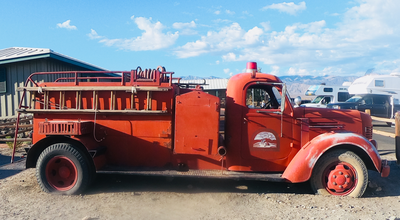 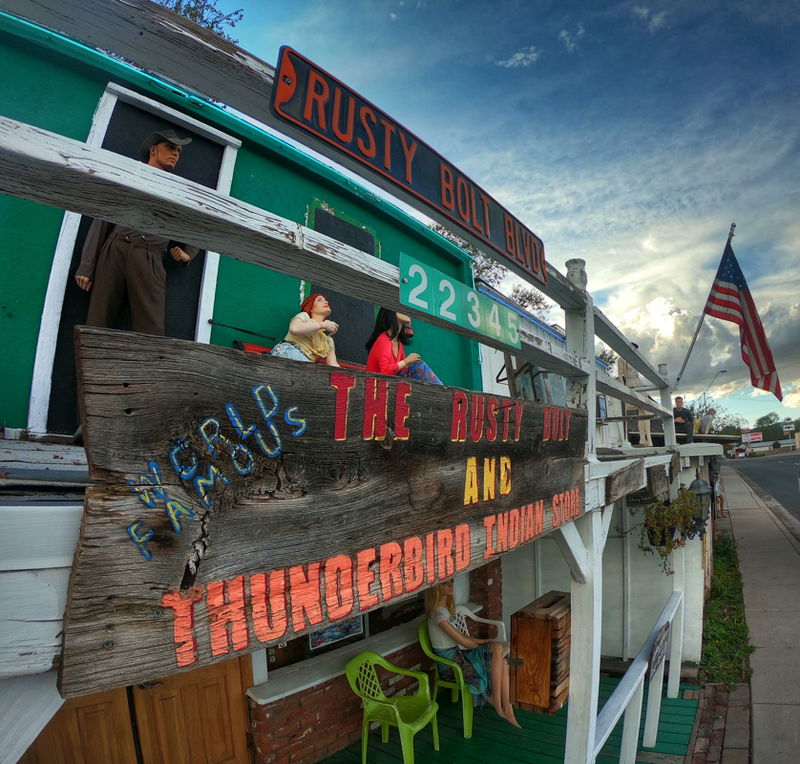 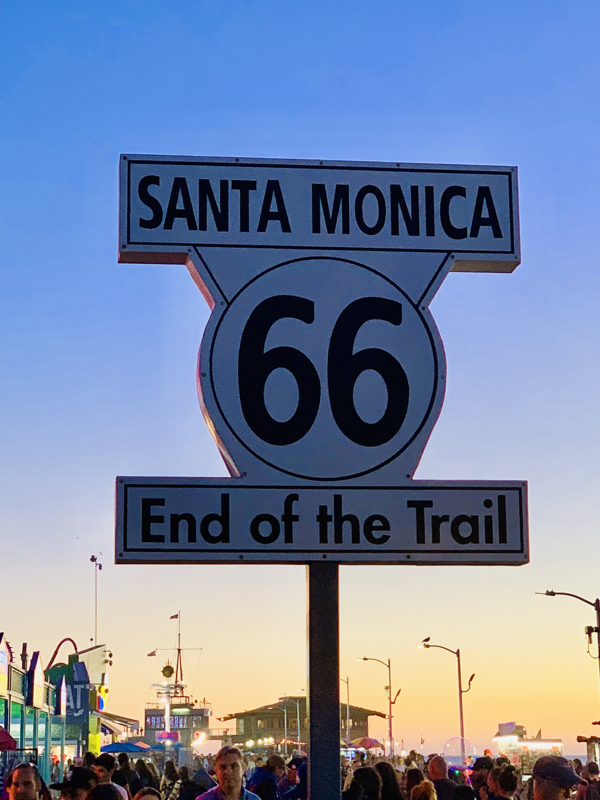 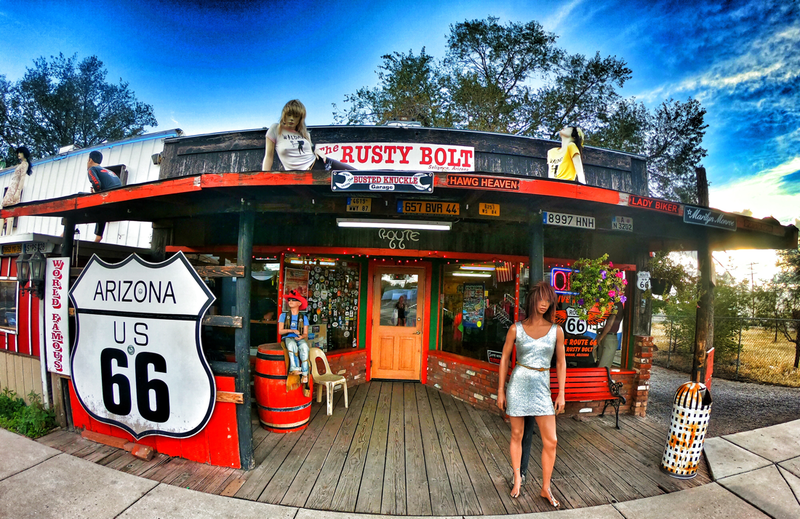 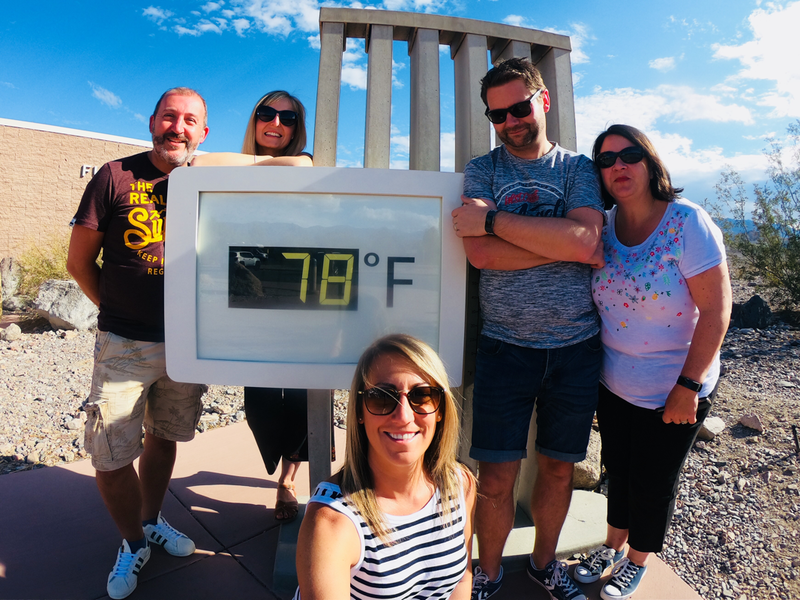 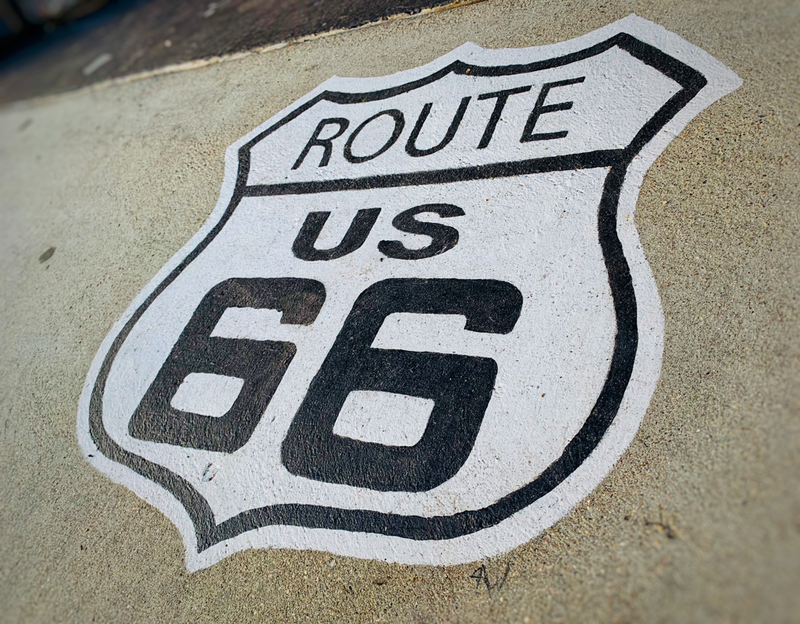 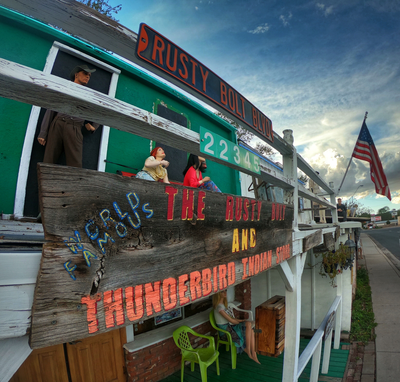 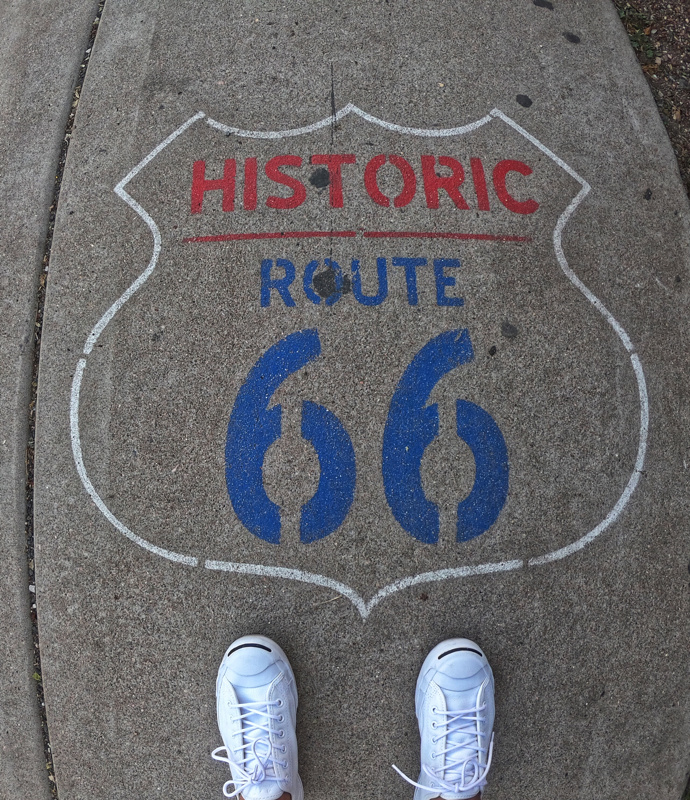 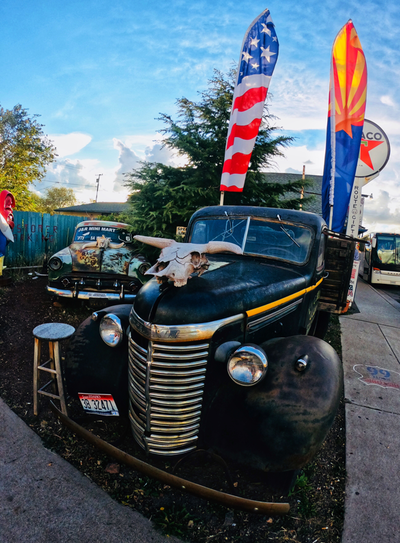 Our road trip took us down the historic Route 66 where we had a short stop to take in some of the Americana nostalgia. 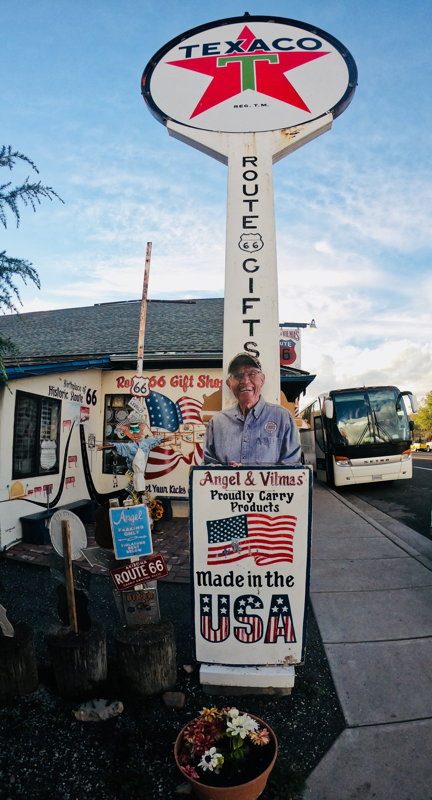 A few presents were purchased from the gift shop and former barbers of Angel Delgadillo a founder and ‘guardian angel’ of the famous route before we enjoyed an ice cream on the road side. 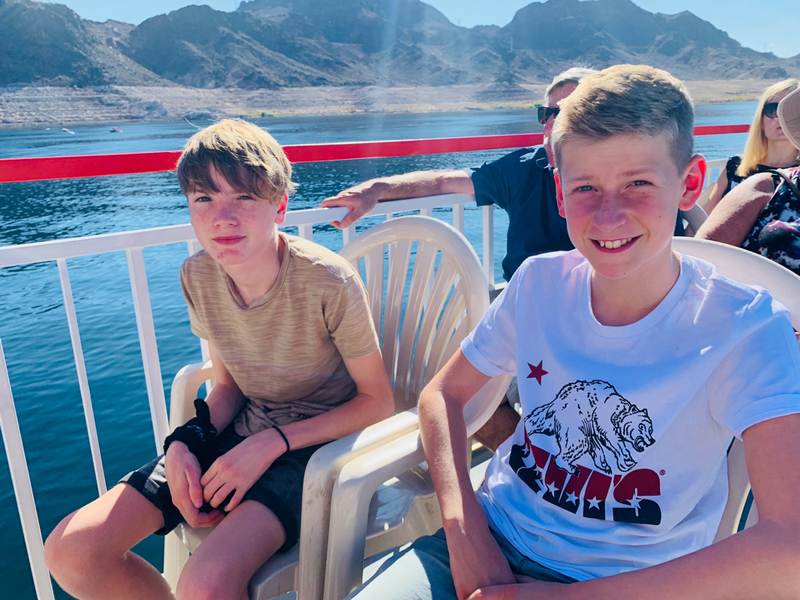 Once aboard our coach again we continued the last leg of our journey to a final hotel of the holiday in the Canyon’s National Park. 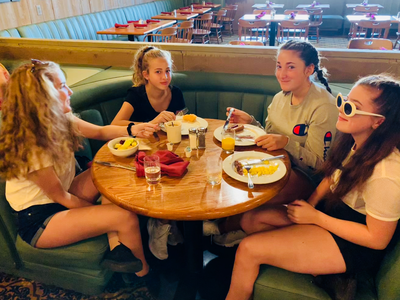 Much to the dismay of the group it was the earliest wake up call of the holiday this morning. 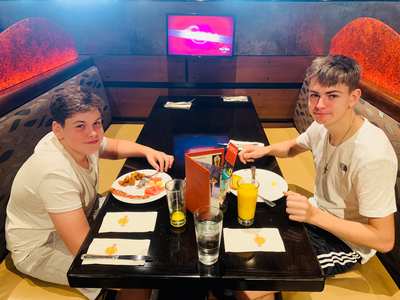 However, they were soon distracted from the early start with breakfast and the knowledge of what we were going to soon be seeing. 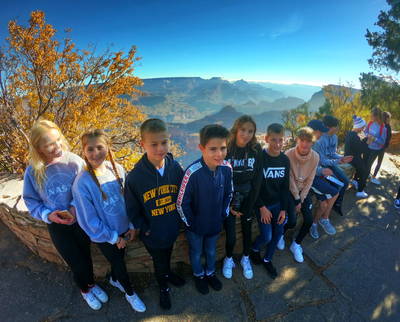 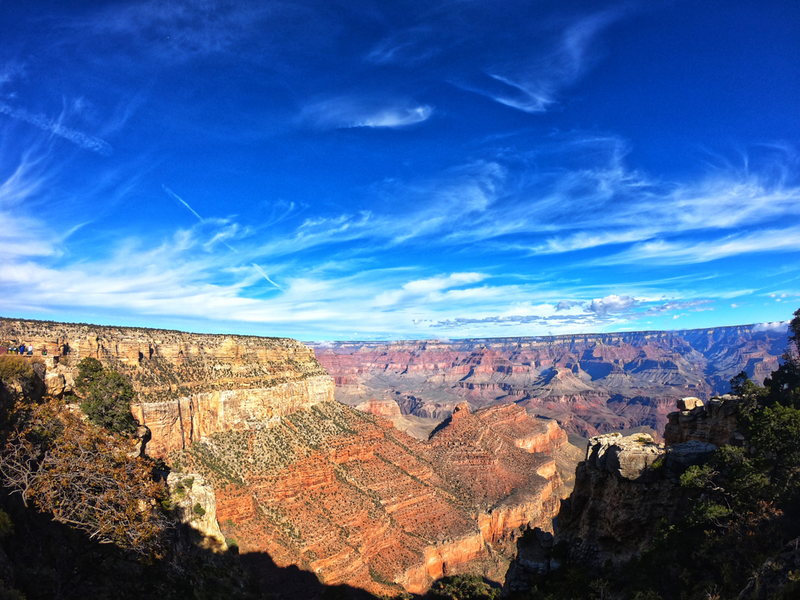 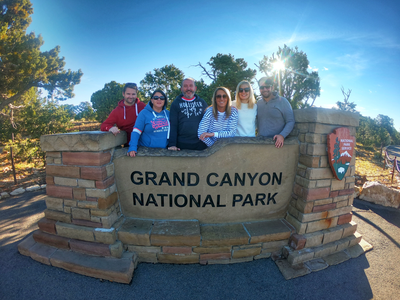 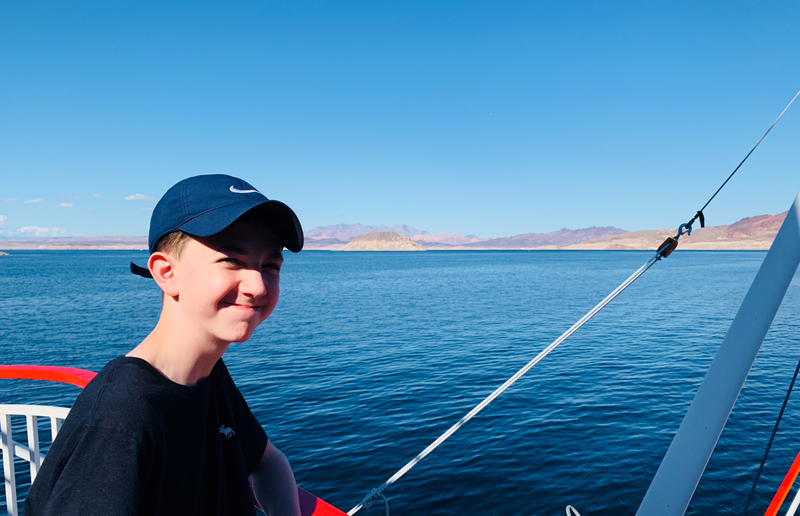 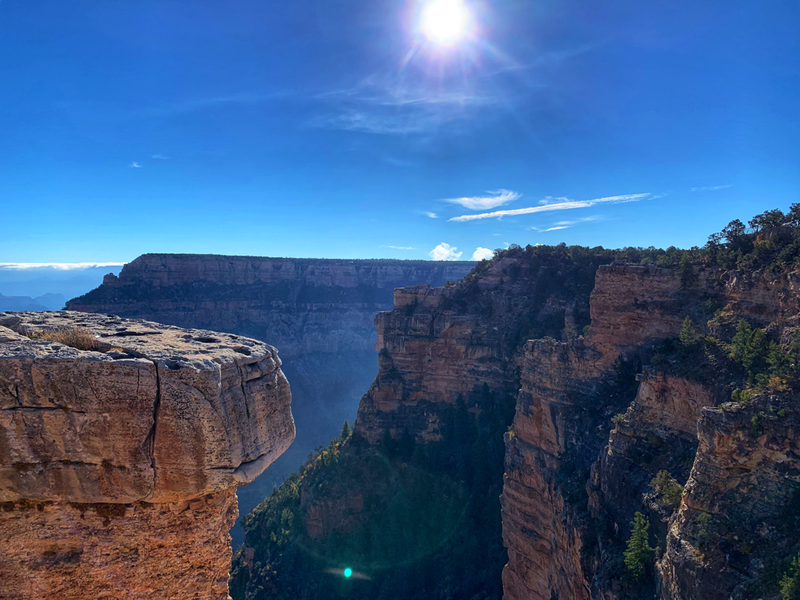 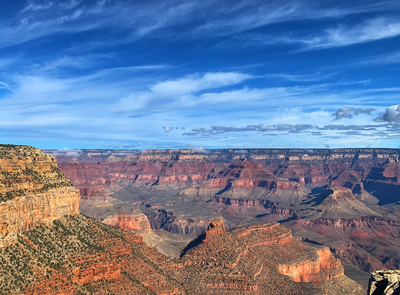 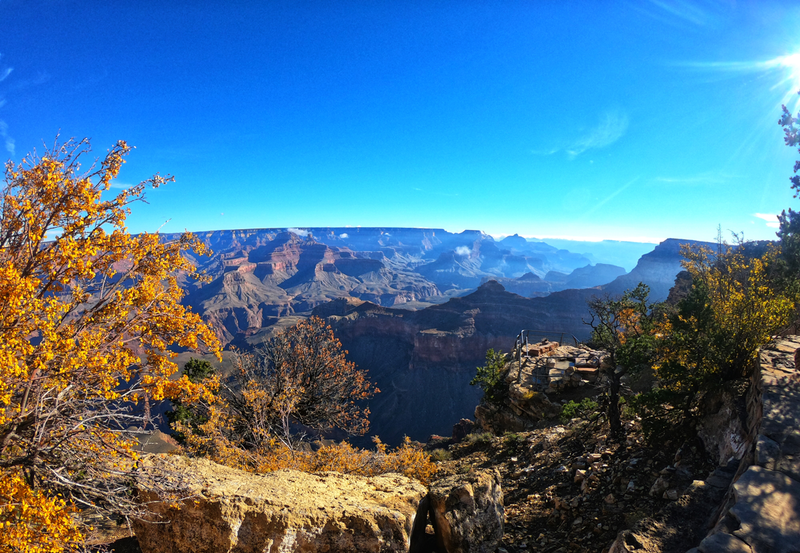 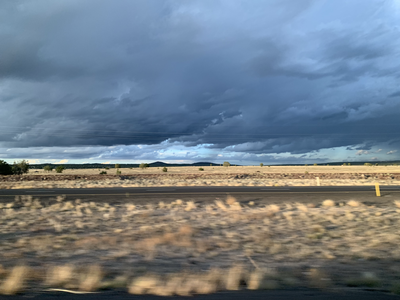 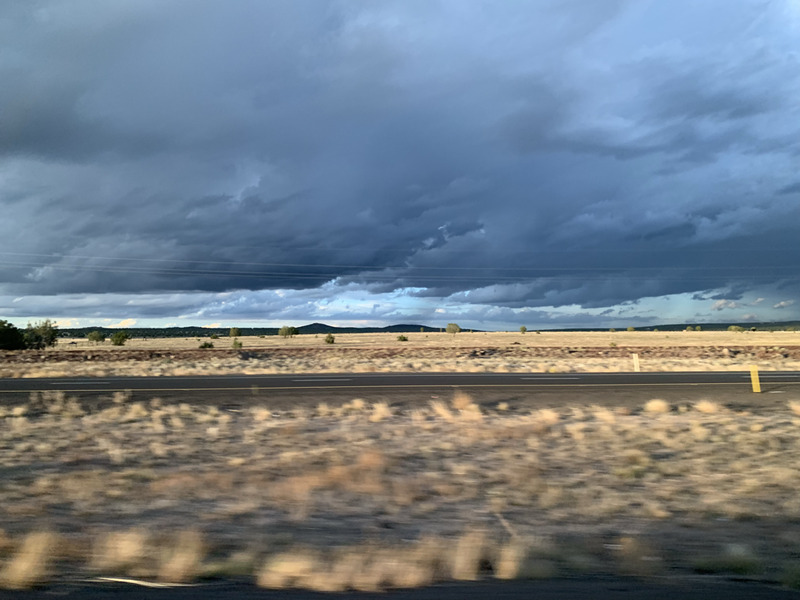 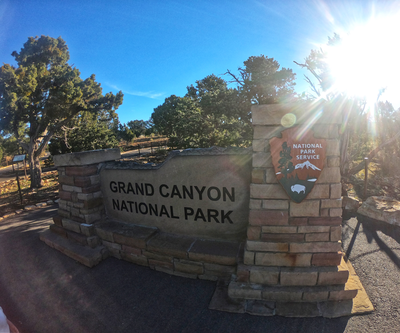 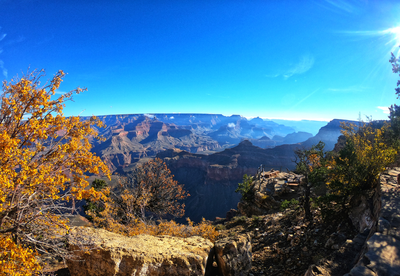 As we entered the National Park, Evan gave some sound advice to the group: ‘When you see The Canyon, take a minute, make sure your phones are away and take three deep breaths to just take it in .... you’ll only see it for the first time once so make the most of it’. 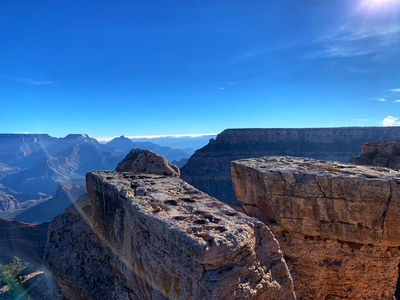 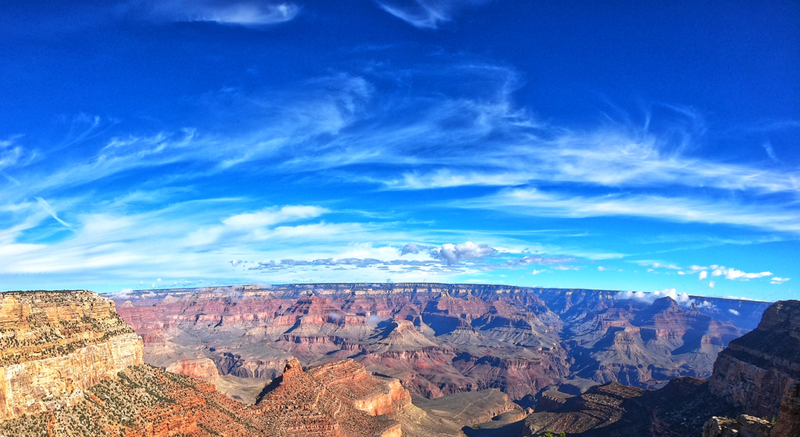 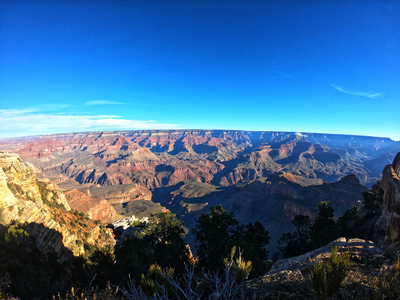 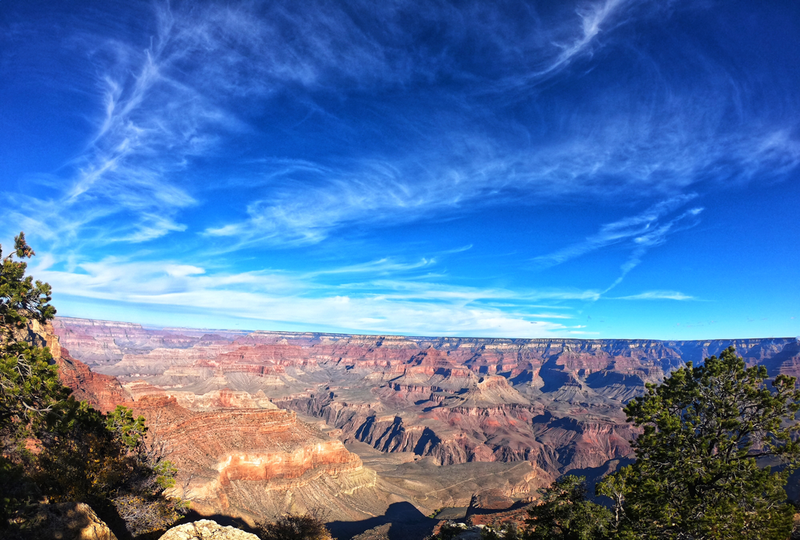 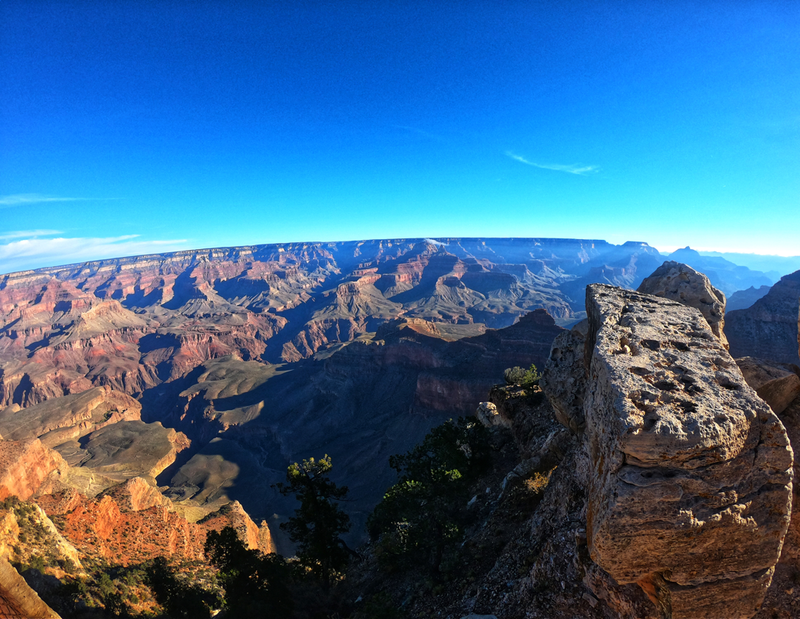 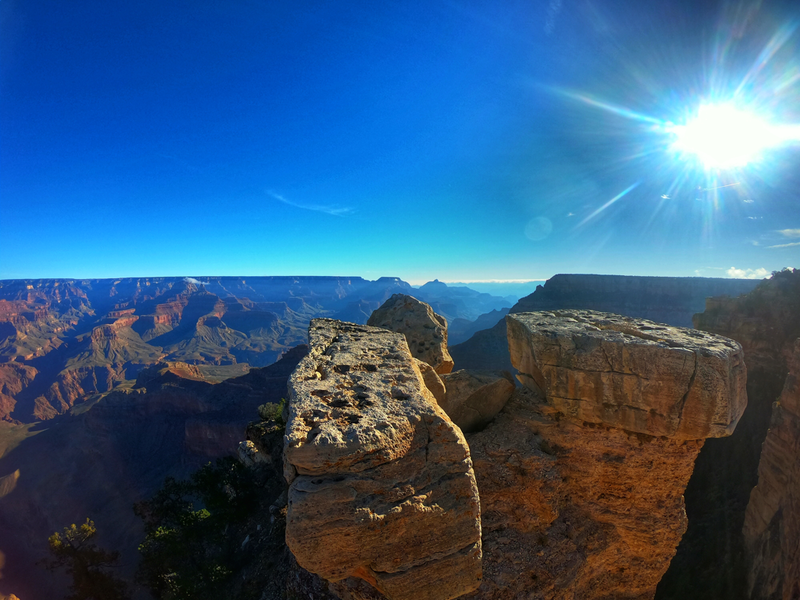 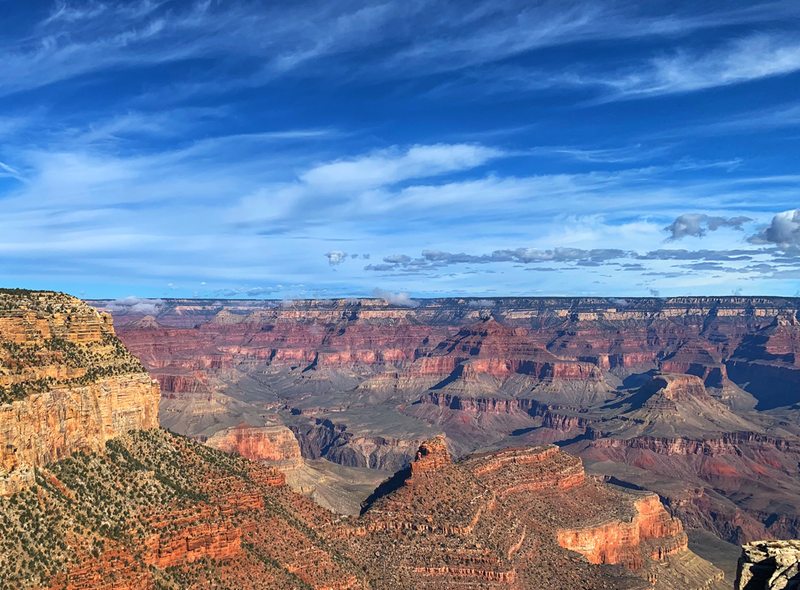 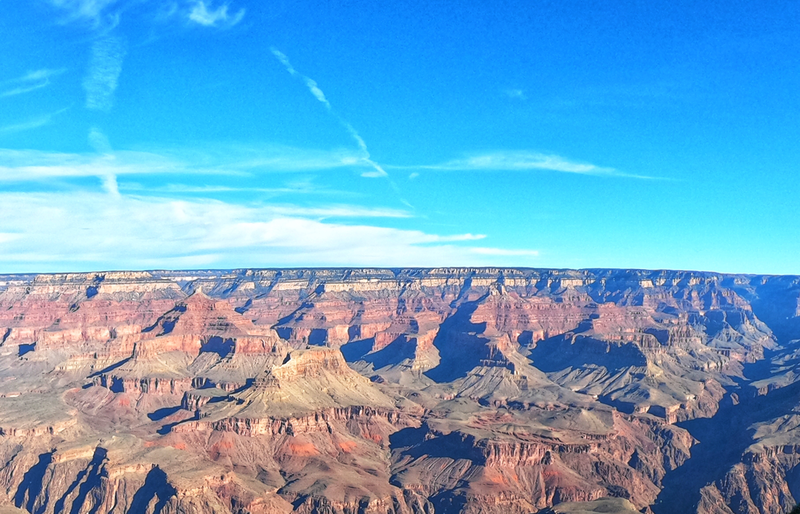 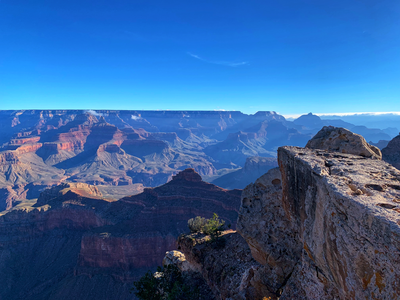 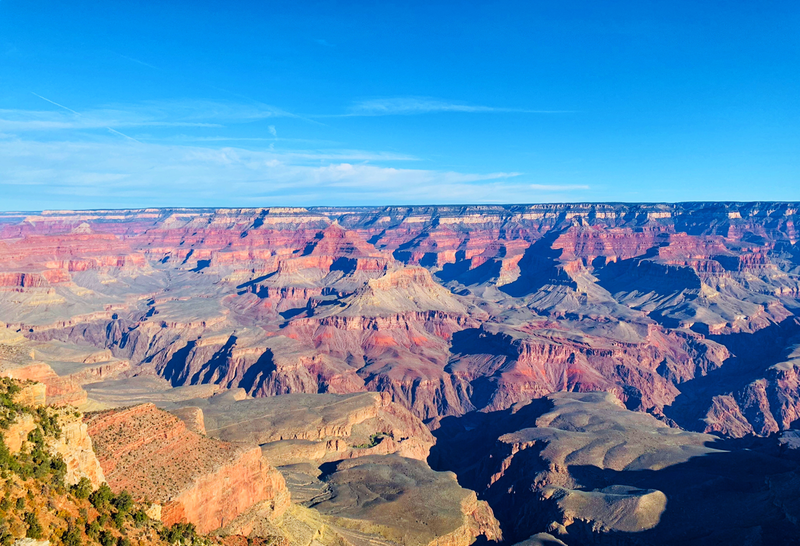 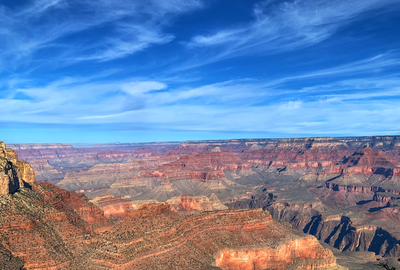 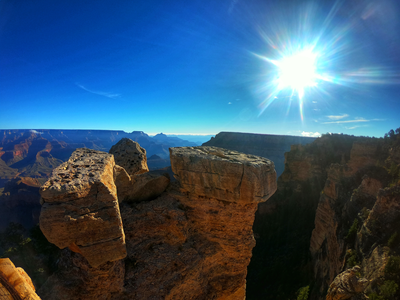 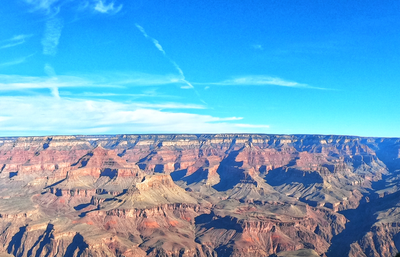 As we approached with the morning sun overhead illuminating the deep reds and browns of The Grand Canyon we did just as Evan had advised and took those breaths to admire the wondrous view. Soon after, the phones and cameras did indeed come out to try and capture the moment. 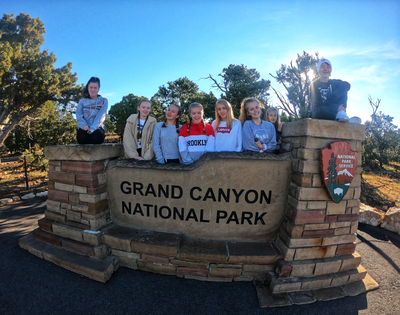 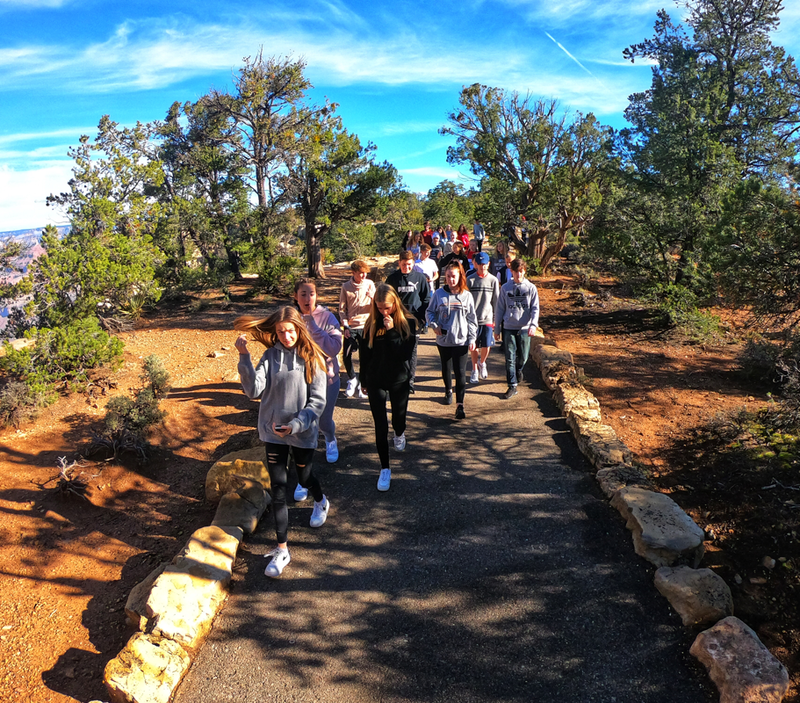 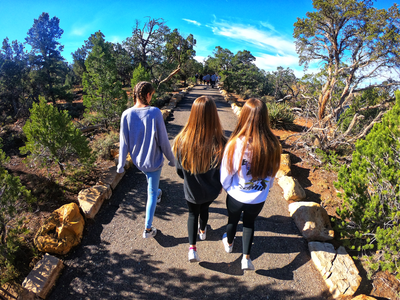 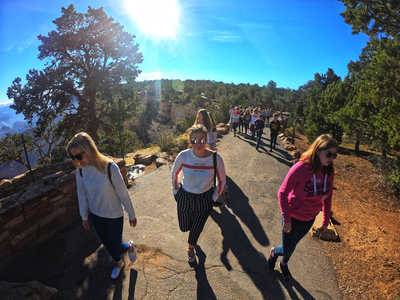 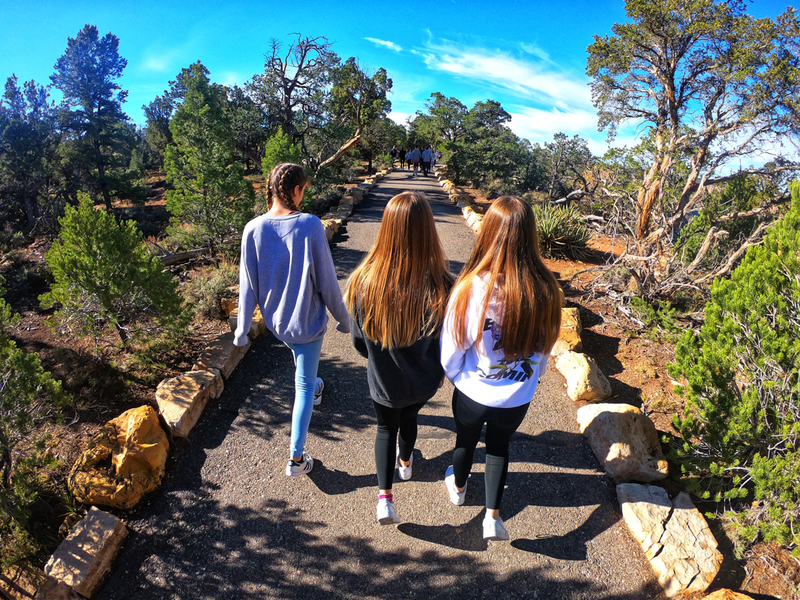 From our first viewpoint we followed the path down the ‘Walk of Time’ as examples of different rock specimens provided information on the formations of the canyon before us. 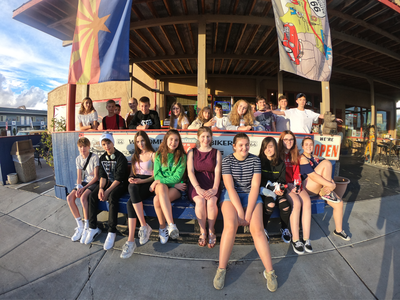 Following our incredible walk we now only have one final leg of our State Side journey, the trip to the Phoenix Airport. 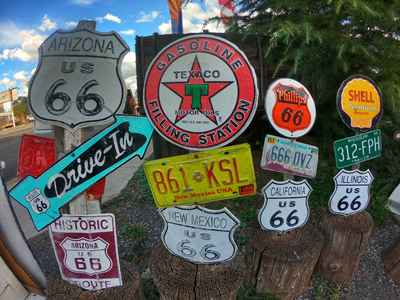 Enroute we stopped for lunch at Canyon Breeze in Sedona. 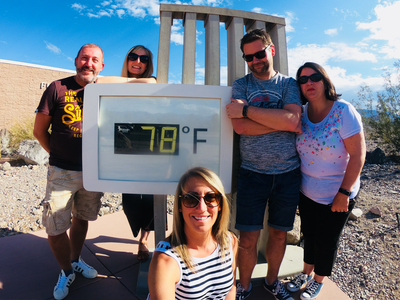 Here the temperature was a little warmer as we had our last meal with an incredible view. 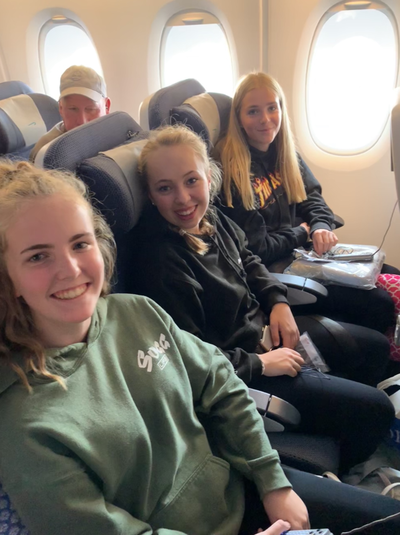 We are now currently sat in the departure lounge of the airport with mixed emotions. The group are recalling all our experiences fondly and wanting to do more but looking forward to seeing friends and family at home. 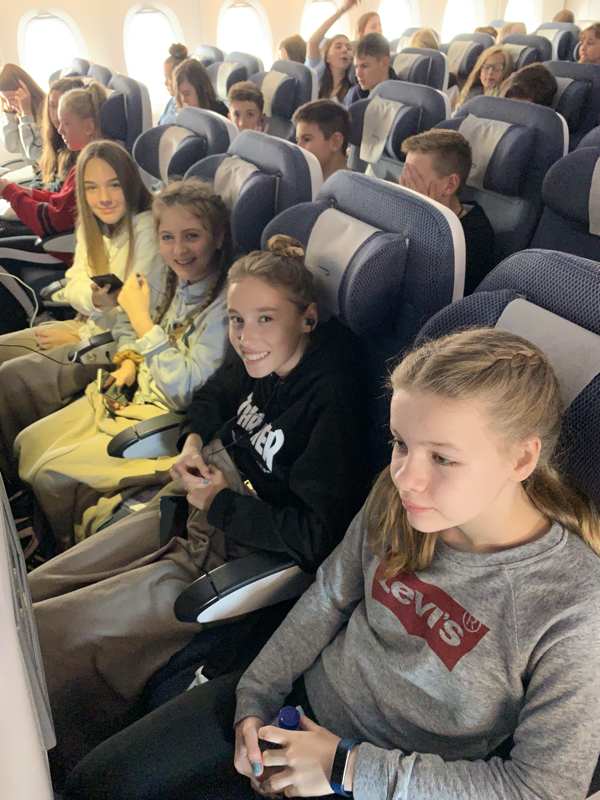 Just one nine hour and 50 minute flight (in which we hope to all sleep) and we will be back on home ground. 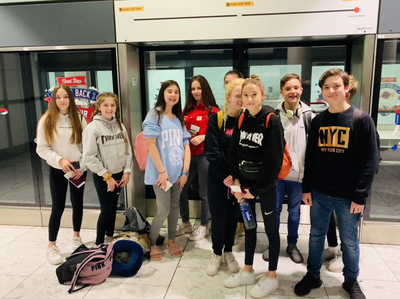 We have landed! 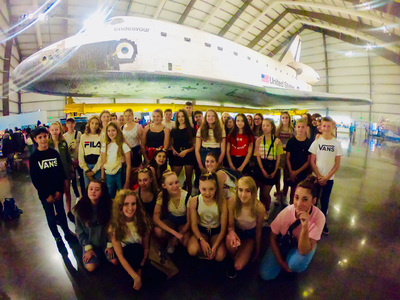 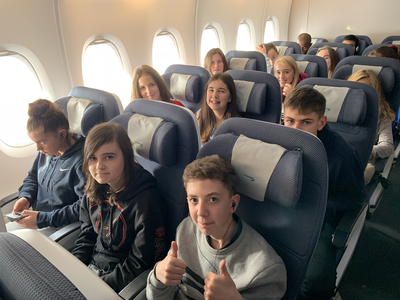 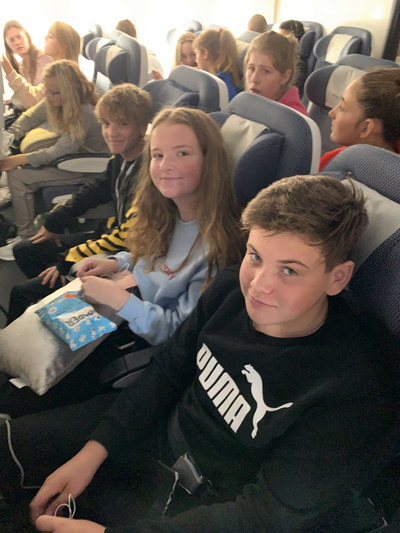 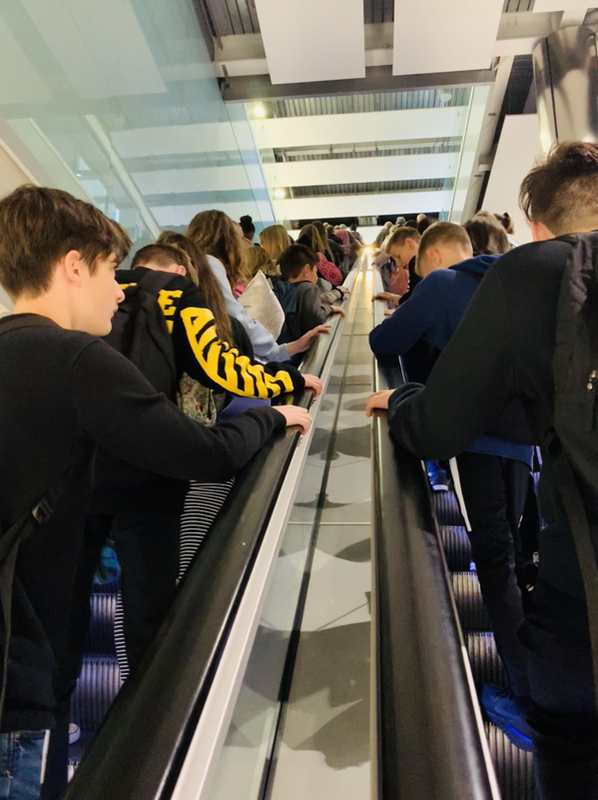 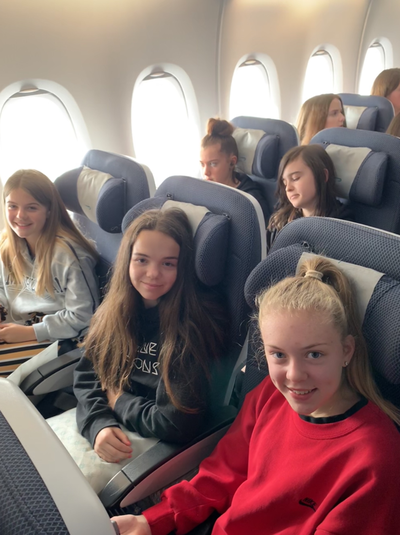 The group were, yet again, impeccably behaved throughout the flight with many managing to get a few hours sleep enabling them to be quite refreshed this morning. 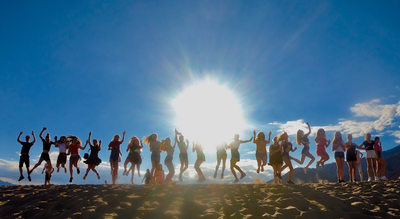 The coach will soon be picking us up and bringing us back to Battle to be reunited after an incredible week. All is very quiet on the coach now that we are hitting the M25. 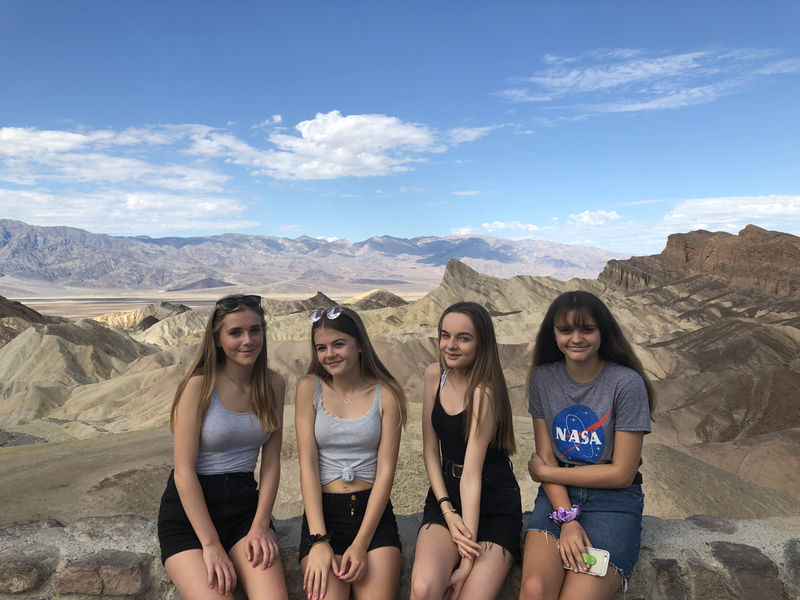 Many conversations have been how they ‘can’t believe how quickly the week has gone’, ‘want to go back’ and had ‘such a great time’. Gradually, however, the talking is dying down as the tiredness is taking over.. 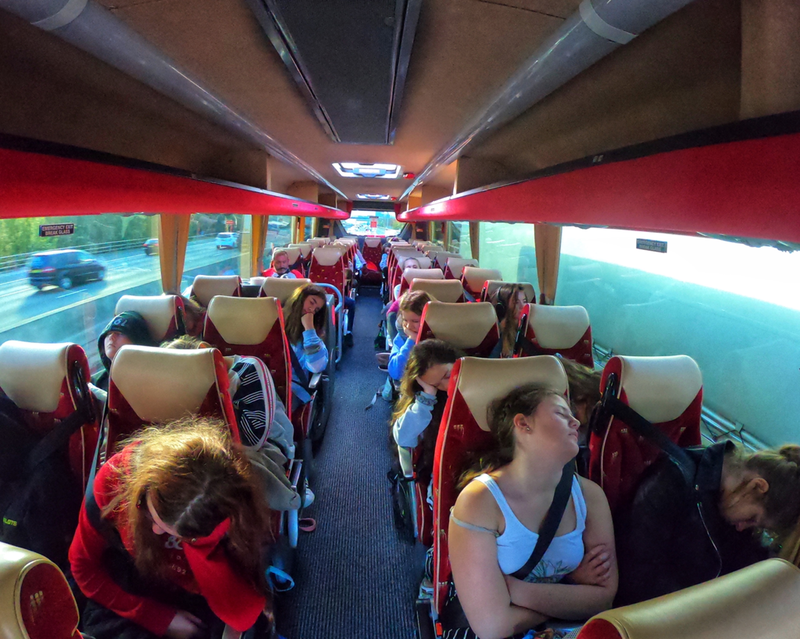 Most of the coach is now asleep as near our beloved Battle. 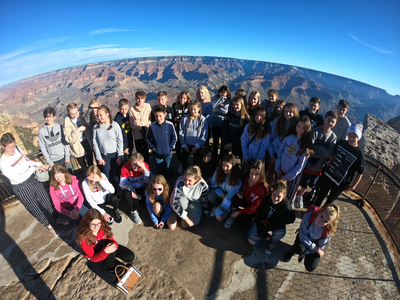 We, as staff, feel incredibly fortunate to have been able to have shared the half term break with such a fine group of young people. Their manners were impeccable throughout the trip; naturally being polite and thanking all members of staff who catered for us in our many venues. We could not have asked for more from them; they made the most of the opportunities they were given and seem truly grateful for those who made this trip a possibility for them. There have been strong new friendships made which we know will carry over into their remaining time at Claverham. 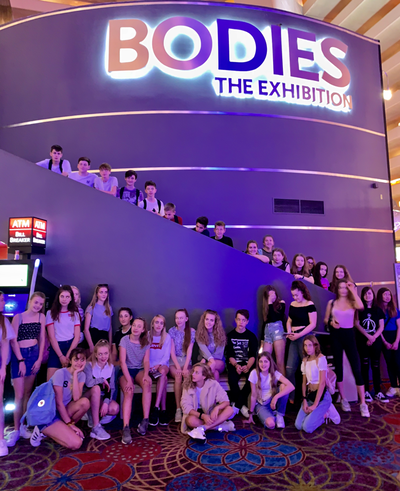 They have most definitely done themselves proud. 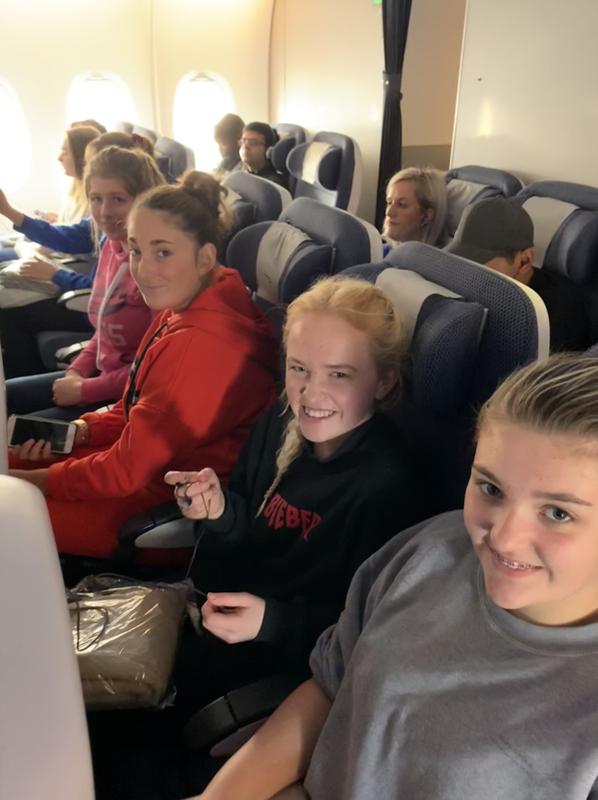 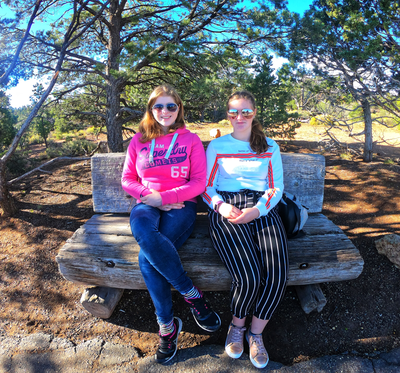 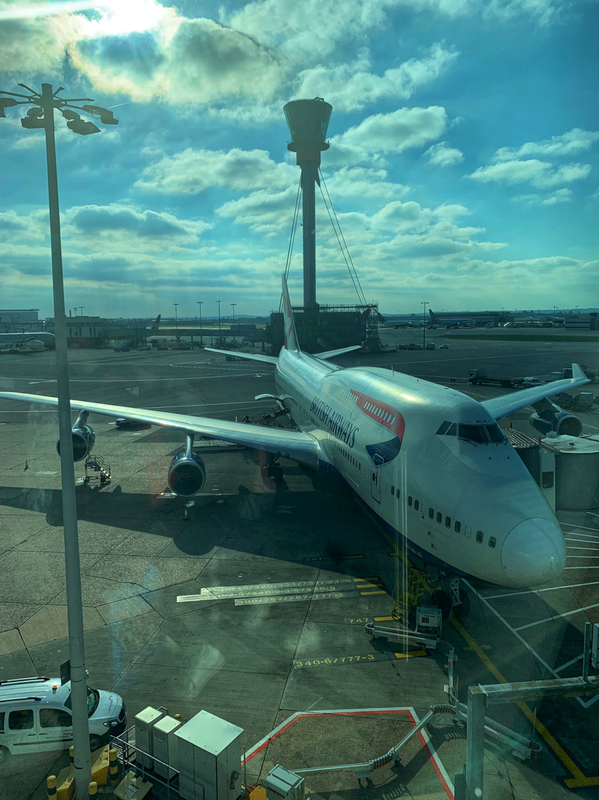 There have been many people who have made this trip possible; Mrs Pitman and Miss Daines have shared the vision for the trip and have put many hours into the logistics of making it come to fruition. 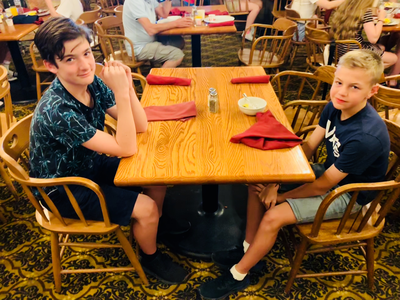 Mr Pitman and Mr Lochan-Grimer have been invaluable members of staff and appreciated by all. 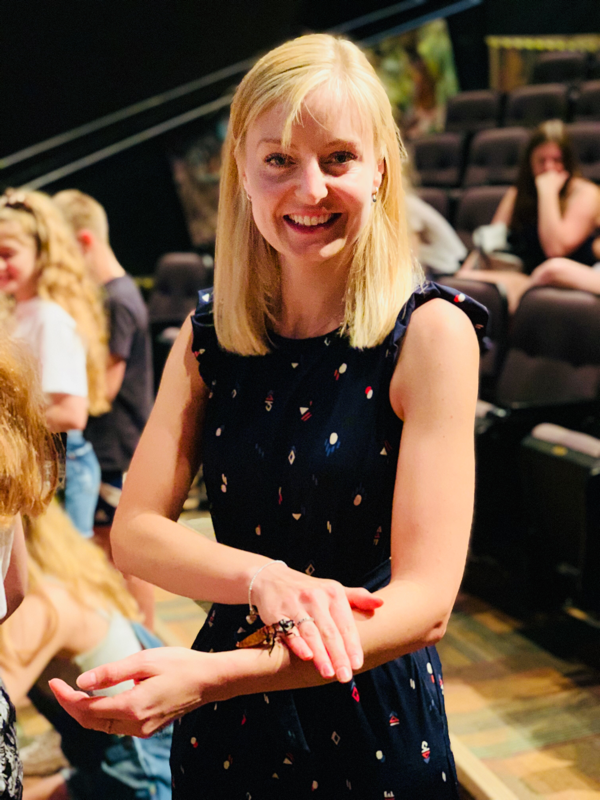 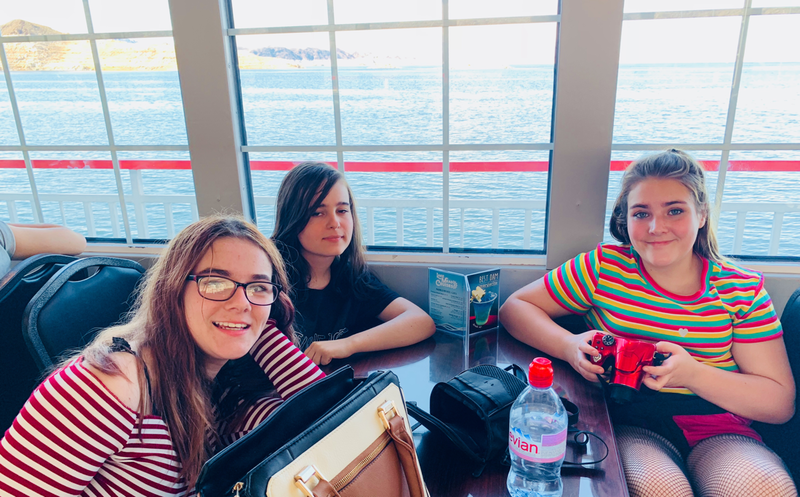 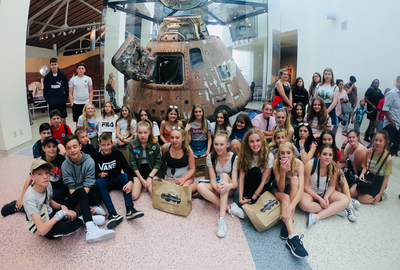 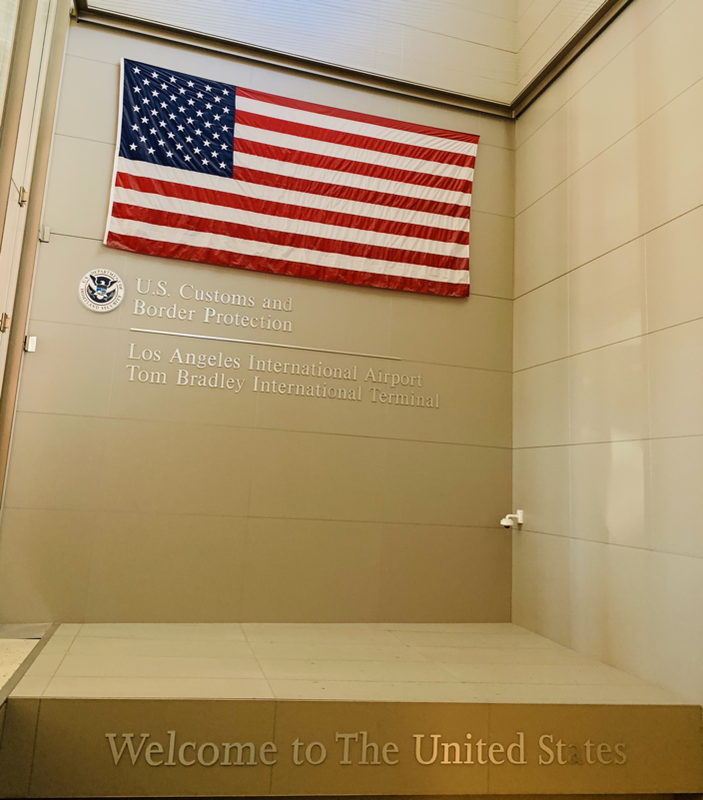 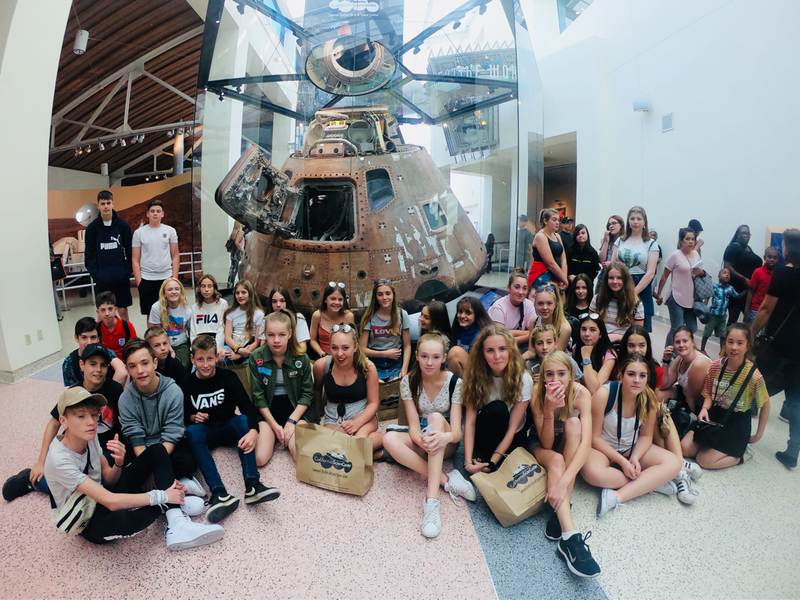 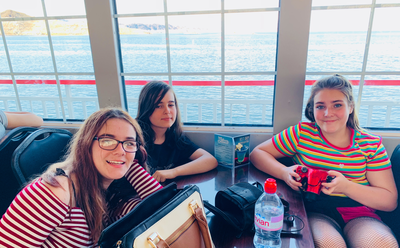 Behind the scenes we are extremely grateful to Mrs Blissett from the School Finance Office whose efforts have been instrumental in ensuring the trip is a success. 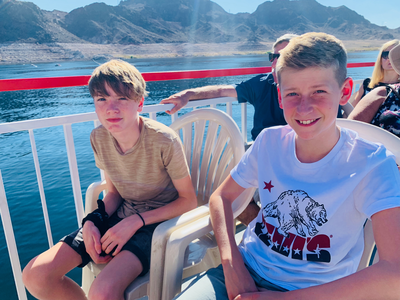 We are also grateful to Mr Swatton and support staff for ensuring the trip was accessible for us at this time and of course Our guide Evan and Focus Travel. It has been a real privilege to share this week with such fine members of staff and students alike which I hope has come across in my writings. 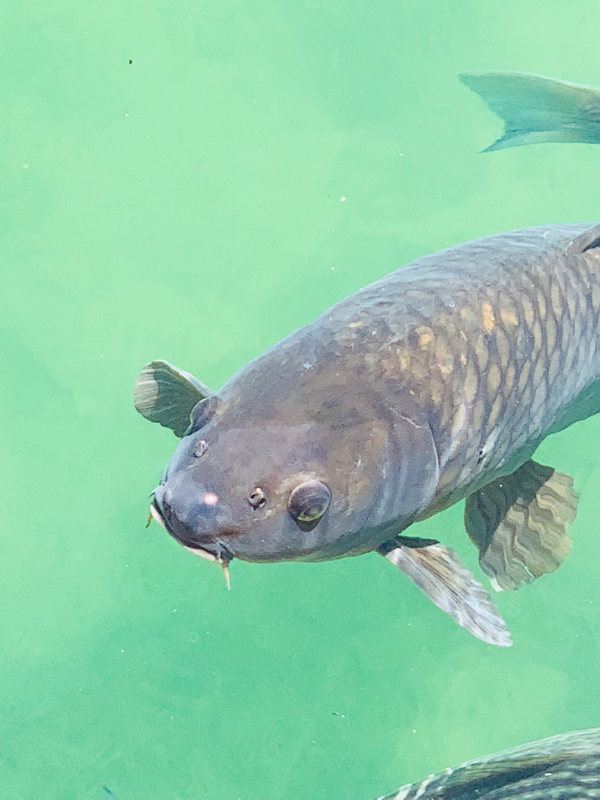 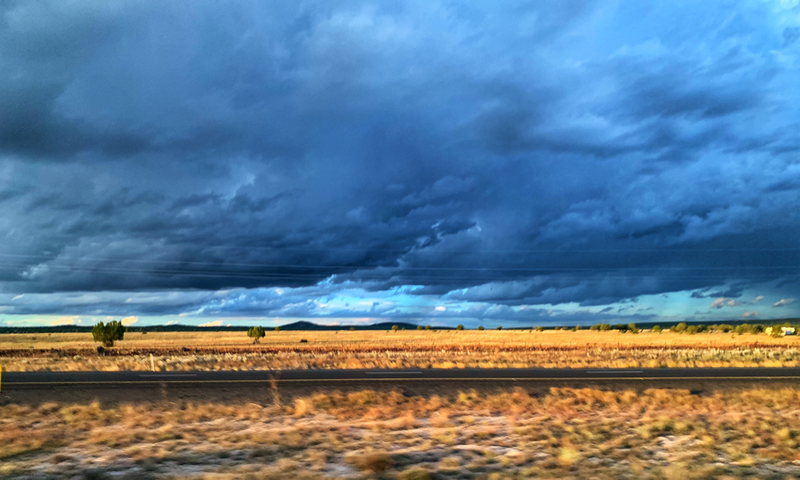 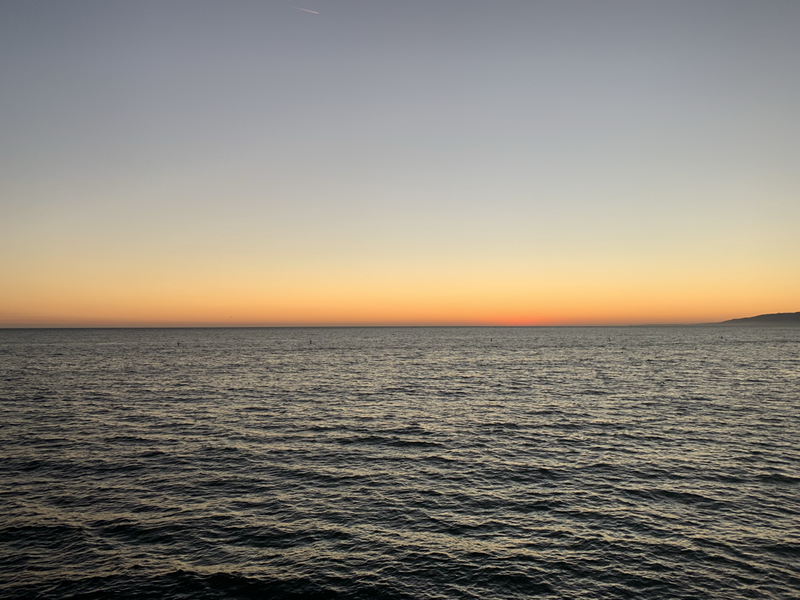 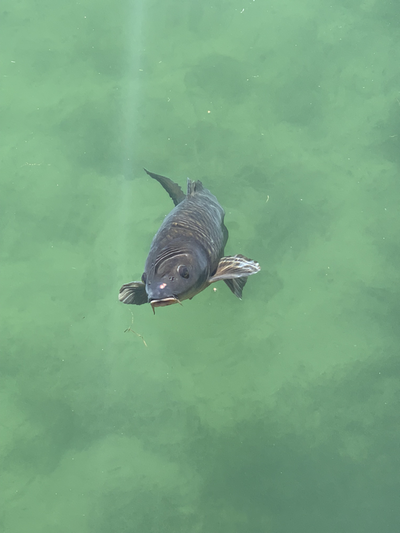 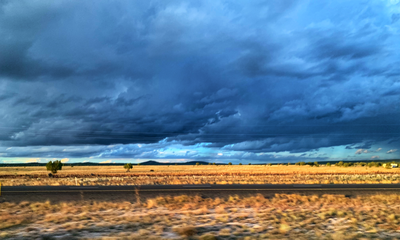 I do hope that you have enjoyed reading this blog as much as I have enjoyed relaying our adventures and capturing the many memories we have made. 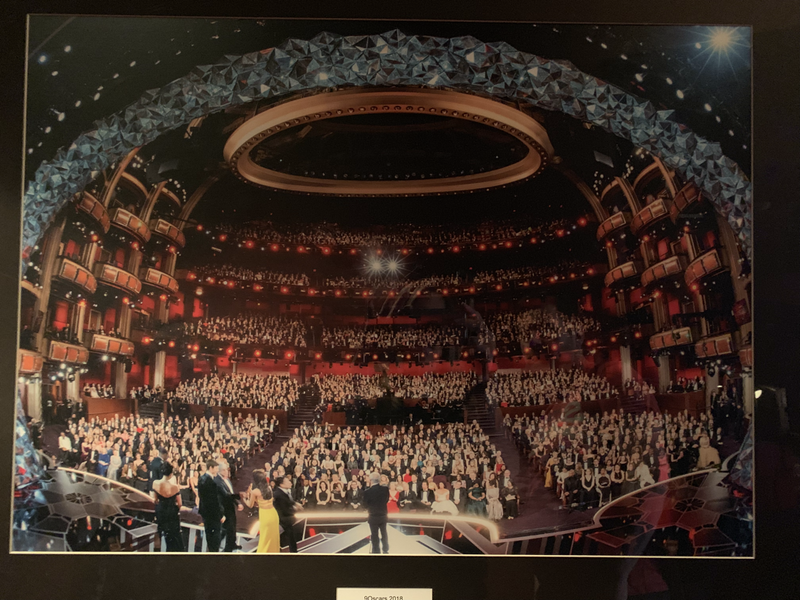 Thank you again to all involved.